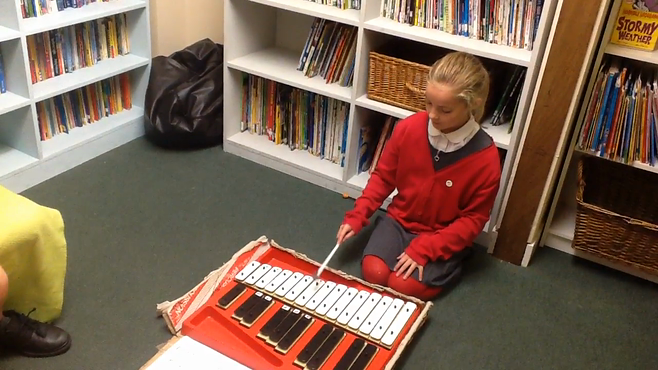 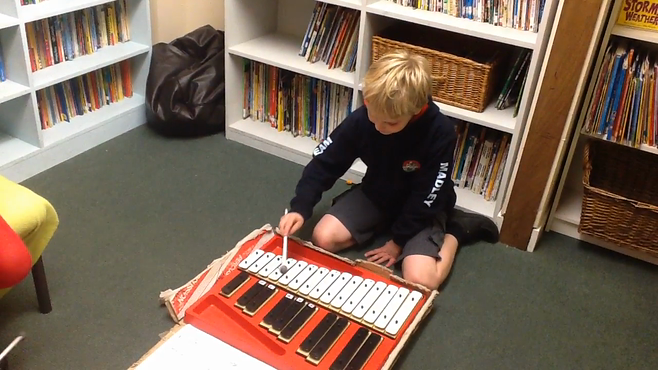 In music, Class 5 have been using the glockenspiels to play Lullaby and Hedwig's Song. 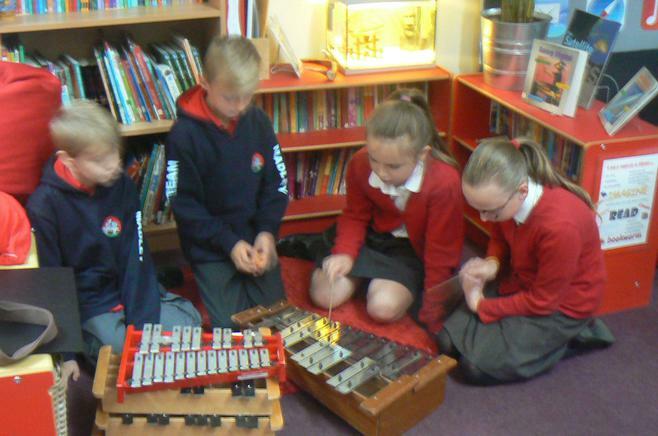 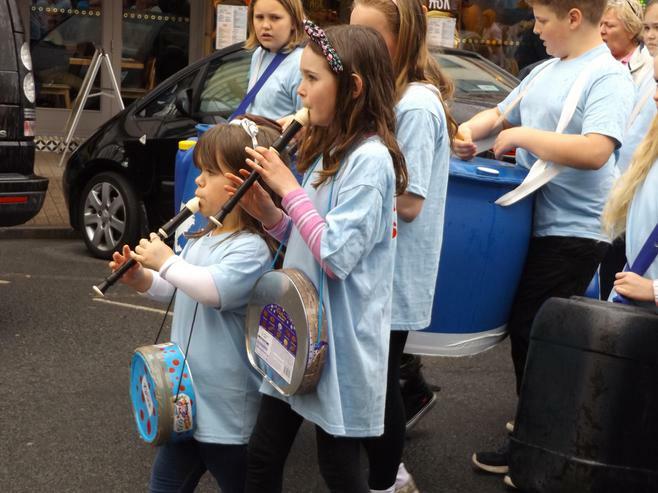 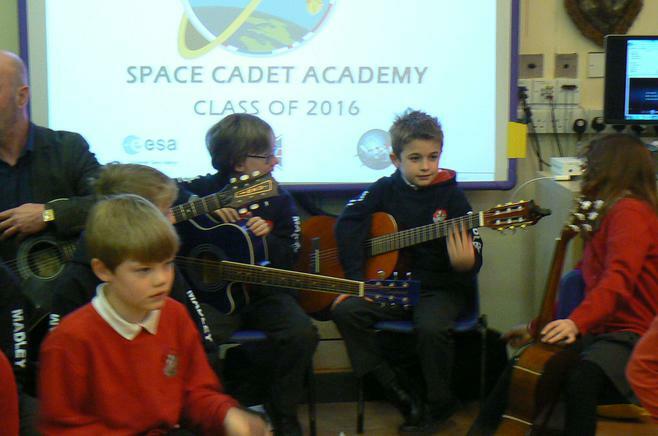 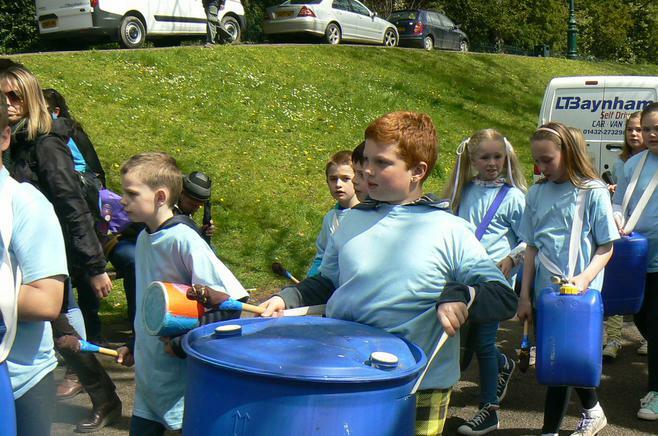 Here are some of the children playing the songs. 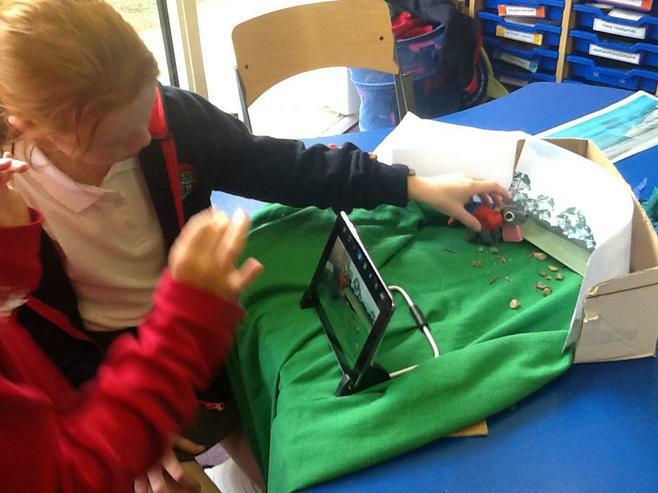 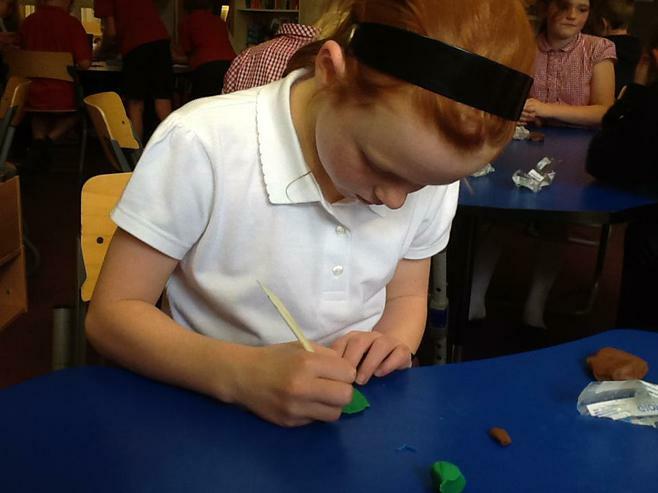 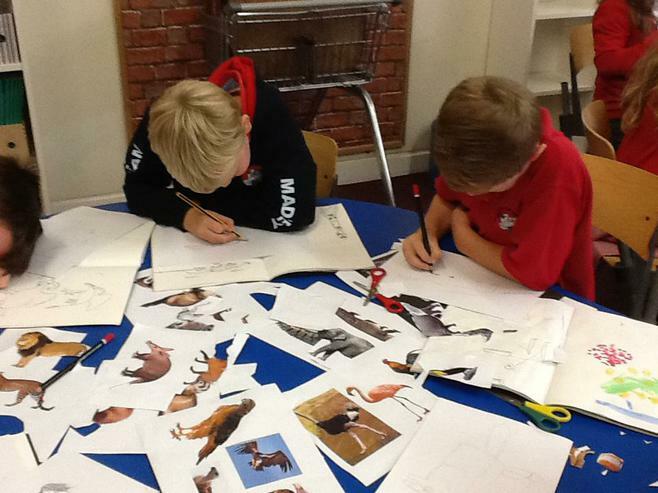 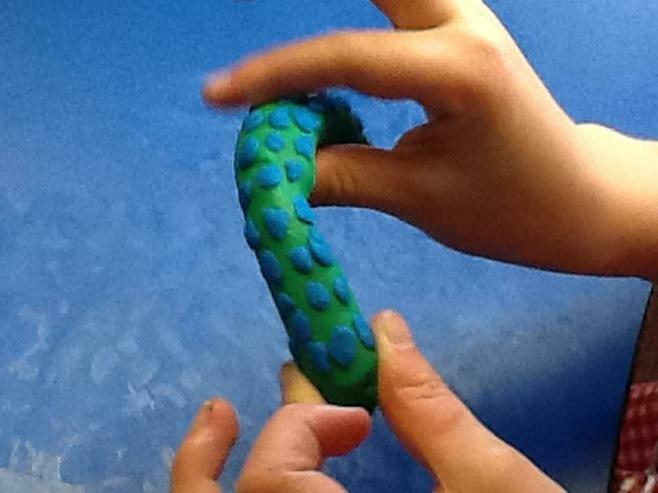 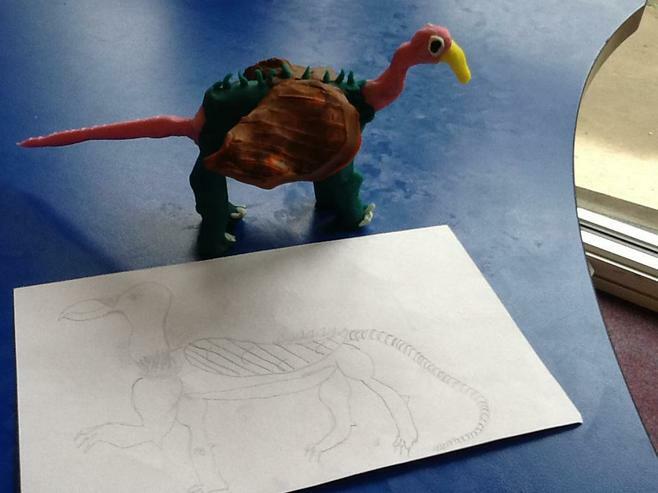 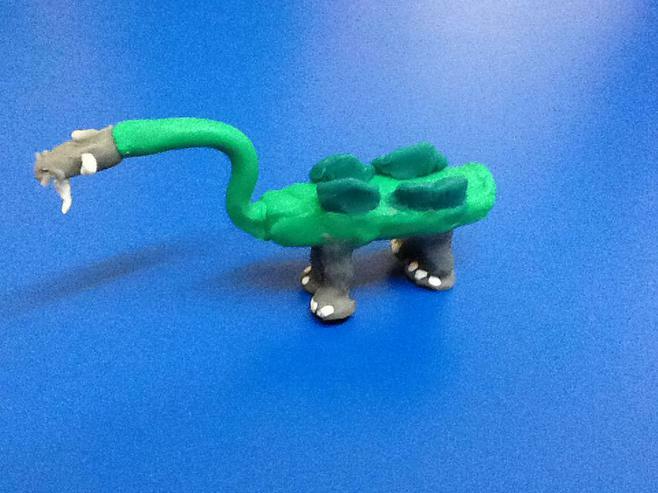 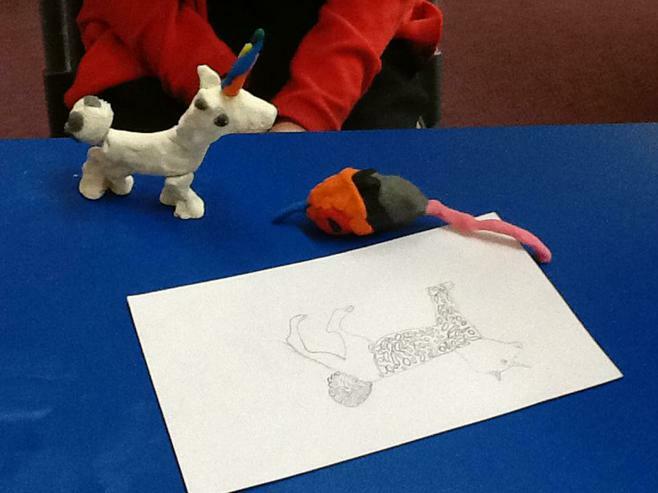 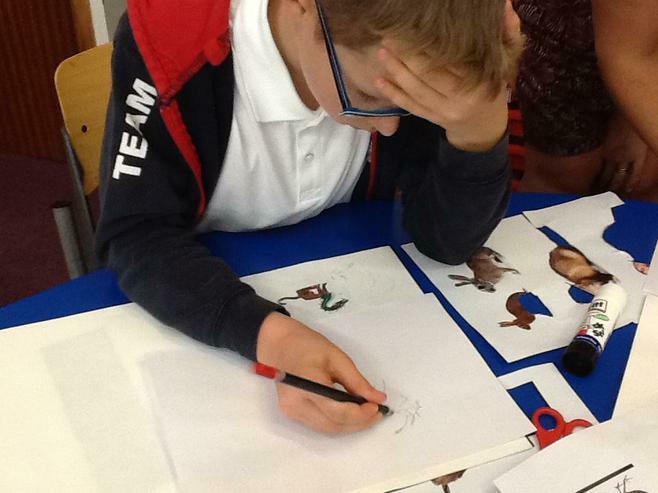 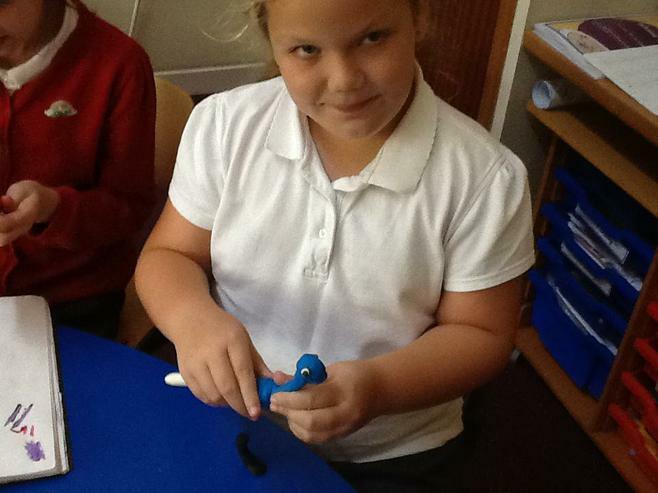 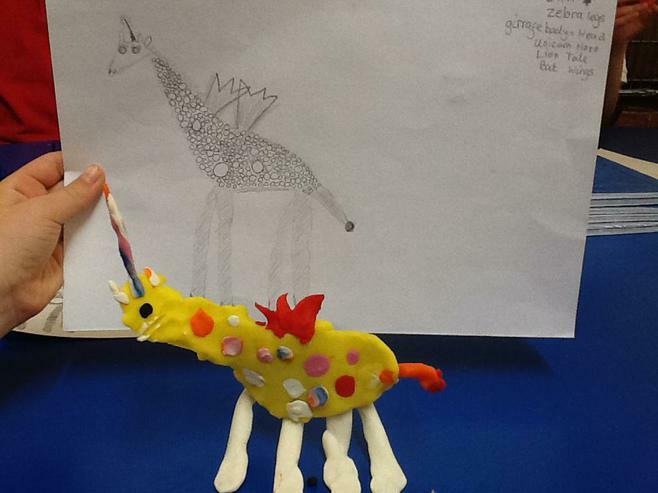 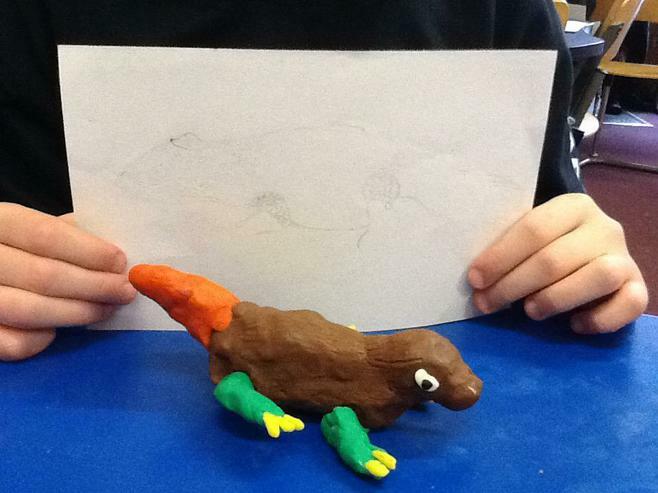 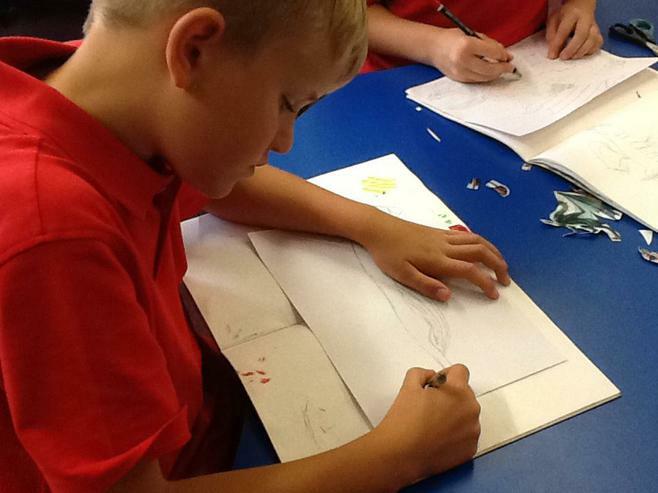 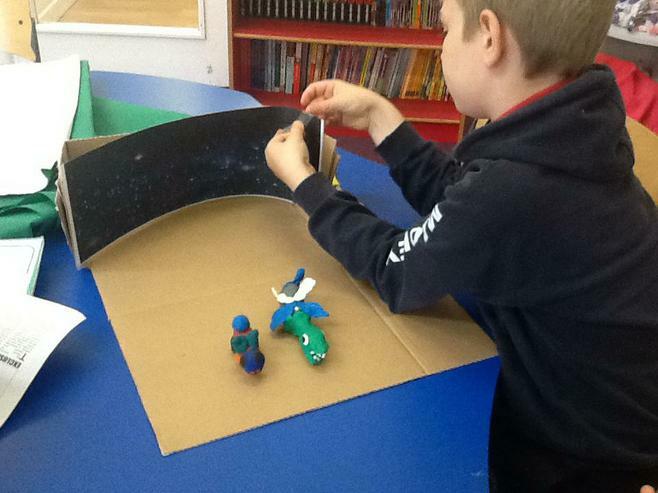 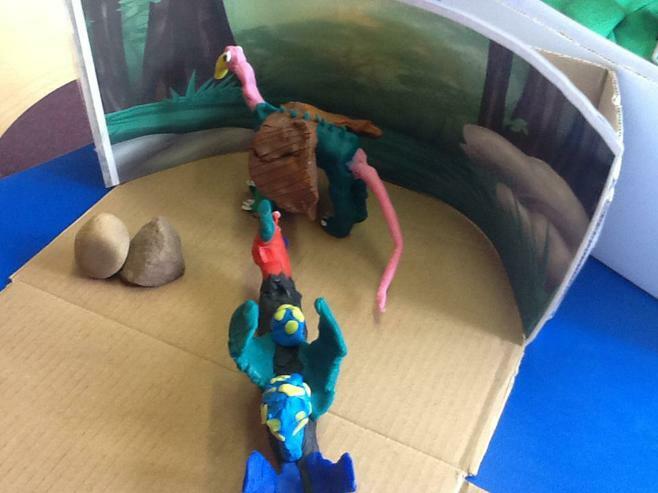 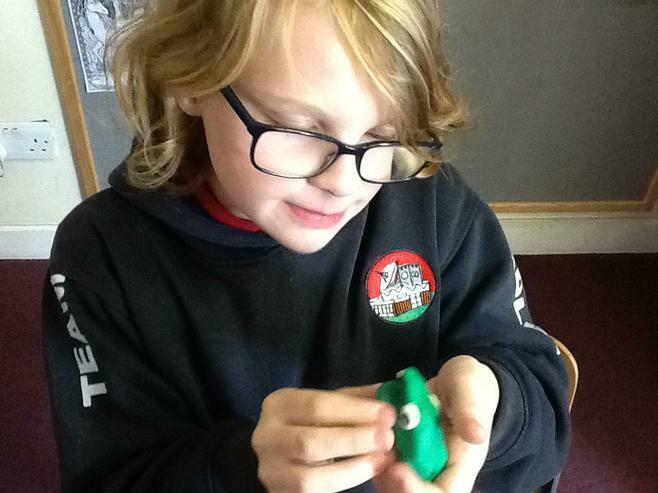 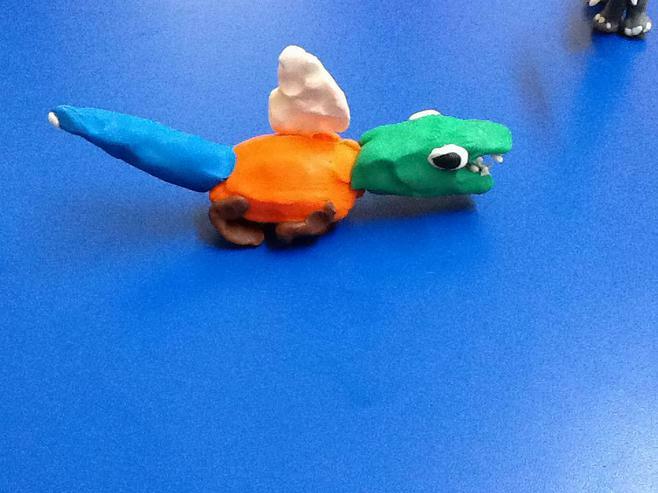 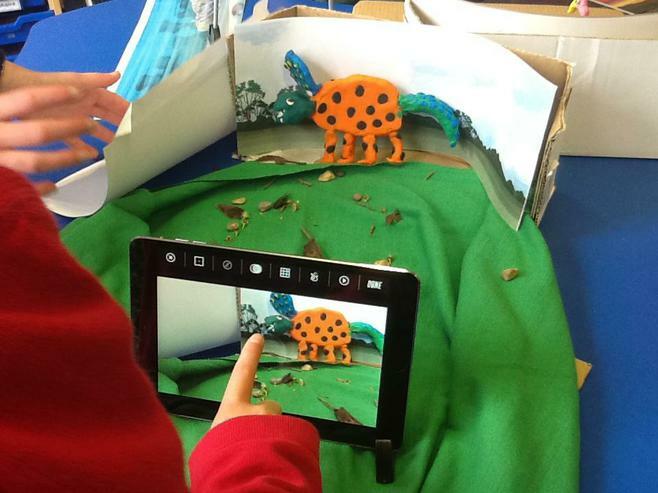 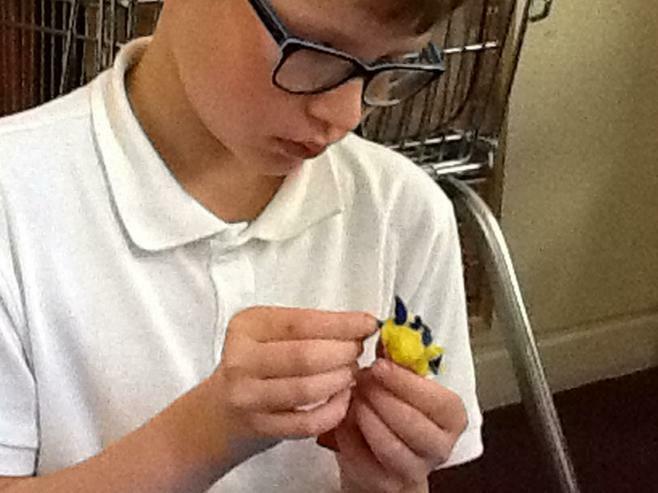 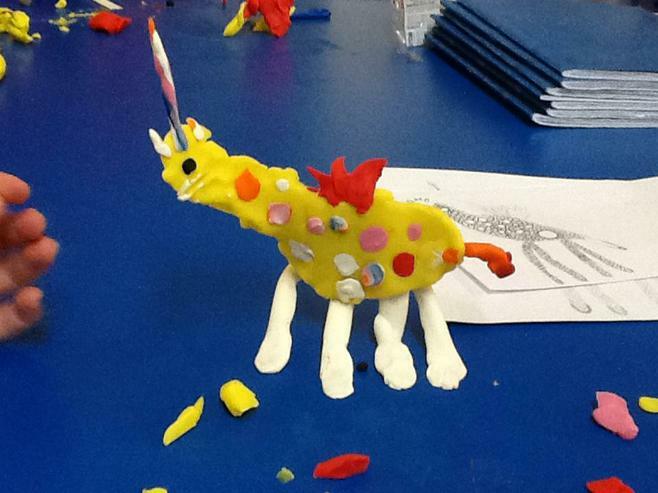 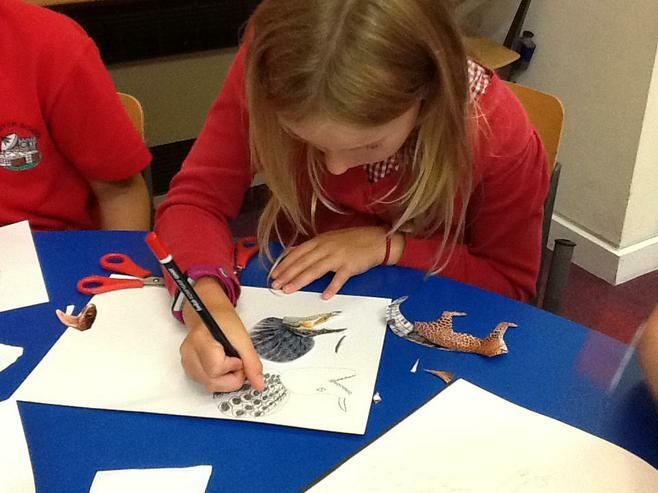 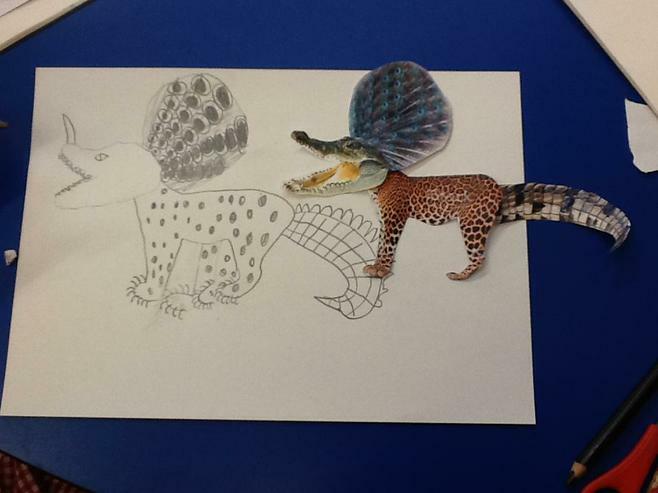 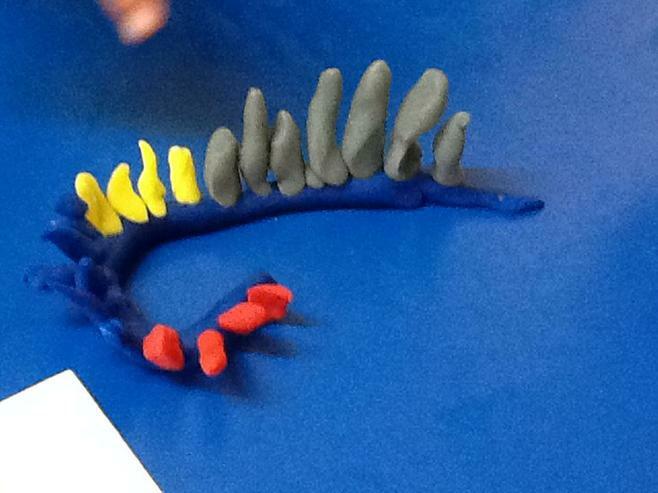 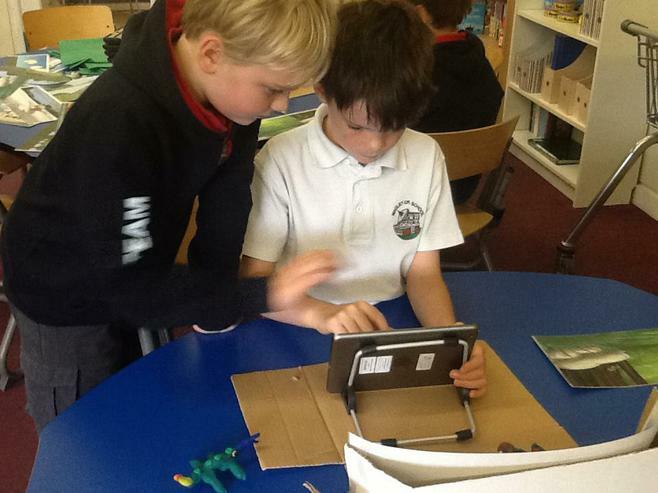 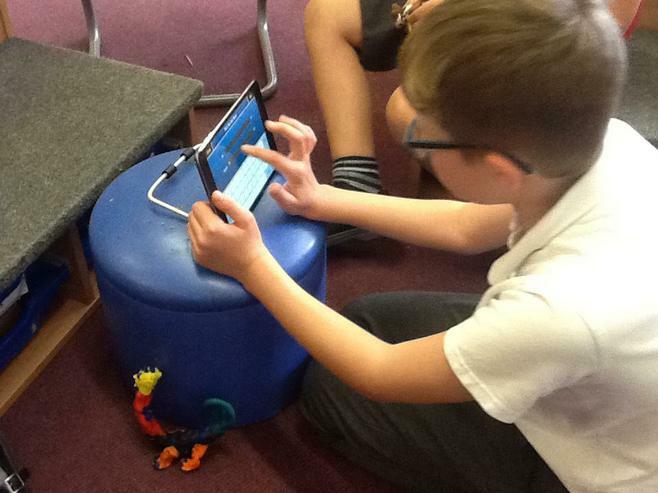 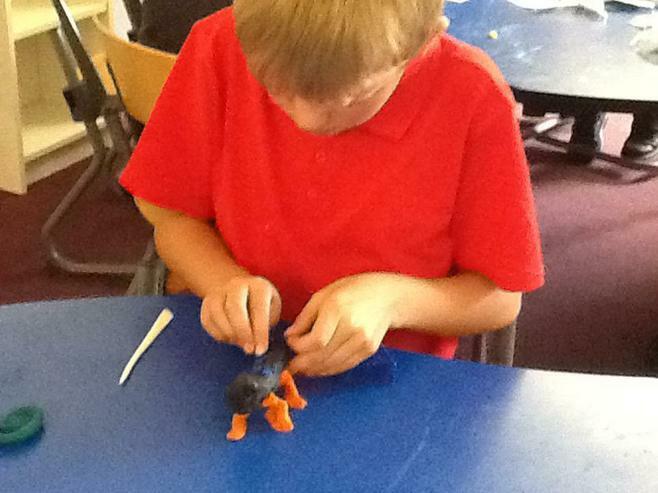 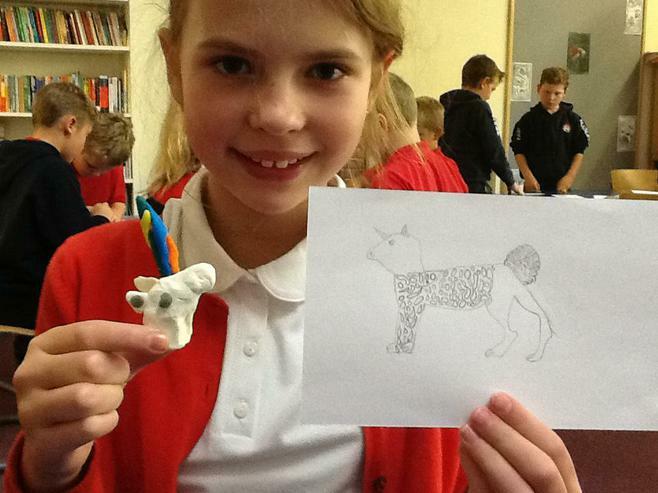 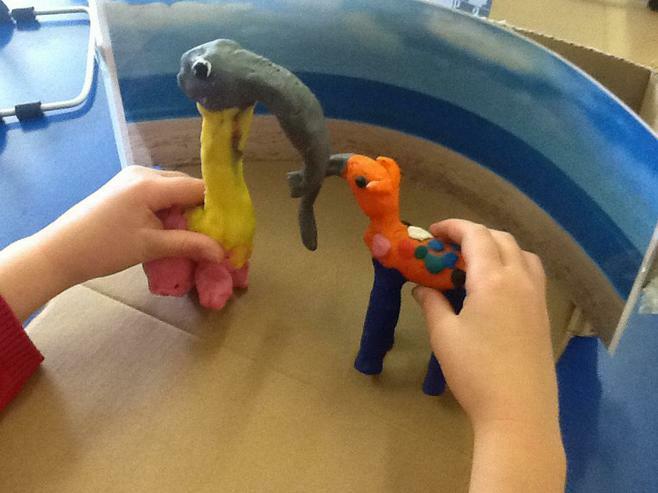 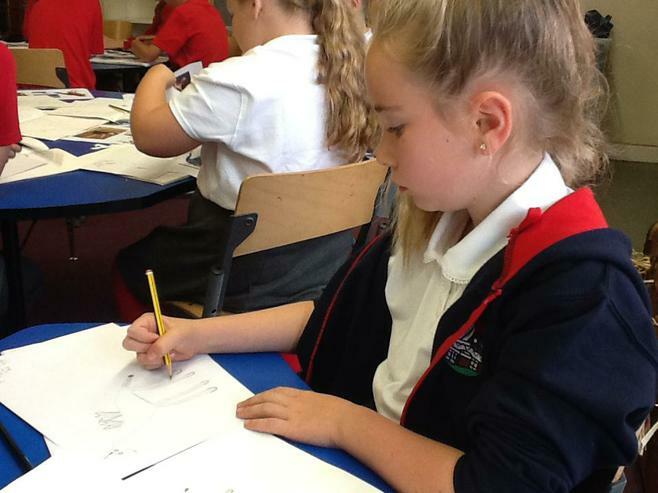 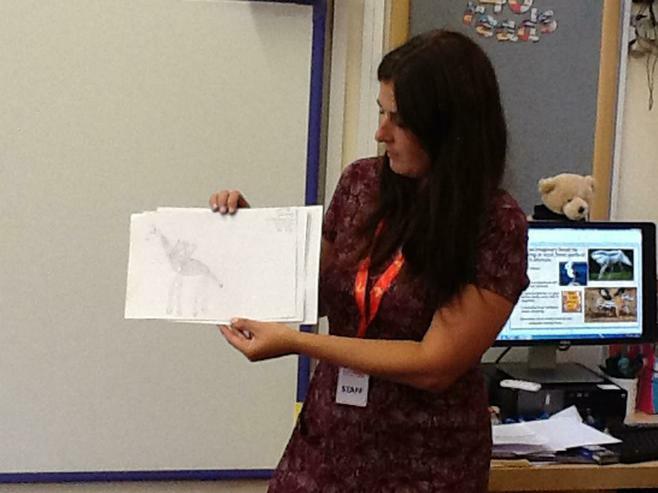 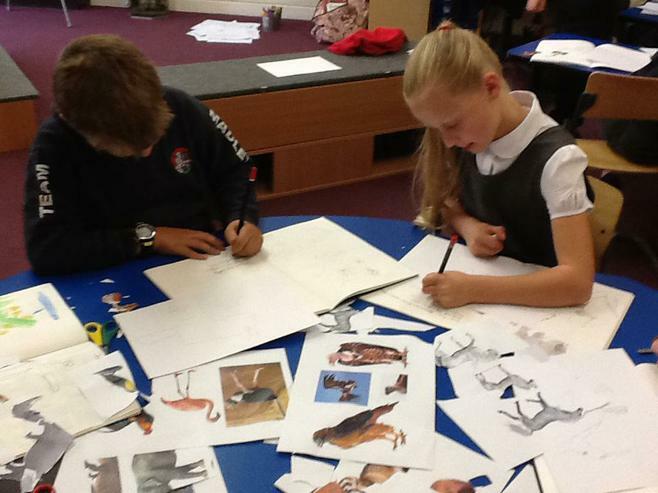 We had an animation workshop to bring our model mythical creatures to life. 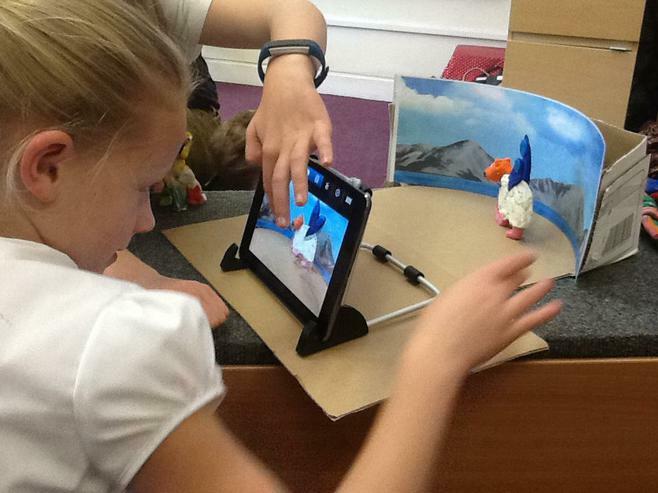 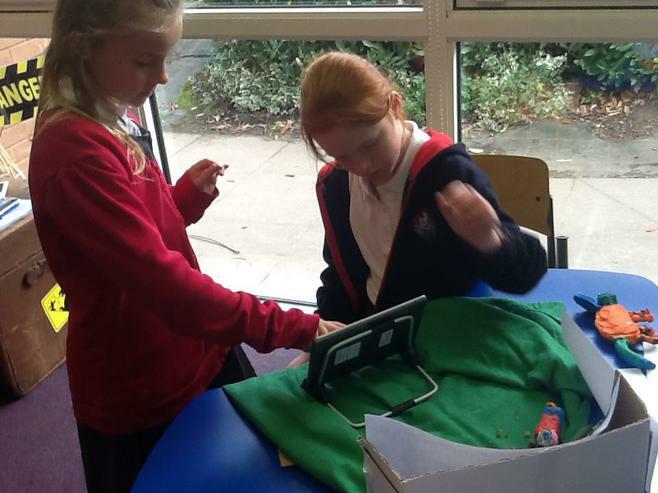 We learnt how to move the models using the smallest of movements, how to photograph frames and about how to add music, and voice overs. 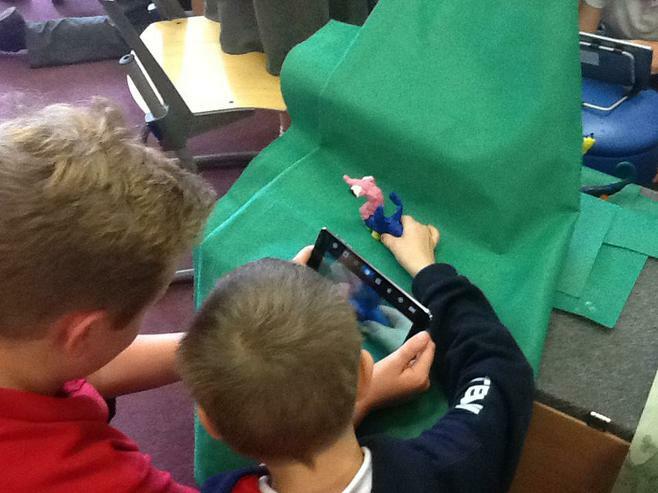 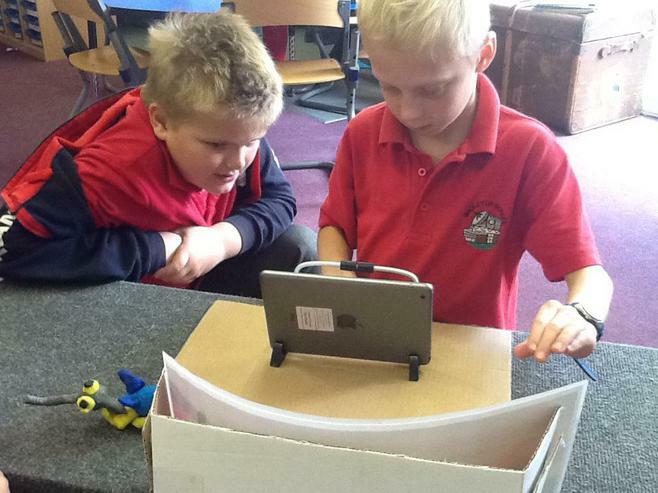 We will do more work on our animations using the Lego movie app to improve the quality of our animations. 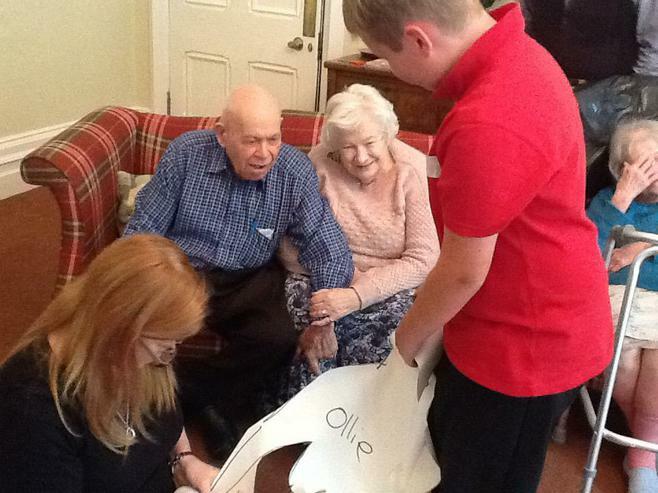 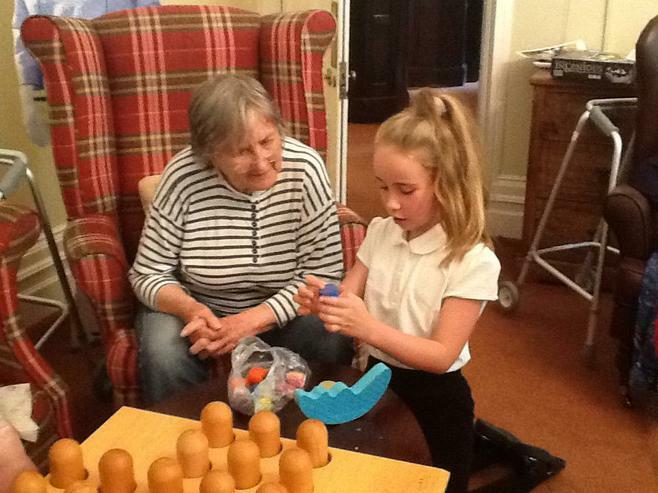 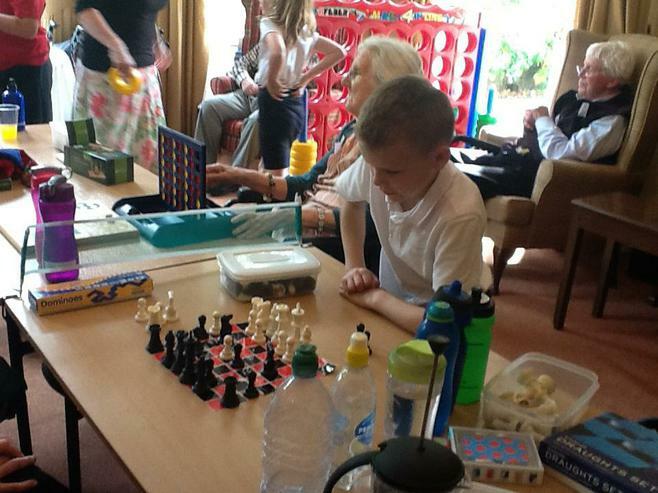 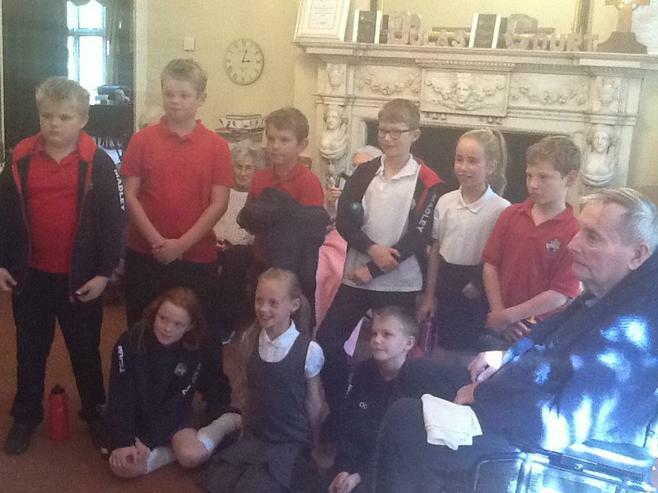 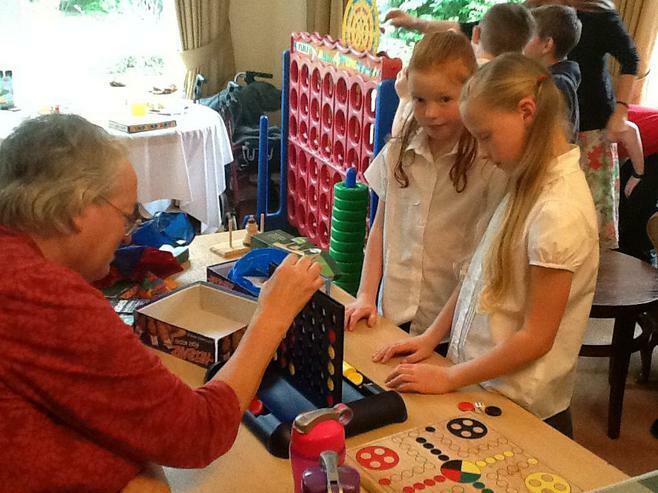 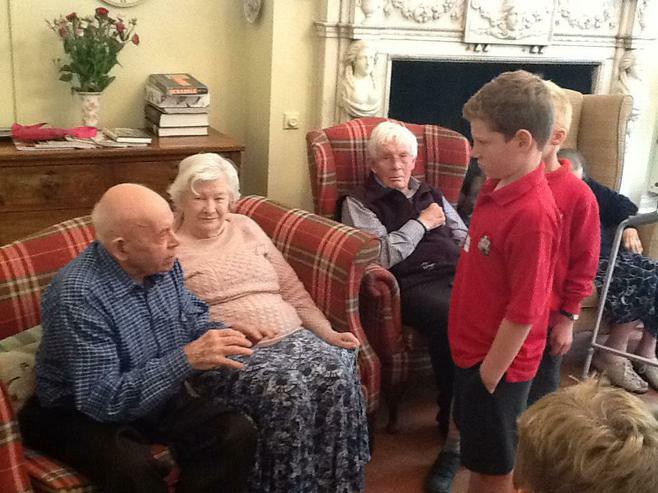 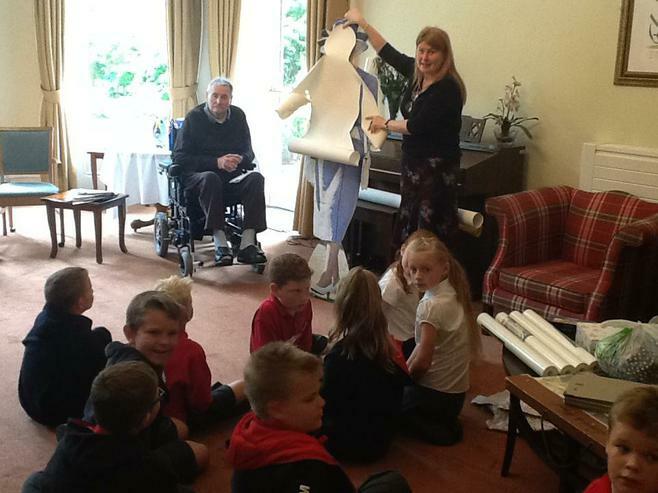 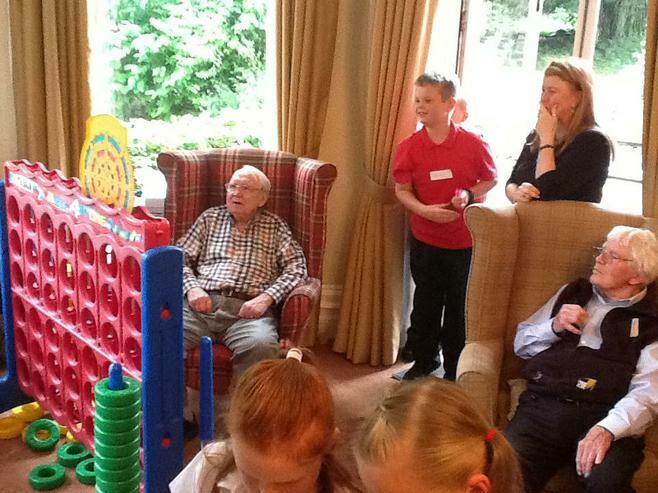 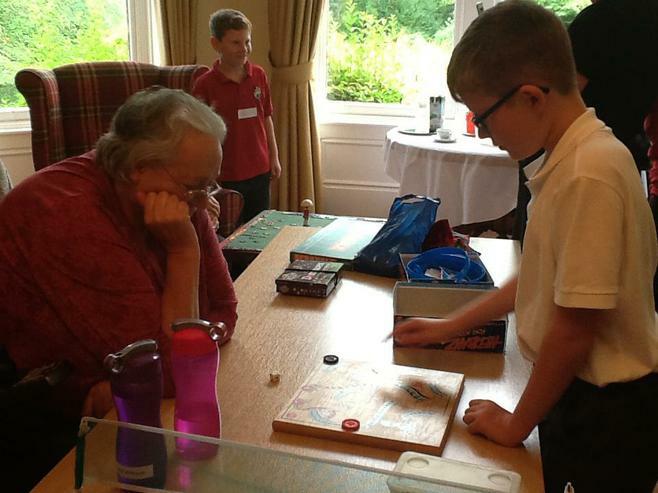 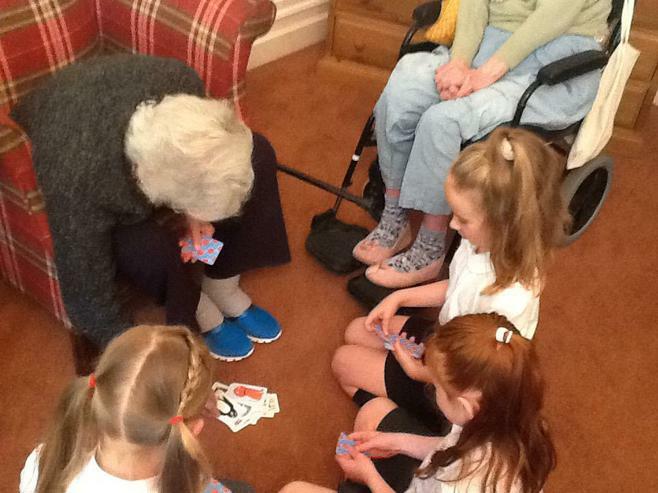 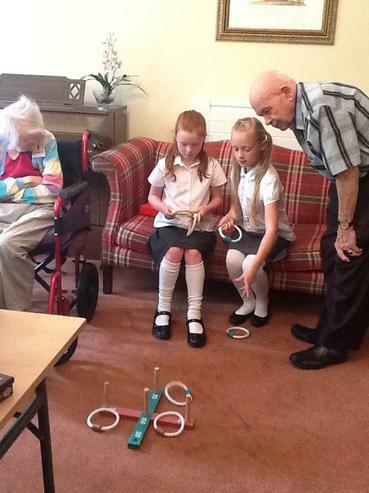 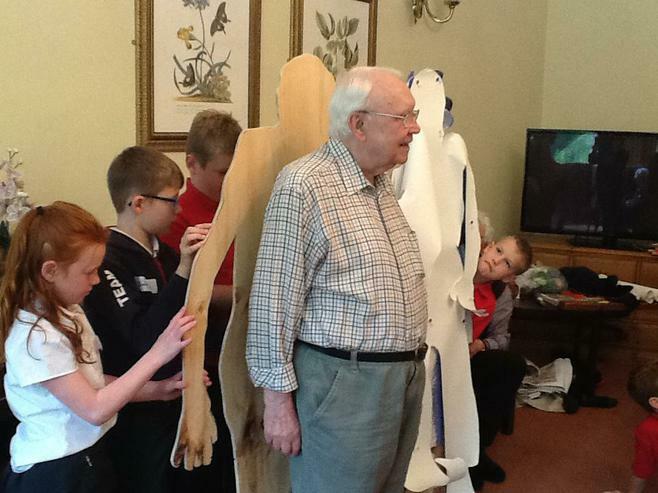 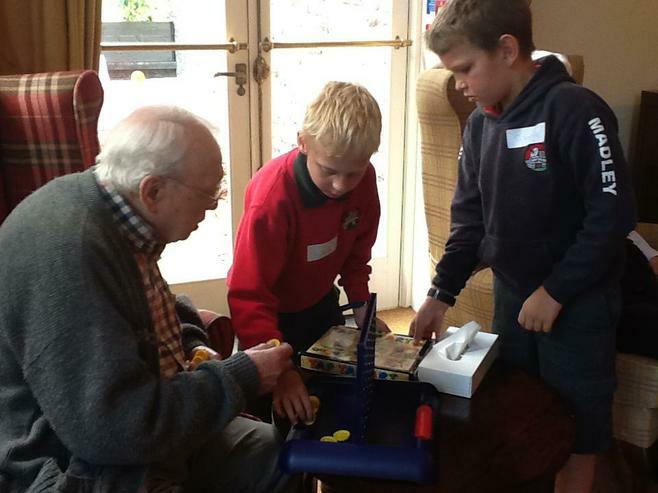 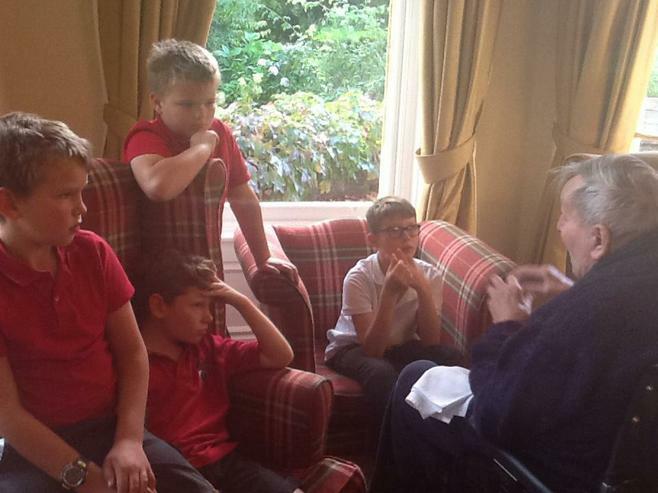 Some very lucky pupils in class 5 are having the wonderful opportunity of visiting the residents at Dulas Court each week. 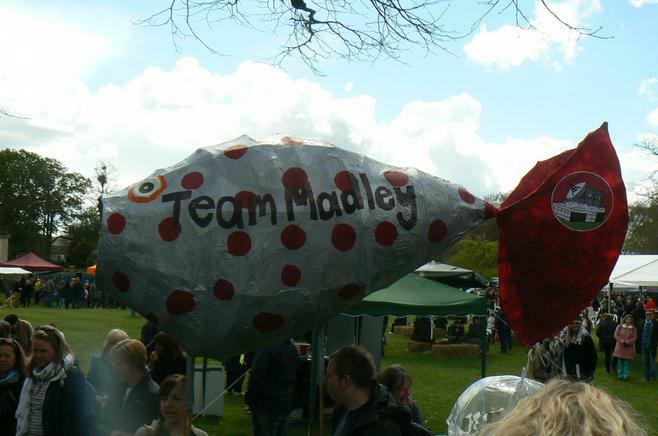 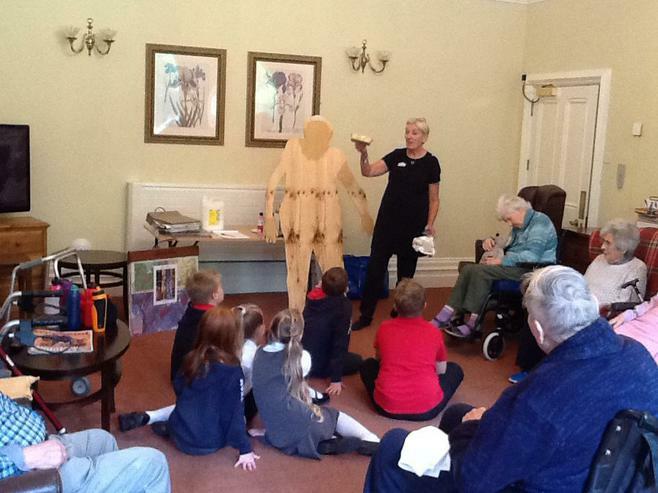 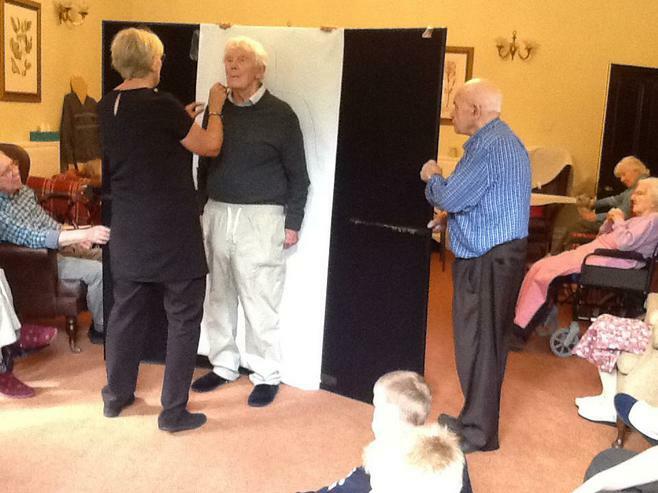 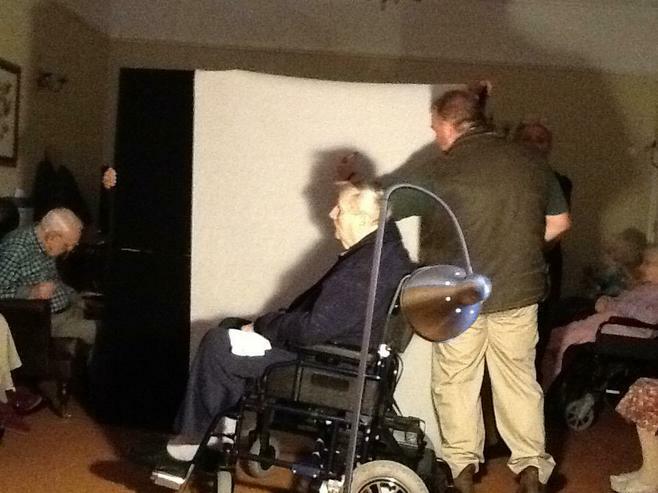 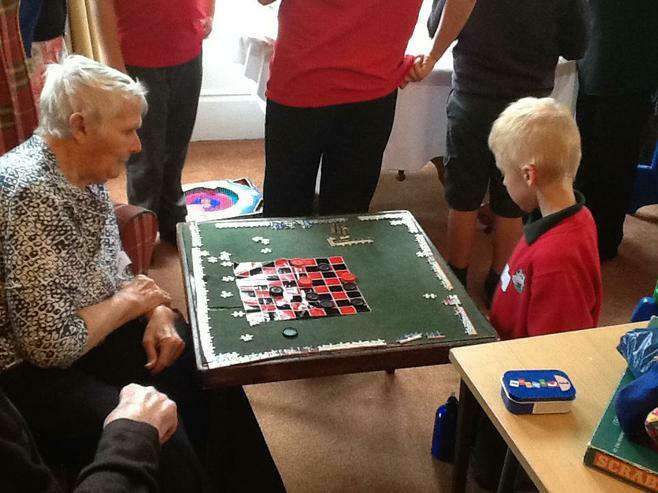 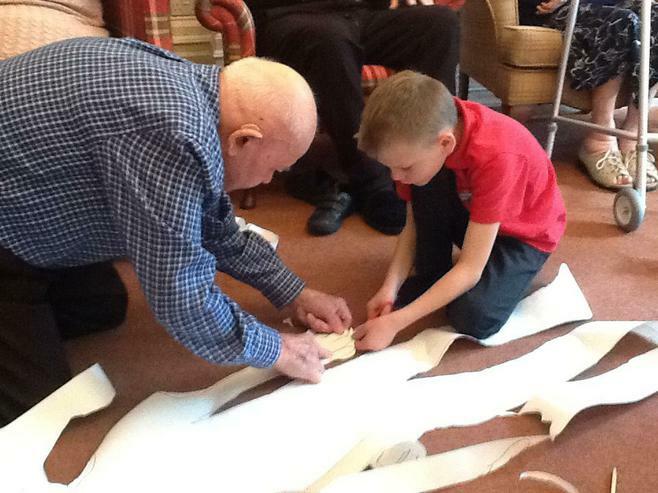 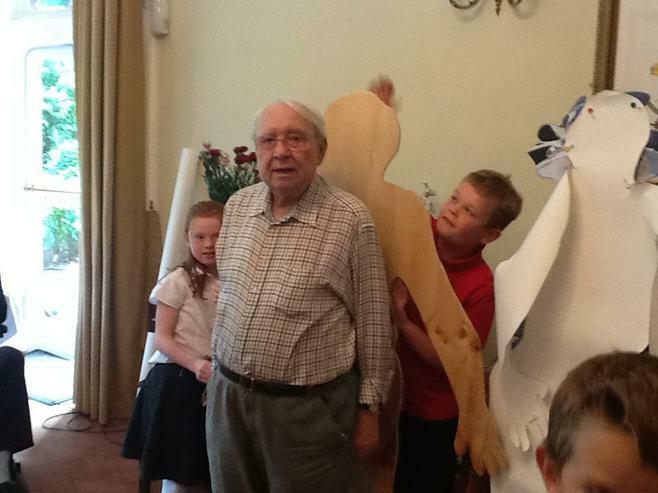 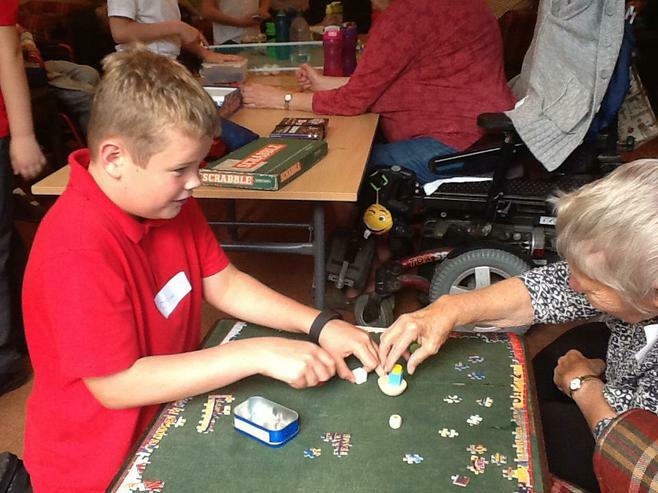 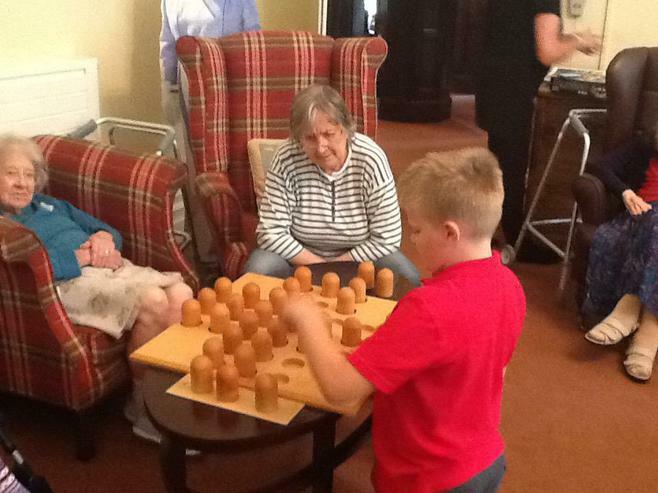 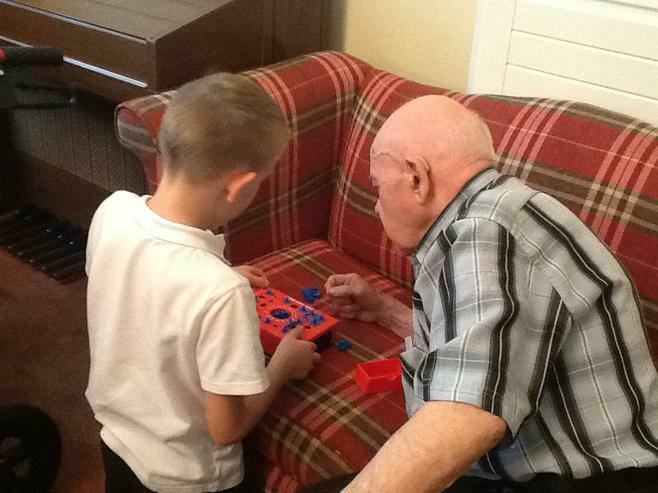 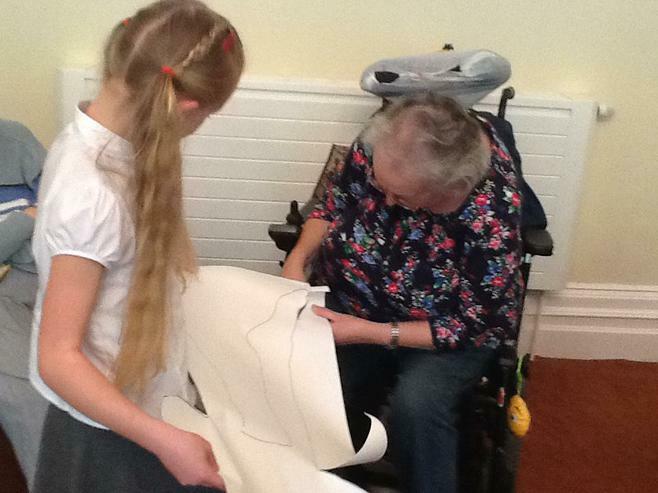 They have been able to engage in games, art activities and listen to stories about the lives of these interesting people. 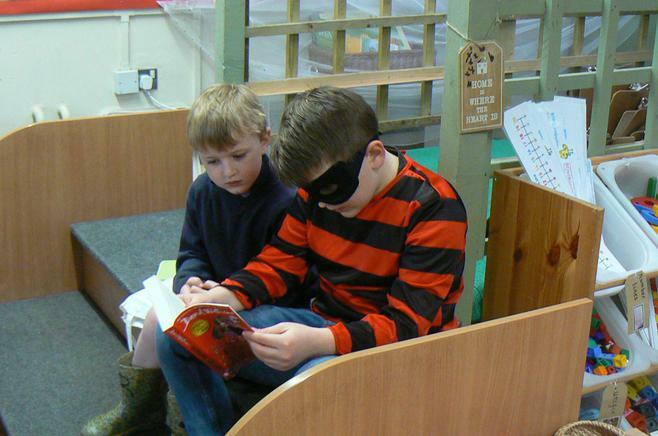 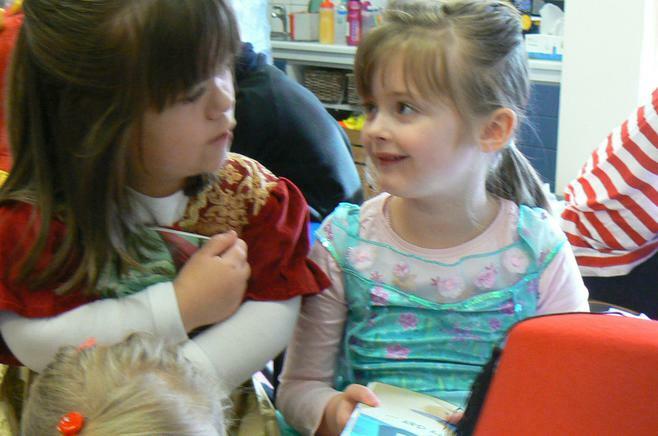 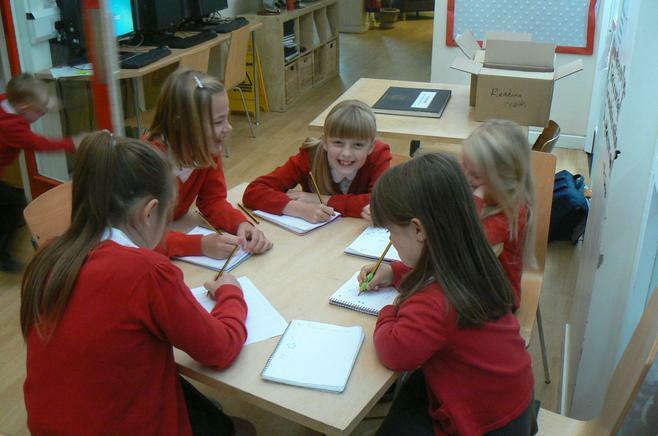 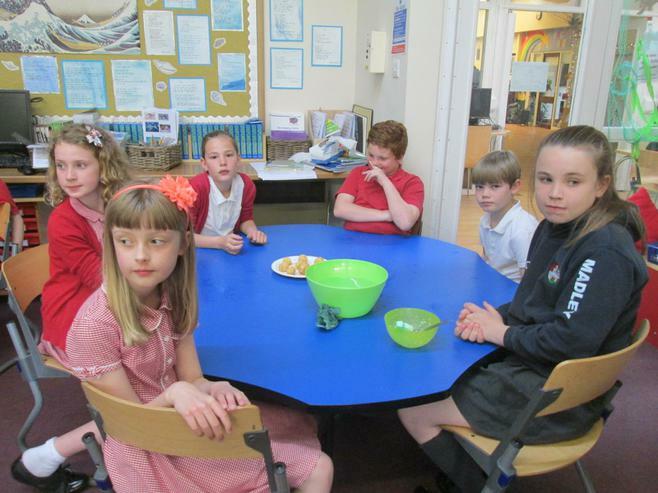 The children look forward to their visits each week. 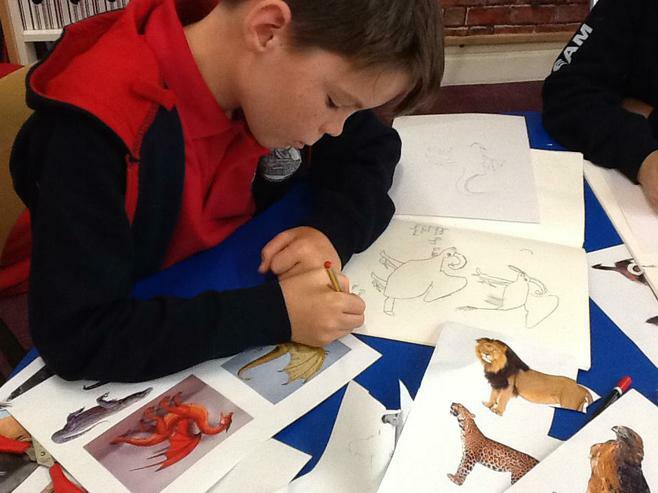 We have decided to turn our mythical creatures, that we have designed in art and written about in our theme books, into animations. 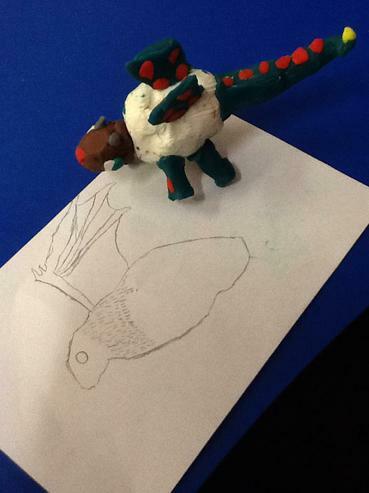 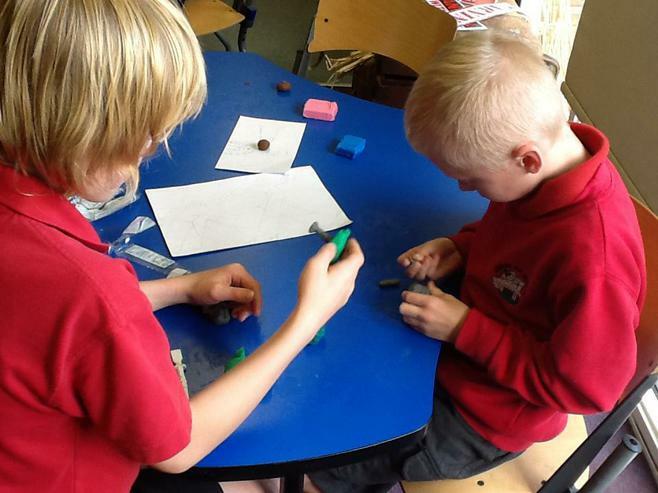 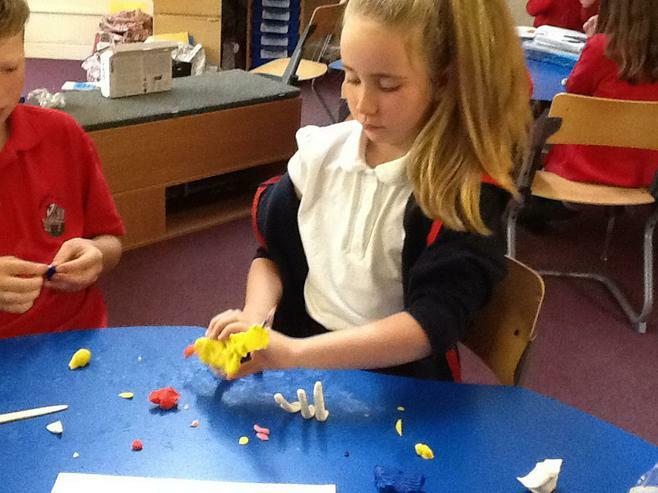 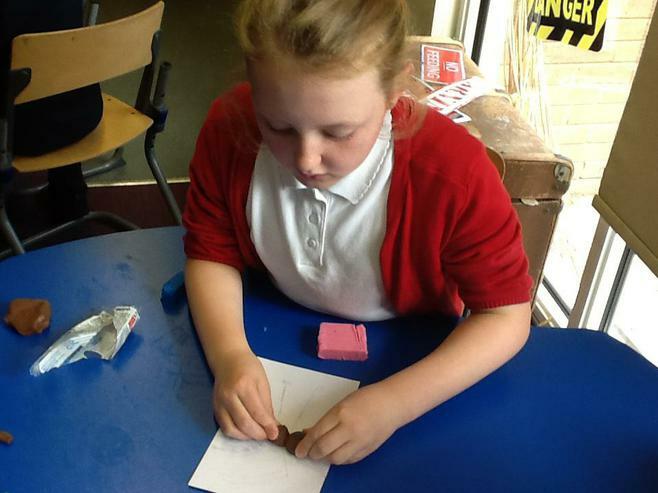 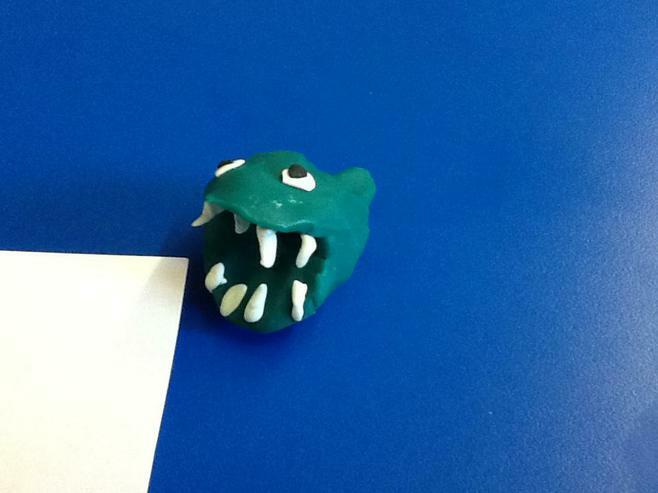 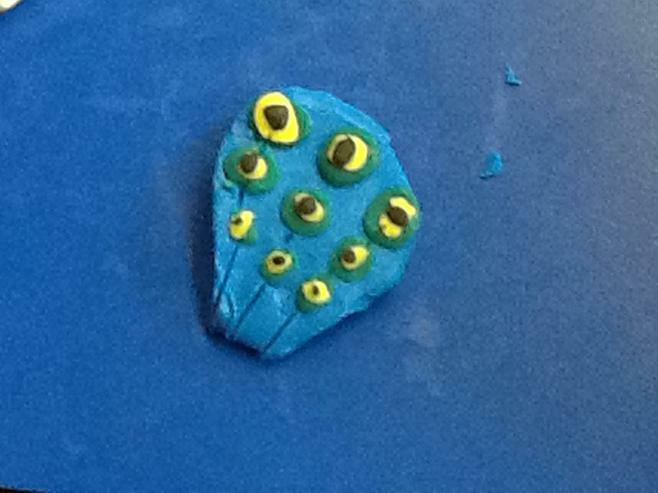 Before this can happen we have to make our creatures out of modelling clay. 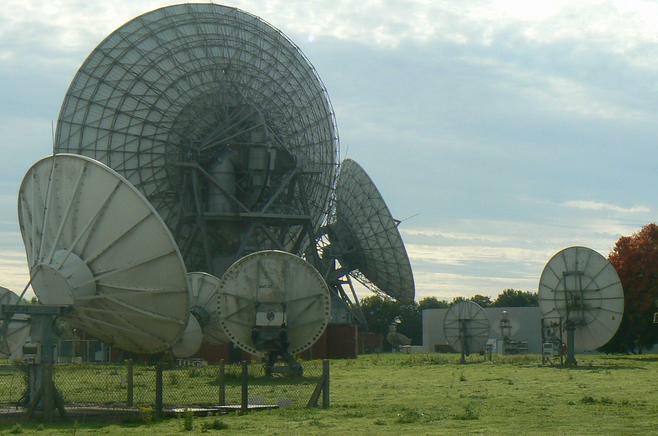 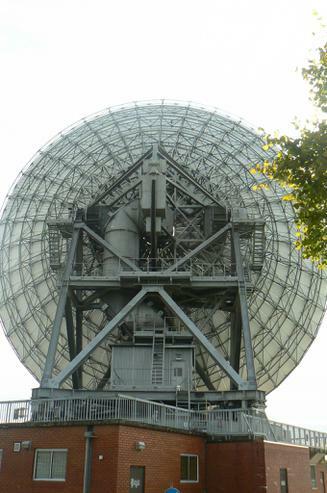 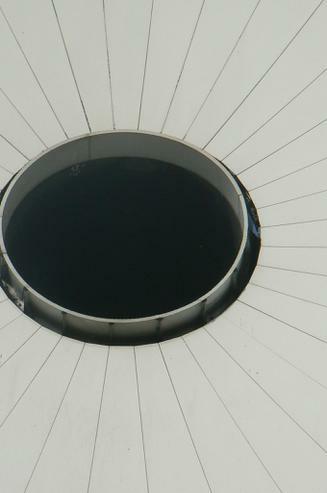 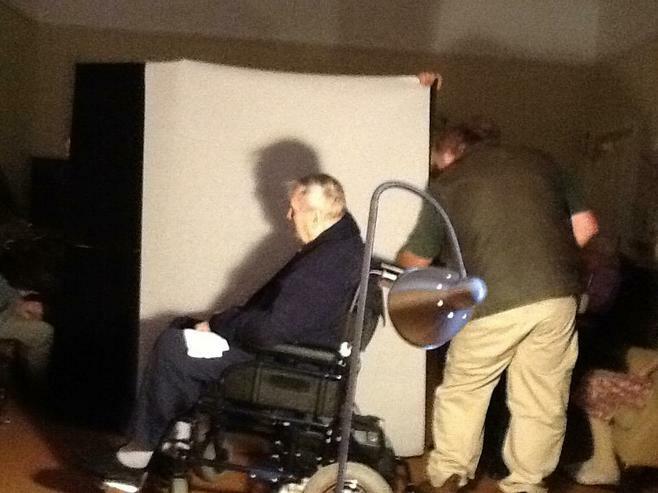 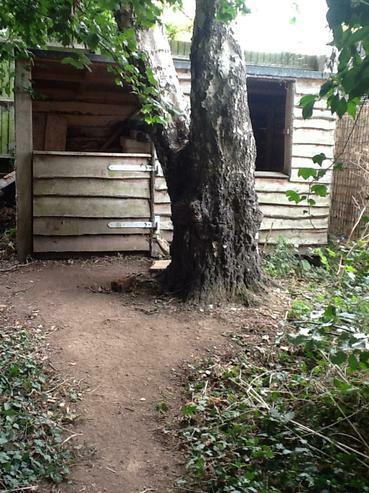 These photos show the work we have been doing so far. 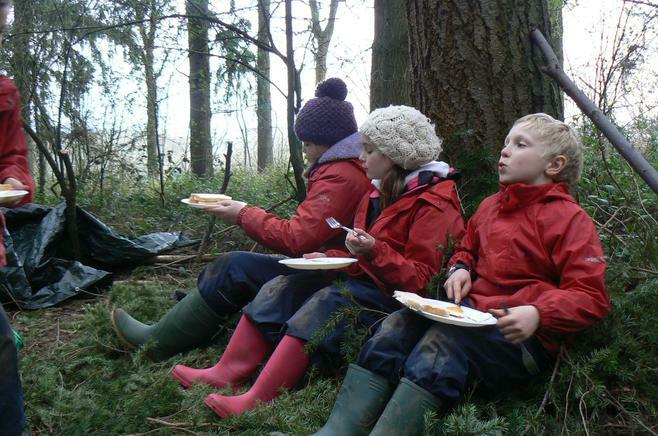 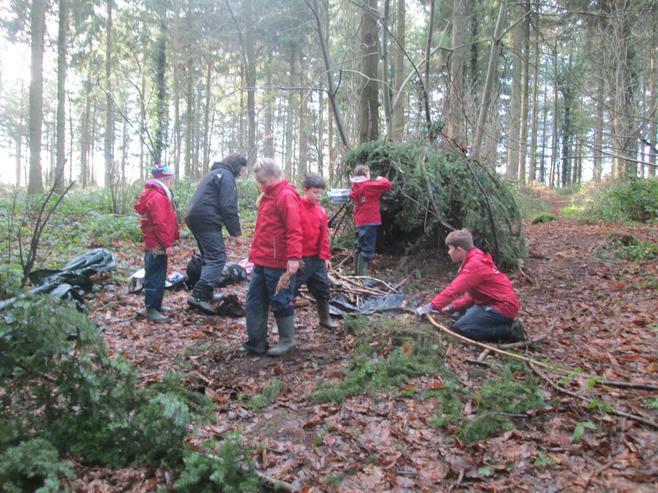 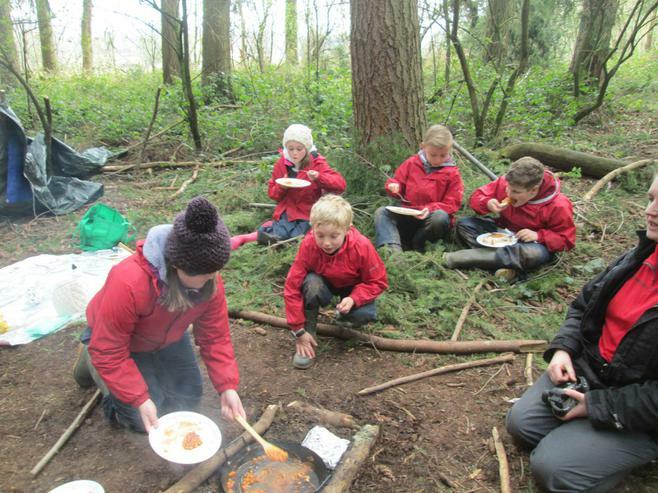 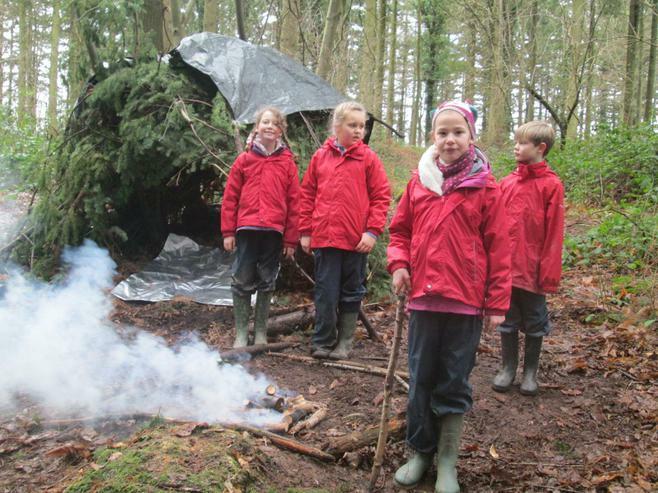 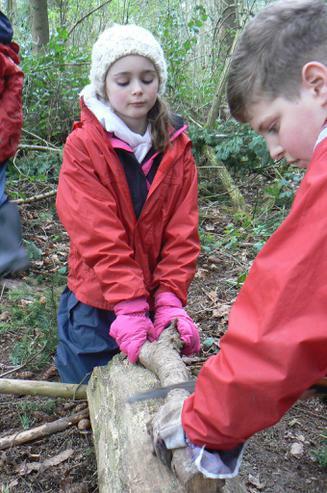 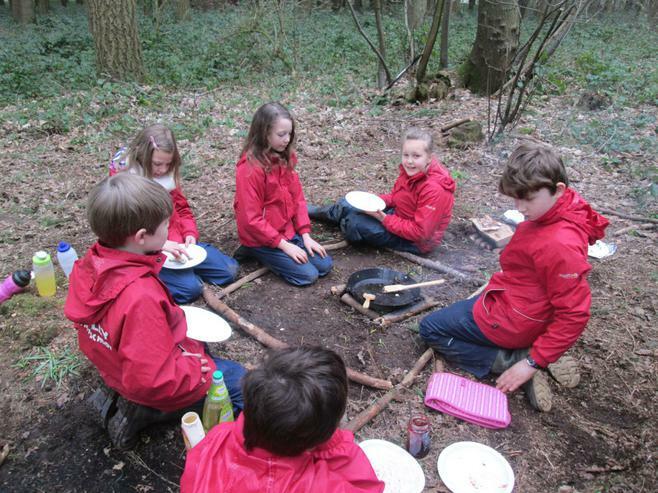 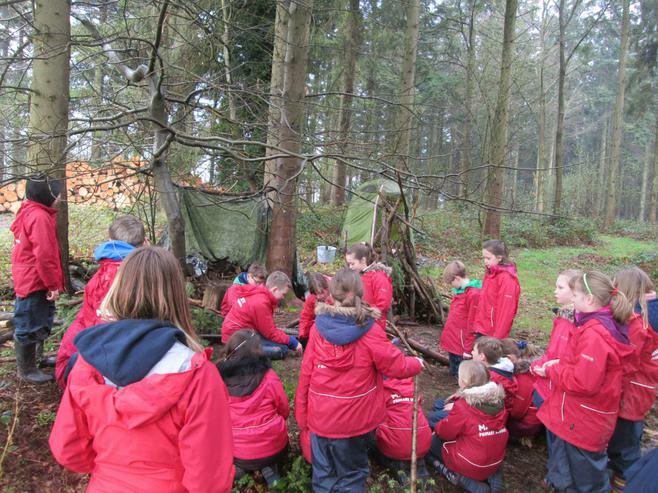 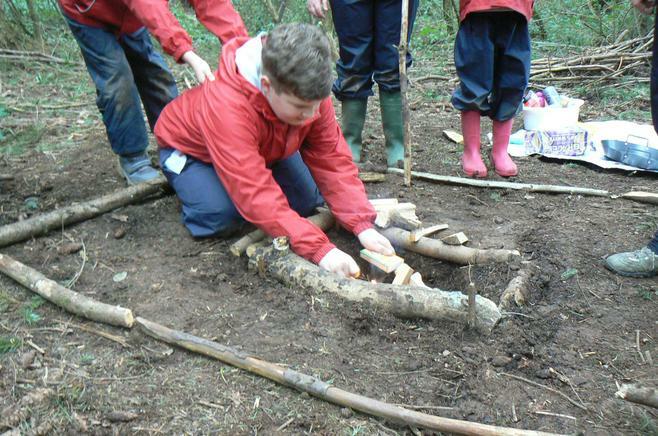 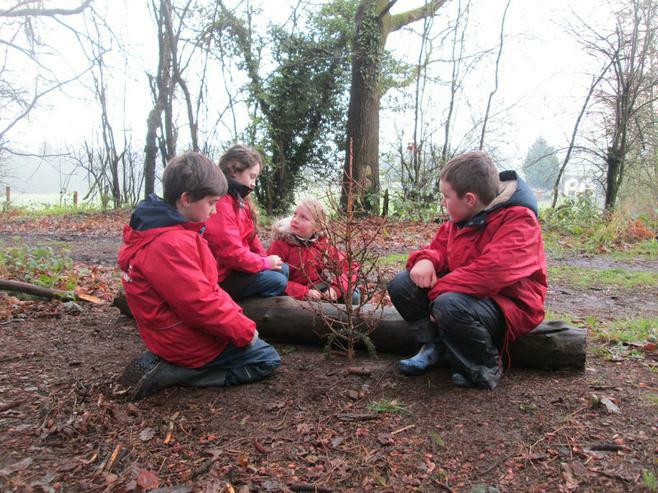 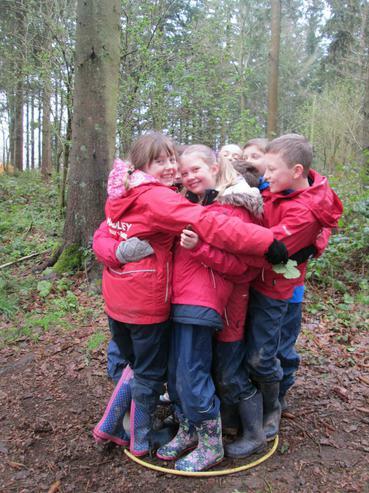 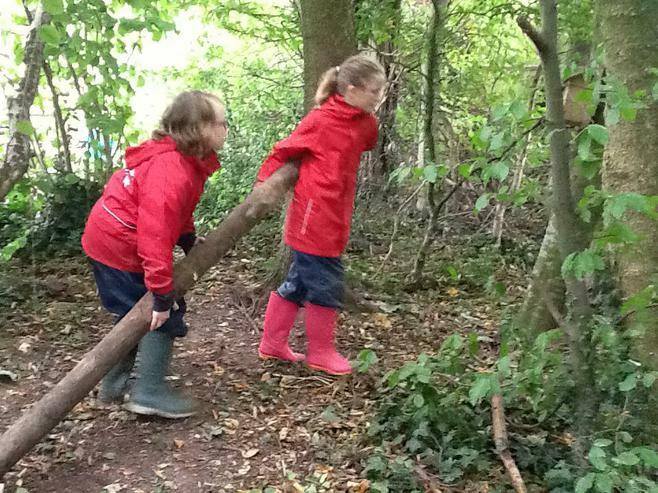 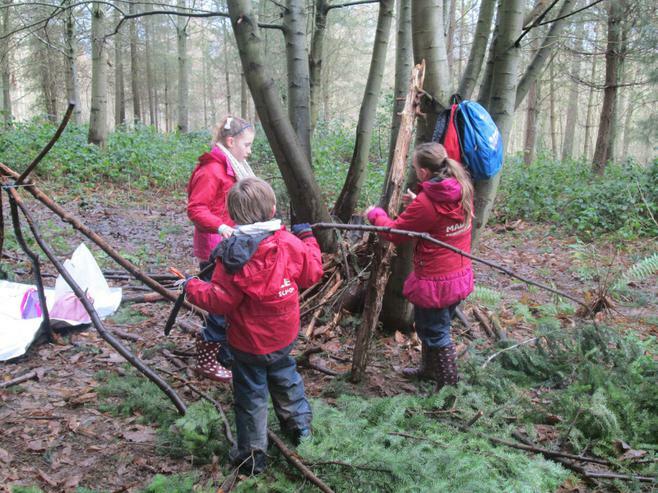 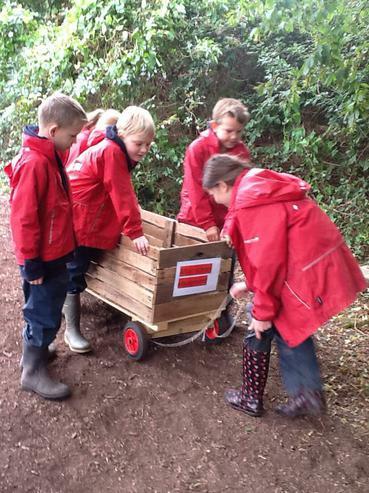 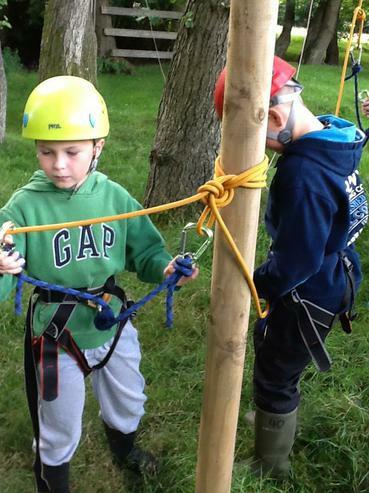 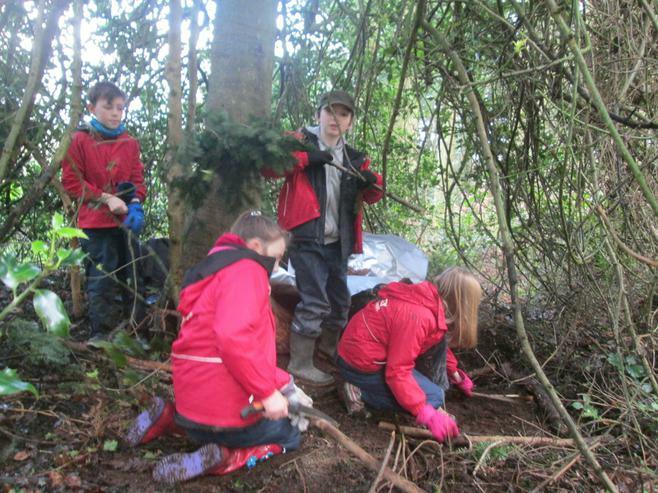 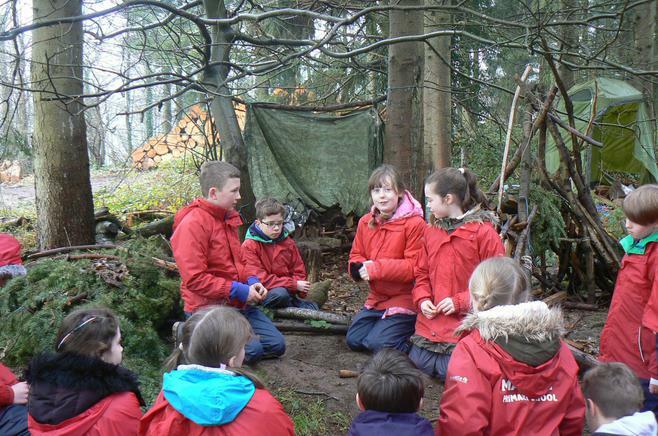 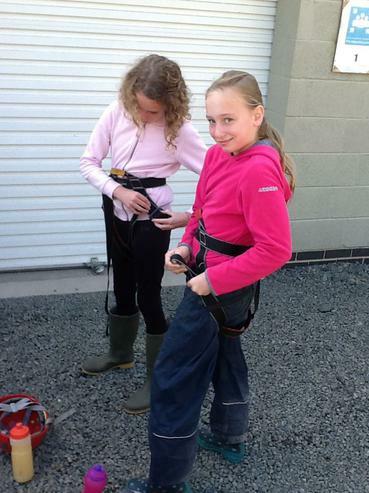 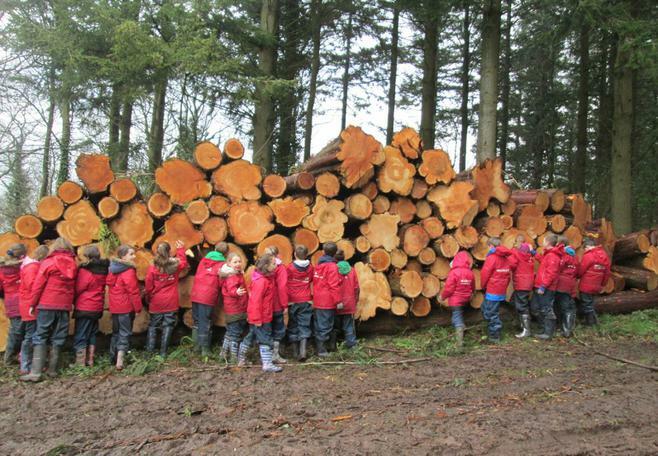 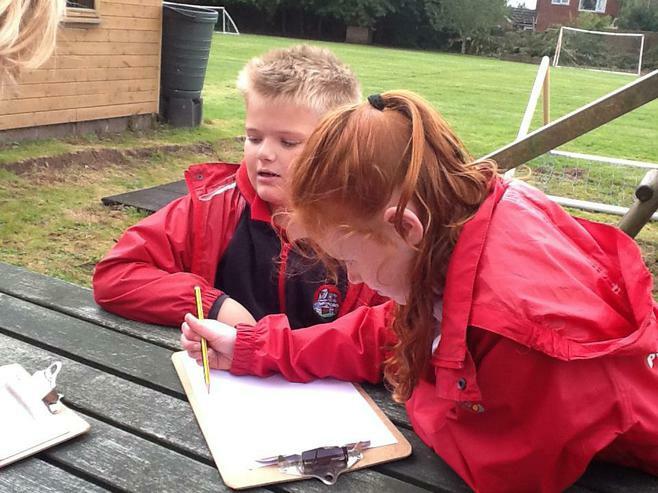 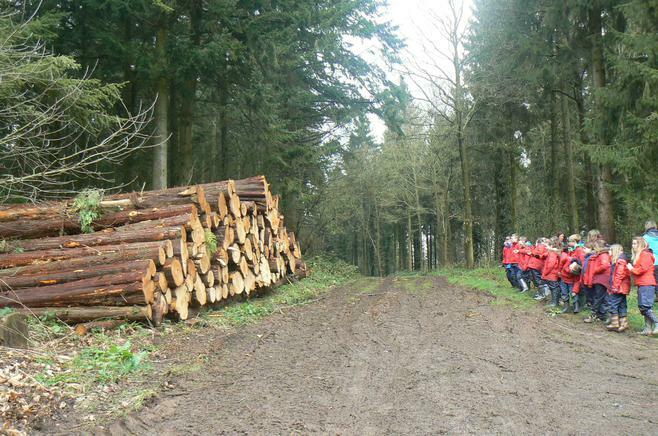 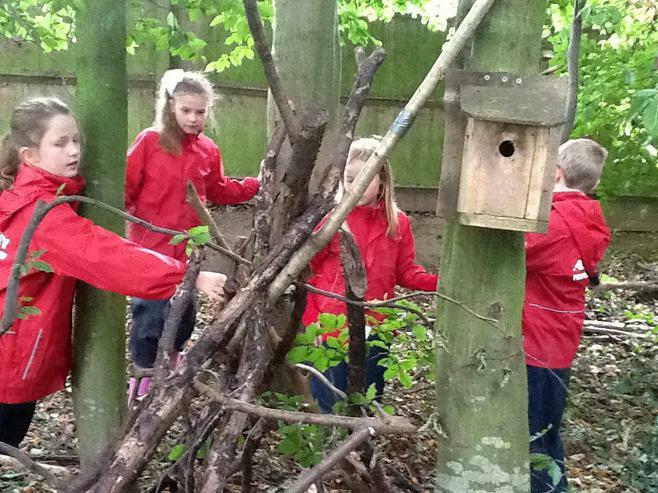 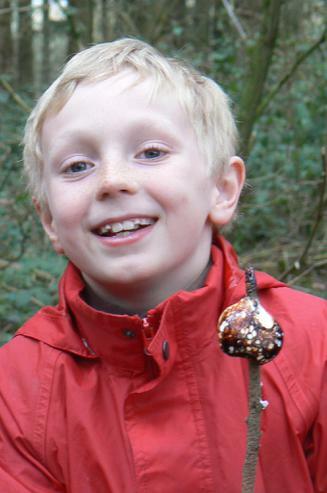 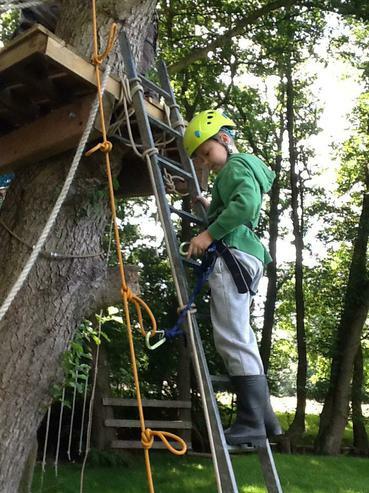 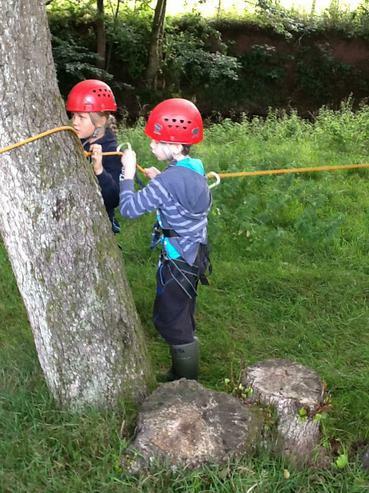 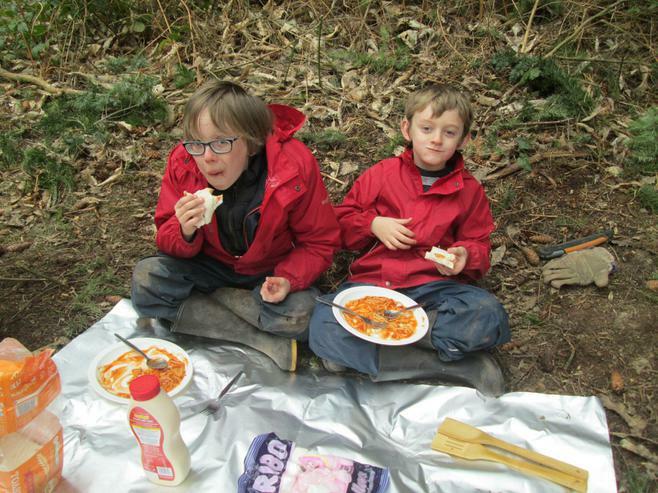 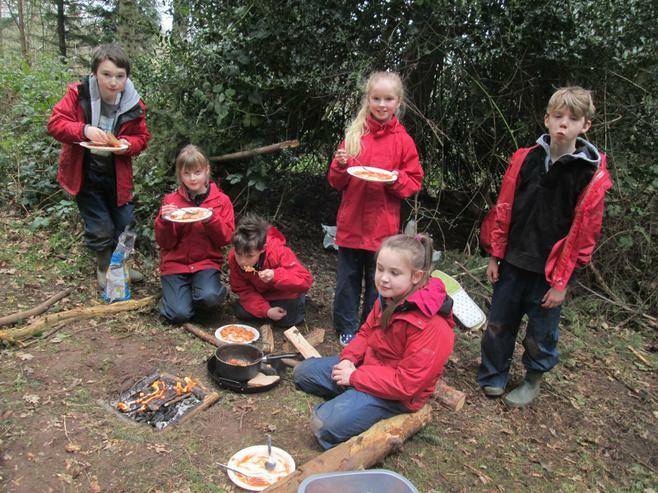 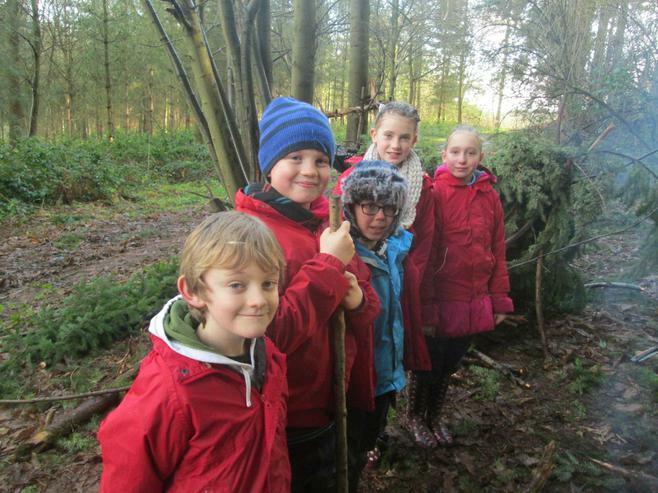 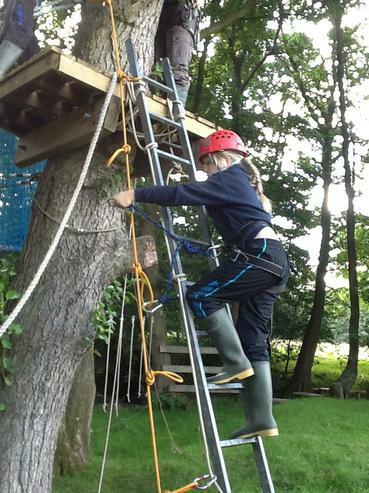 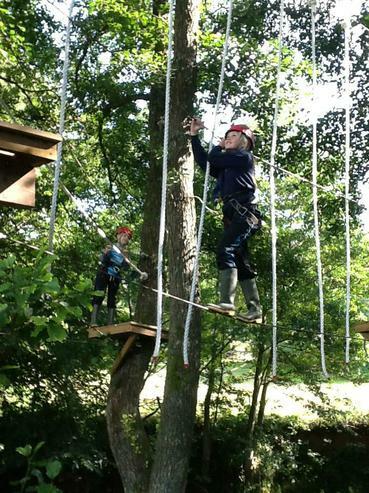 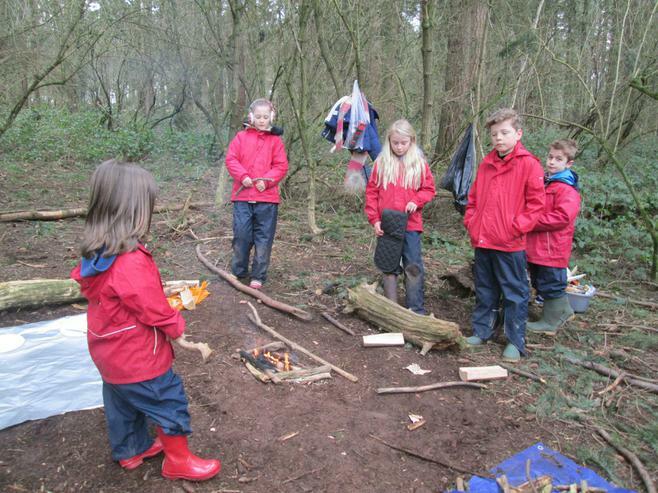 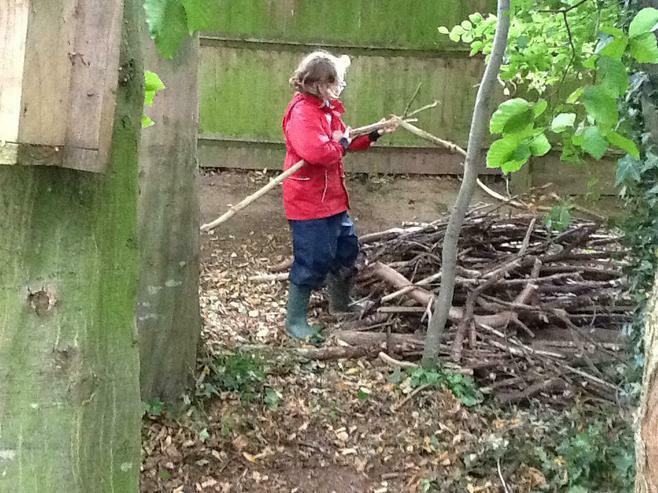 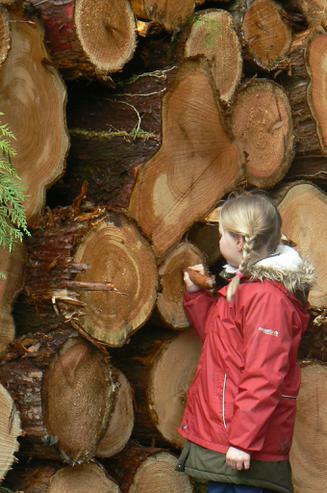 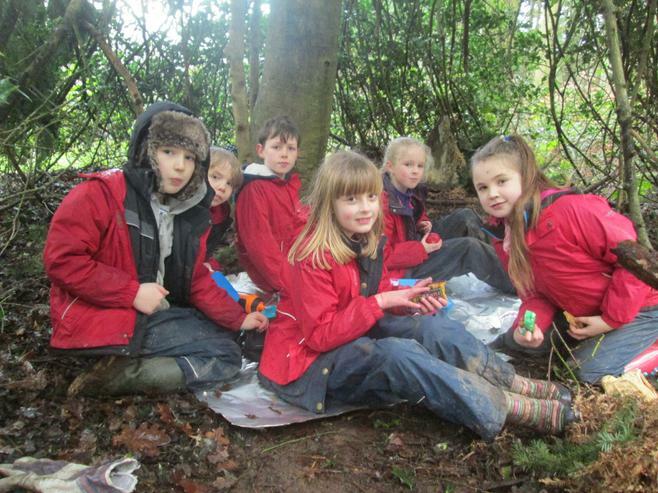 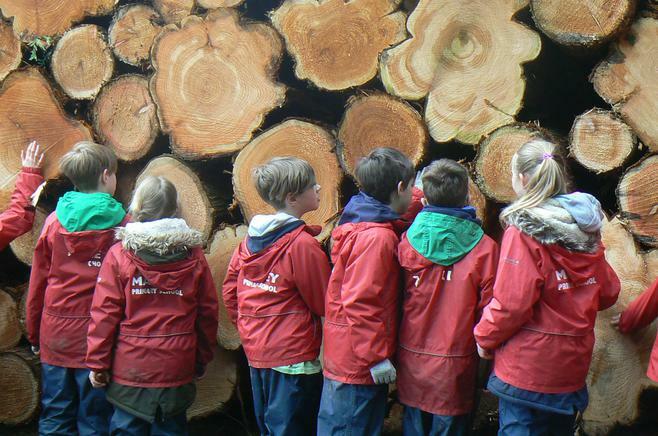 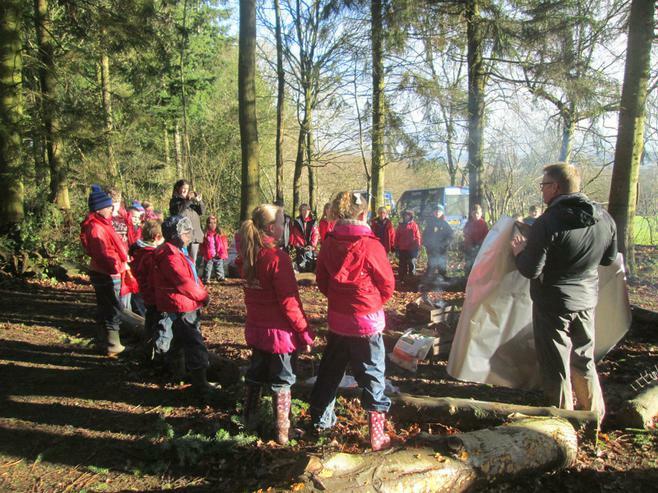 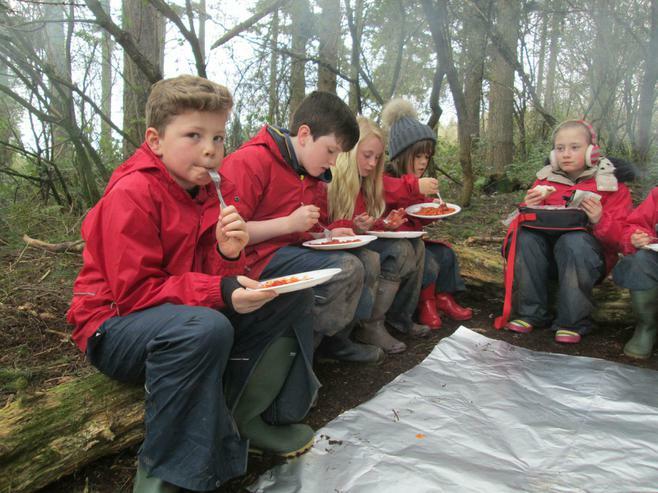 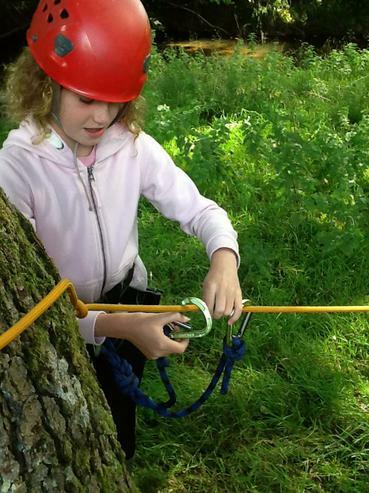 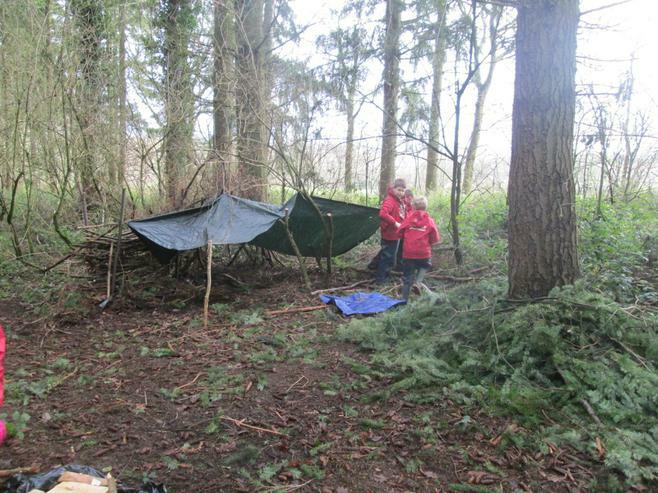 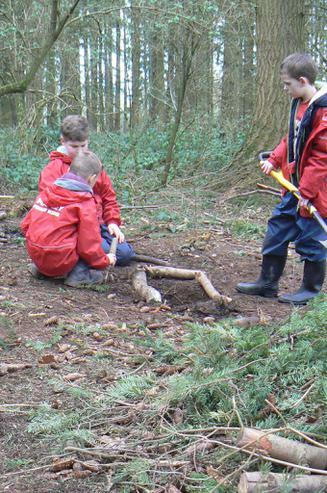 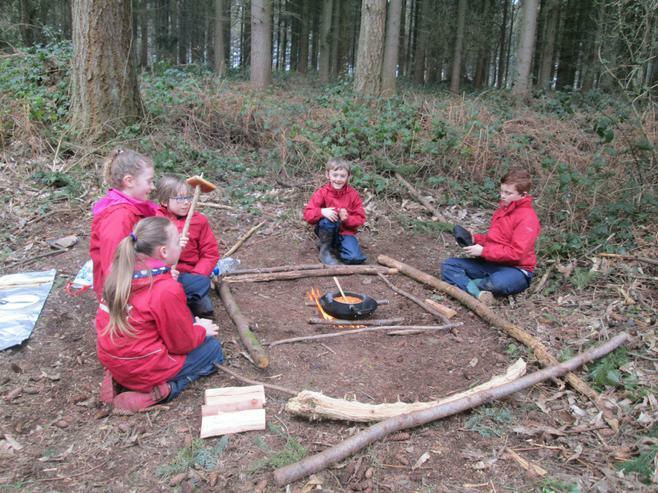 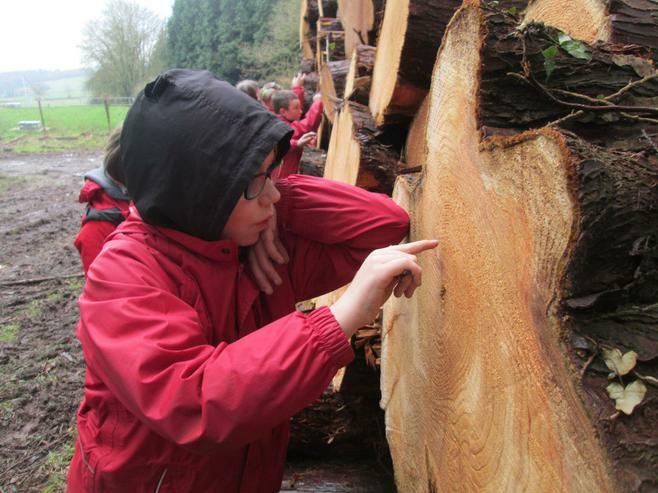 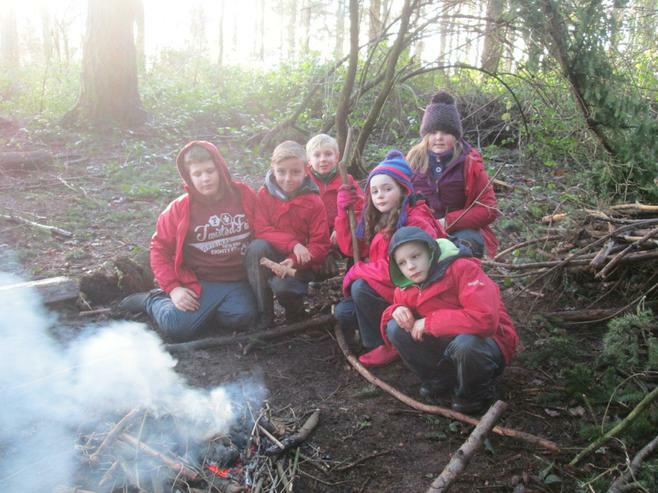 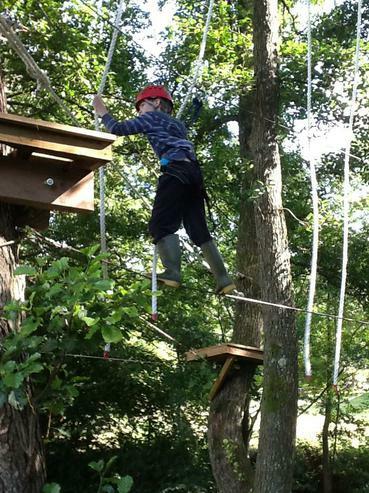 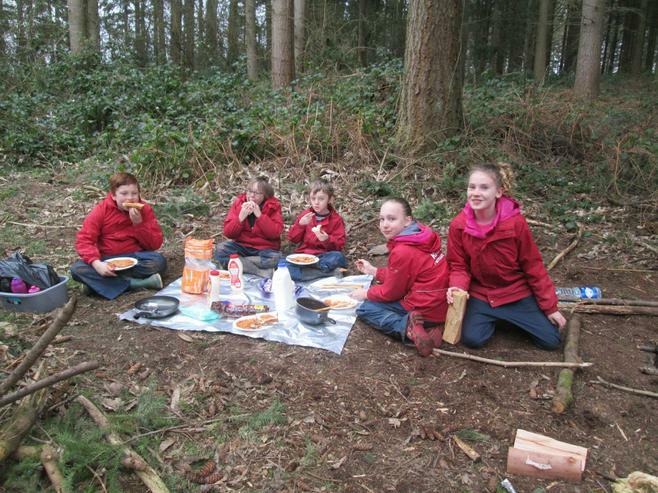 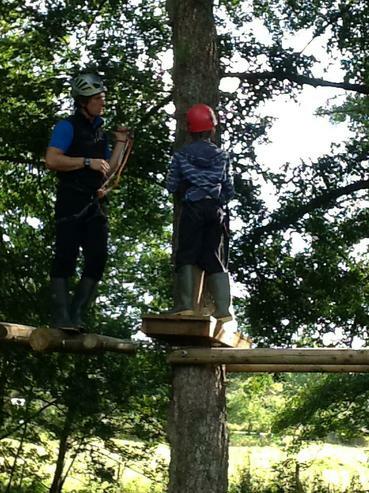 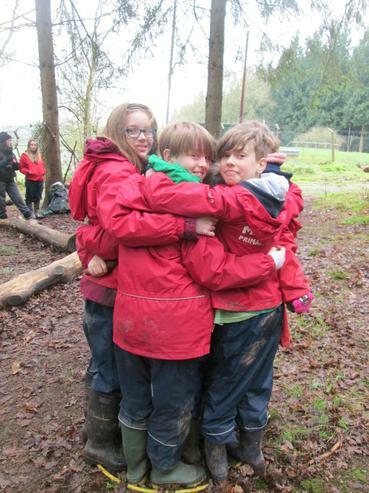 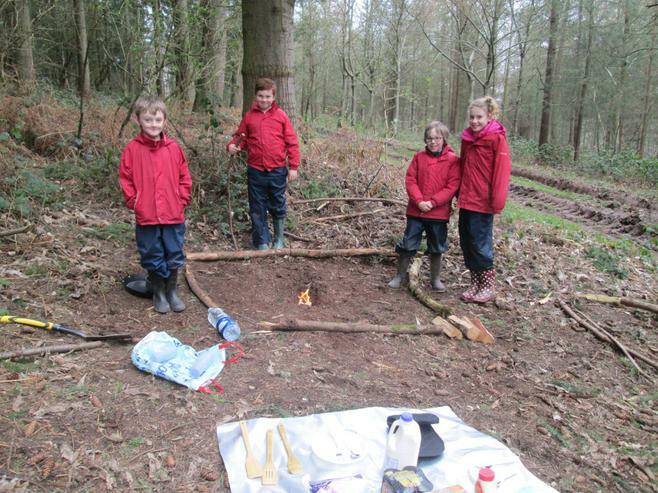 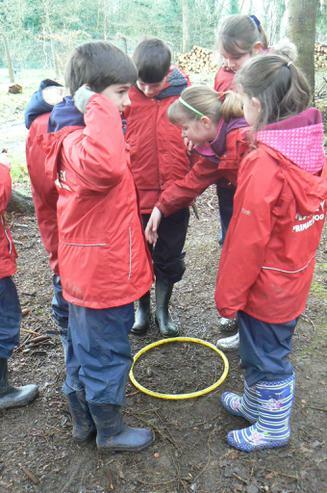 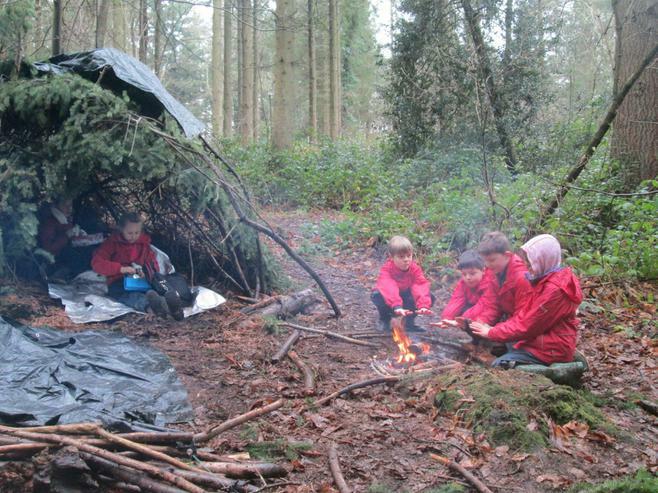 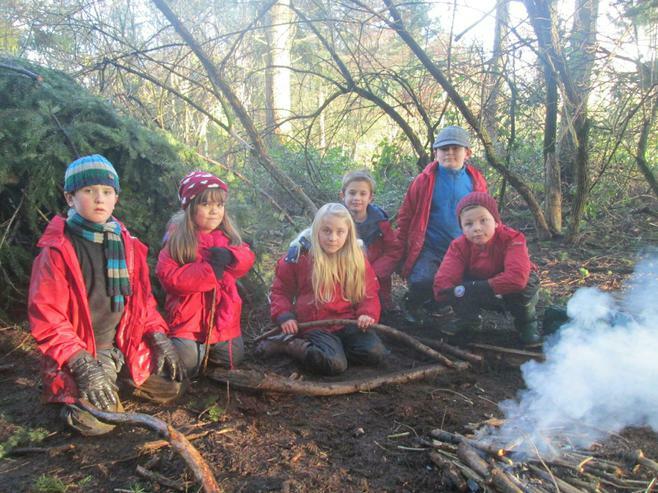 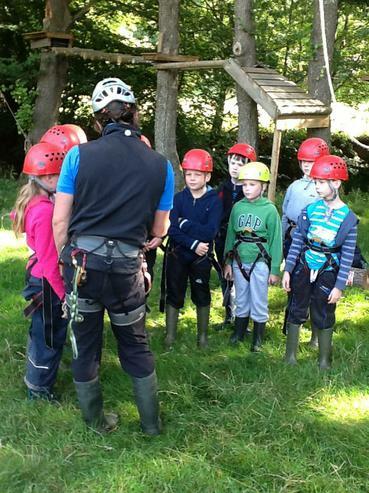 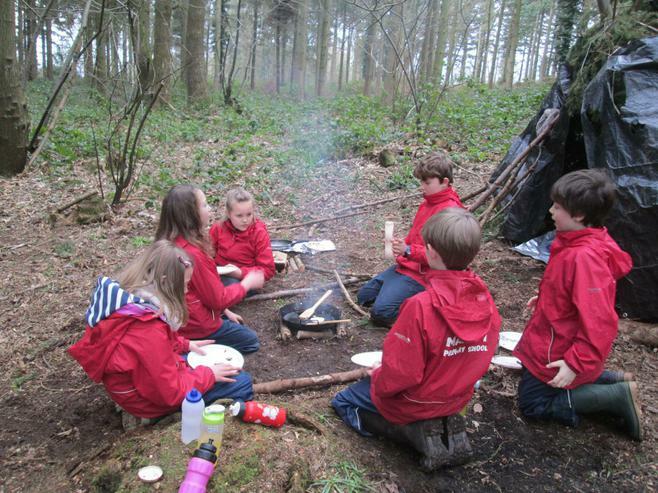 This week Class 5 started their on-site Forest School project. 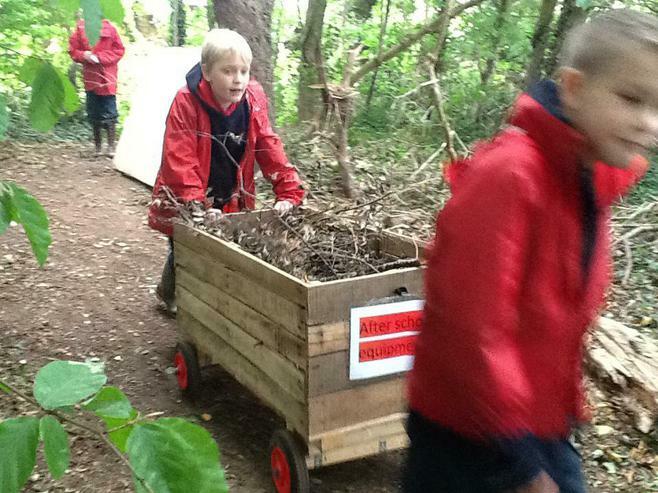 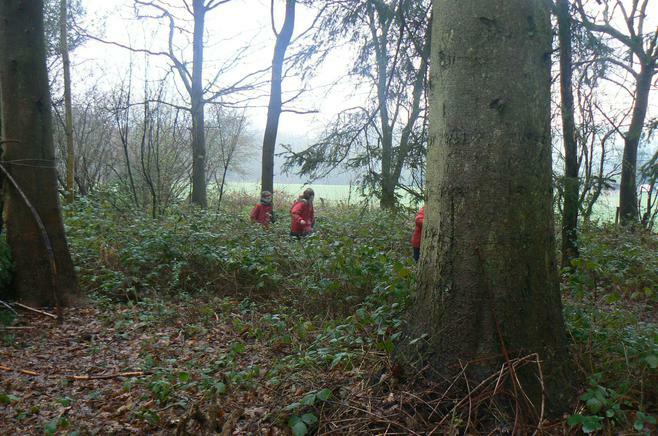 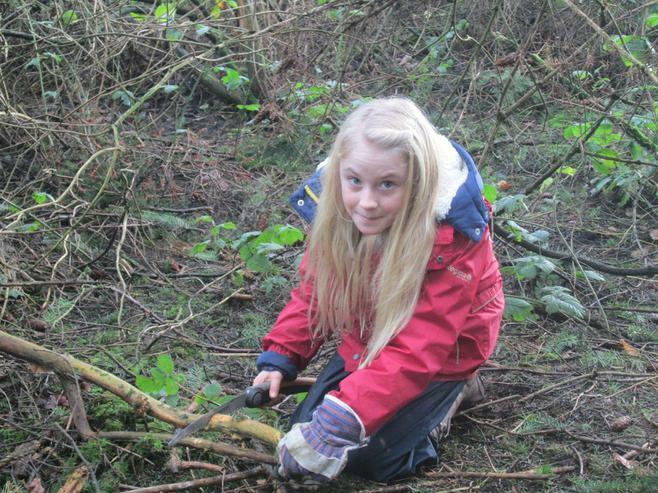 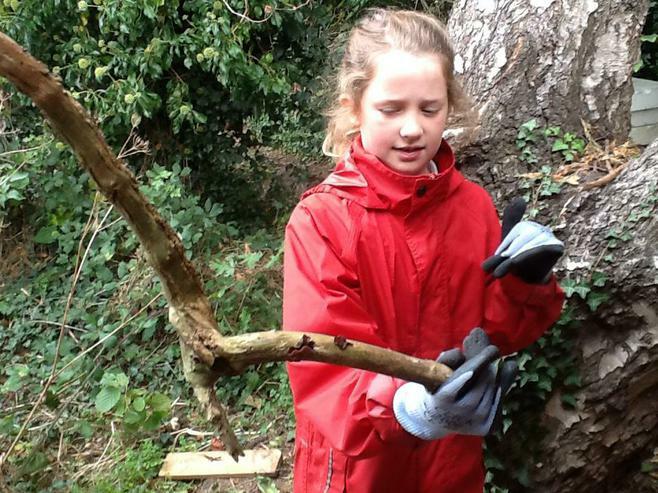 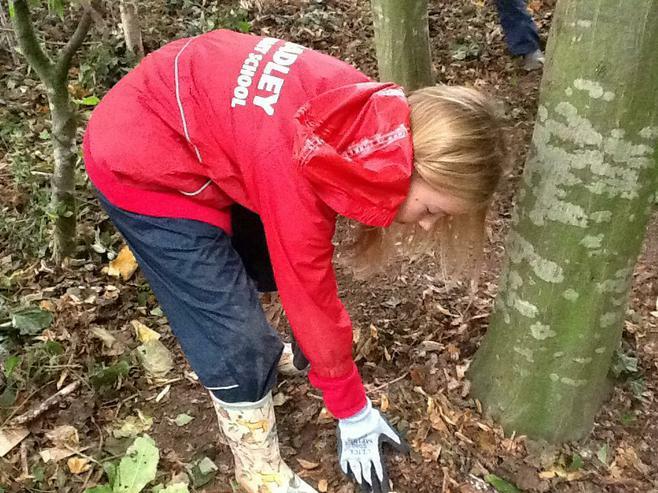 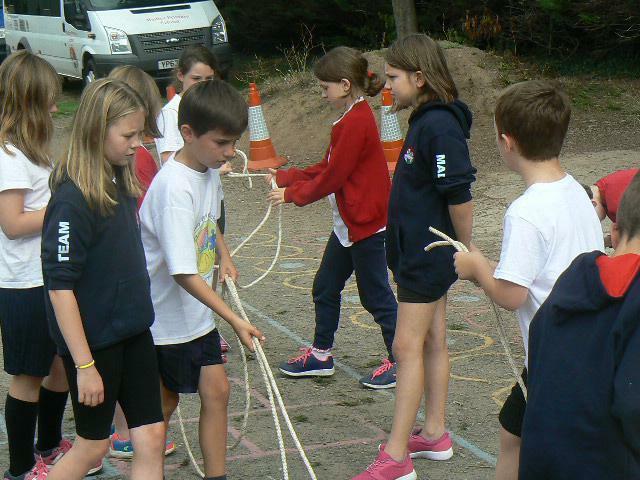 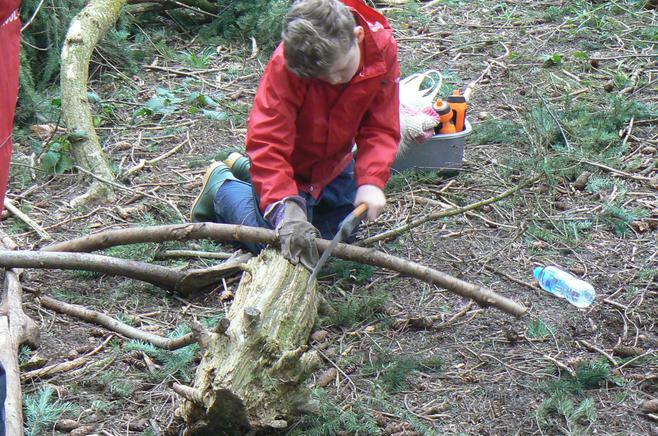 They will be working hard to improve the woodland area at school and ensure the outdoor classroom, that had been built a few years ago, is renovated and fit for purpose again. 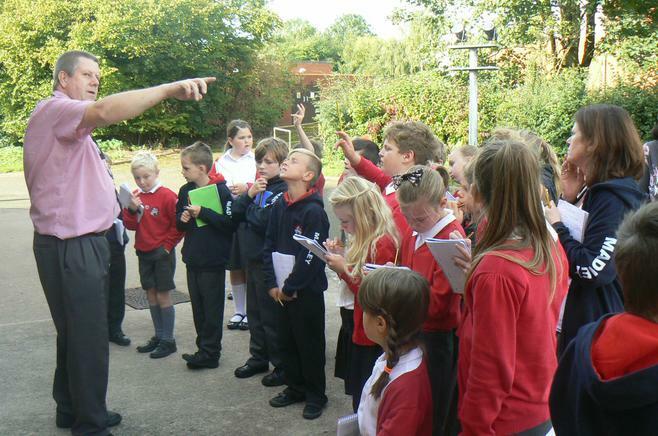 The children are buzzing with ideas and are keen to encourage birds to the area as well as ensure it becomes a safe place for the younger children at school to enjoy too. 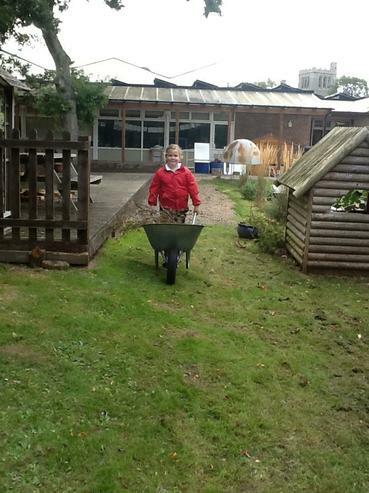 Please keep looking back here and in the photo folder of our class page to see how hard we are working and the progress we are making. 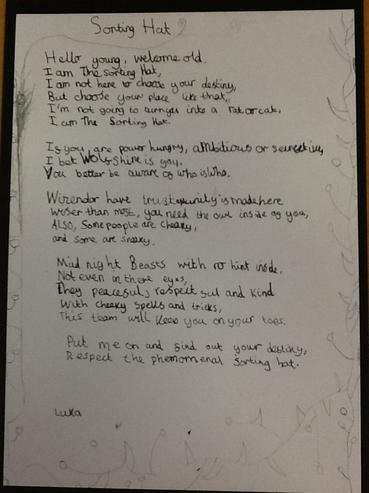 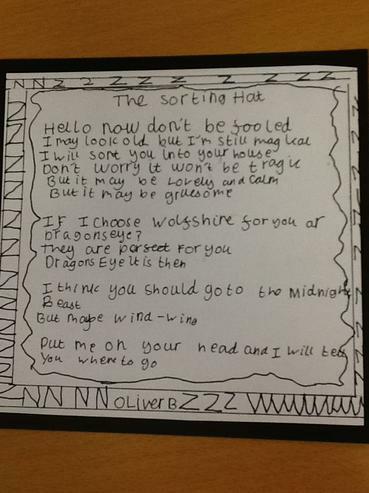 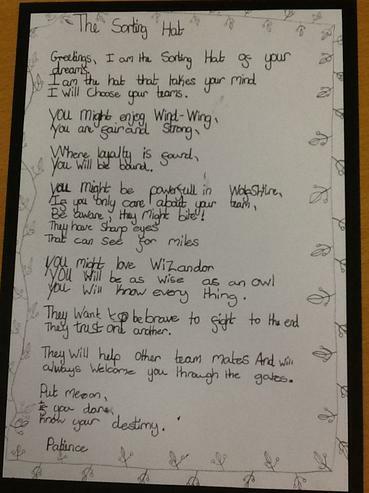 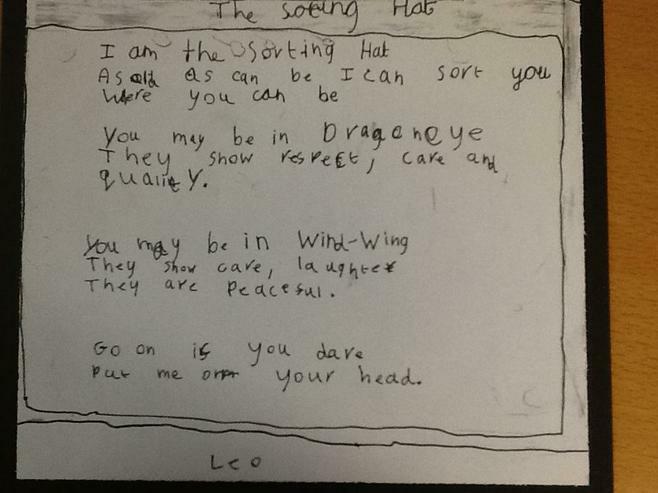 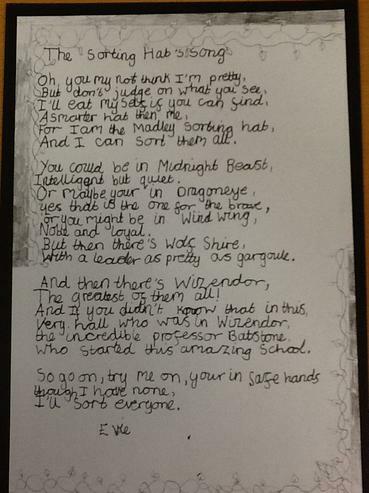 As soon as we returned to school we started thinking about the Sorting Hat from Harry Potter and his song for deciding which house the pupils of Hogwarts go into. 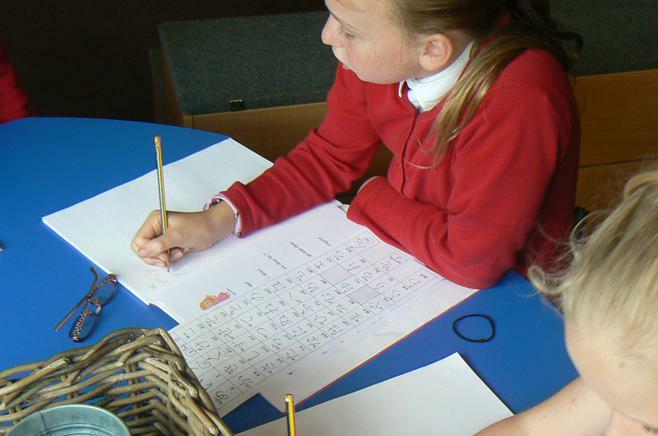 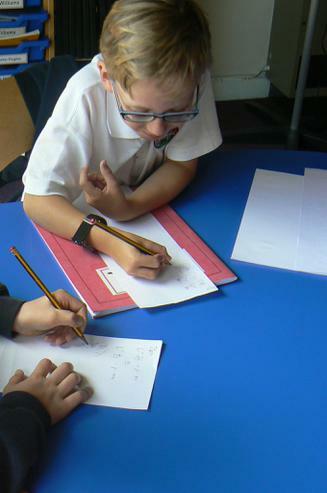 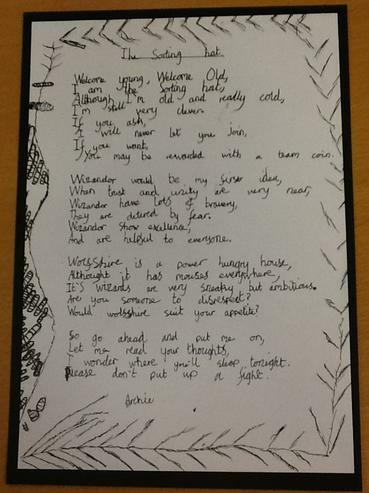 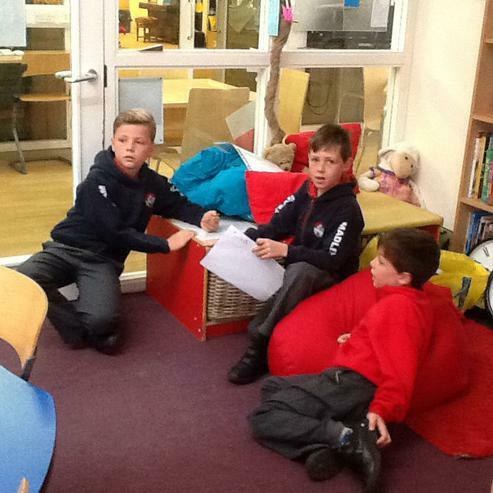 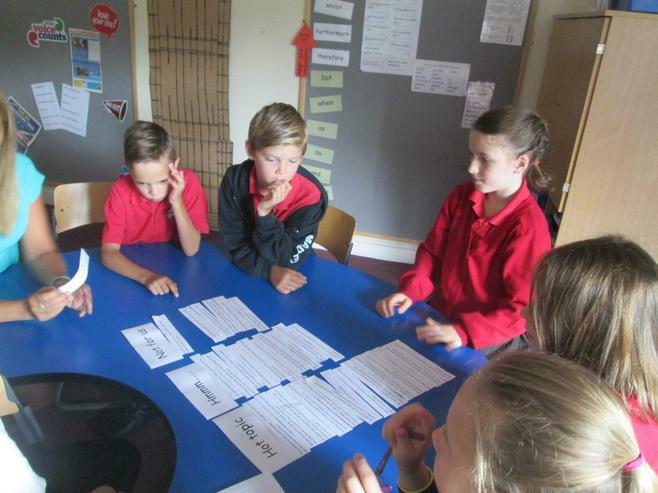 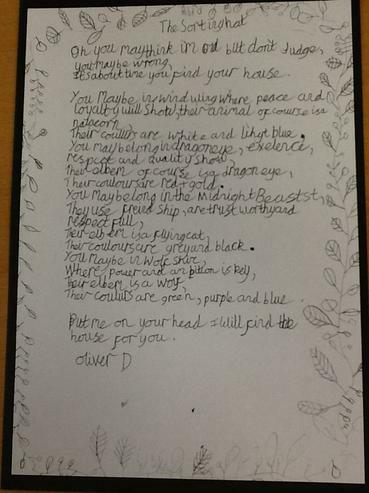 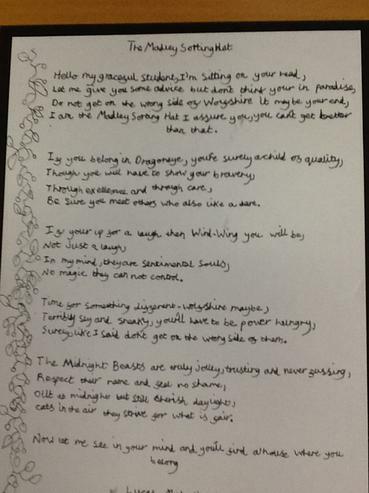 We used the school Values to consider the houses we might include -some are more trustworthy than others- and then used our newly designed Madley Houses to write our own songs. 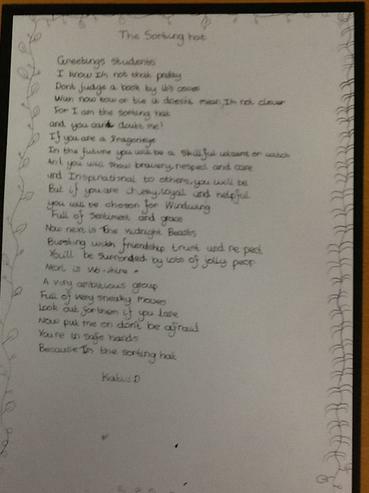 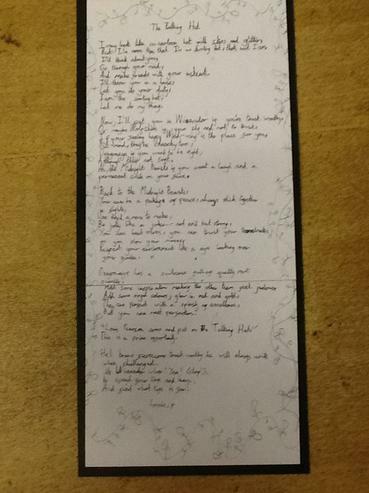 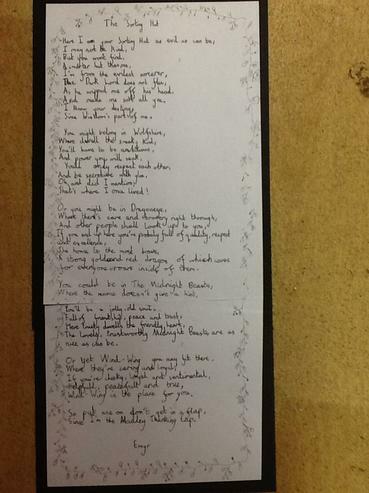 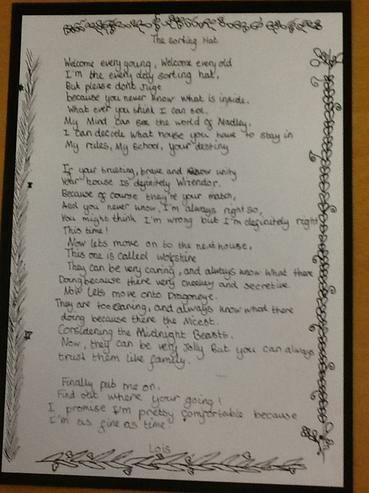 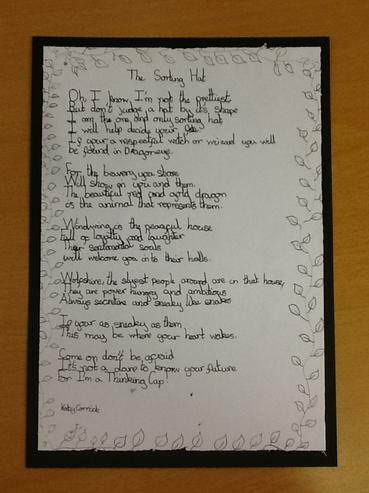 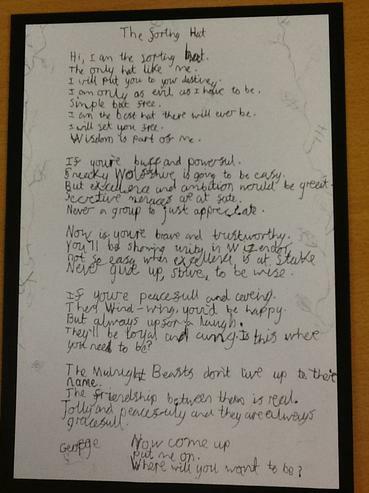 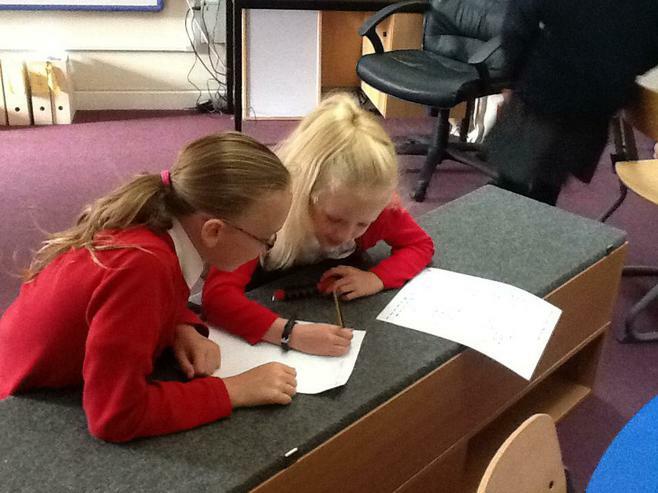 WE independently edited the songs and re-wrote them for our class display. 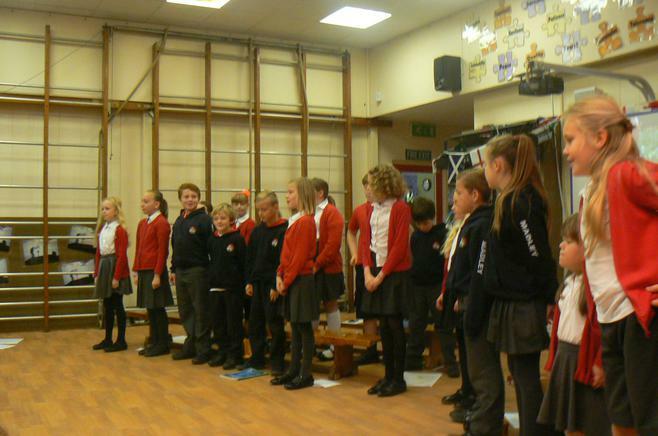 The photos show the songs and how they are displayed in our classroom. 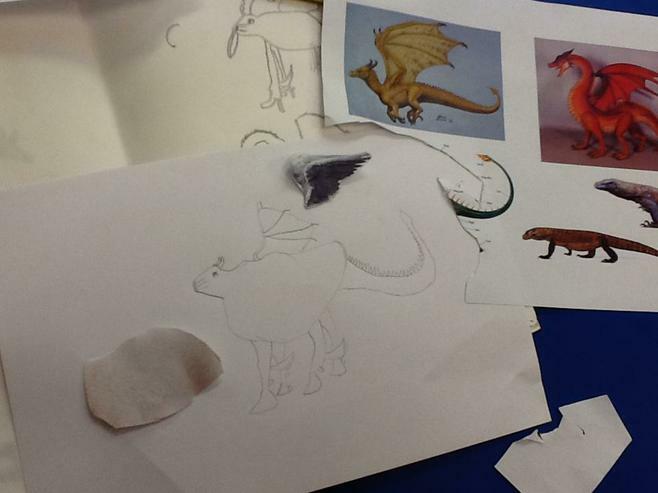 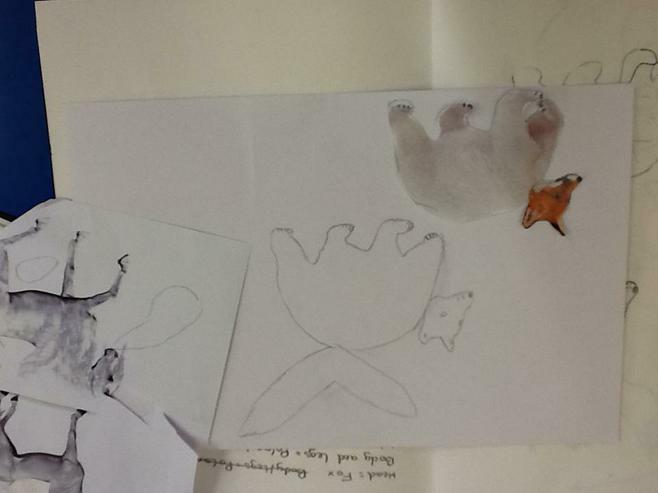 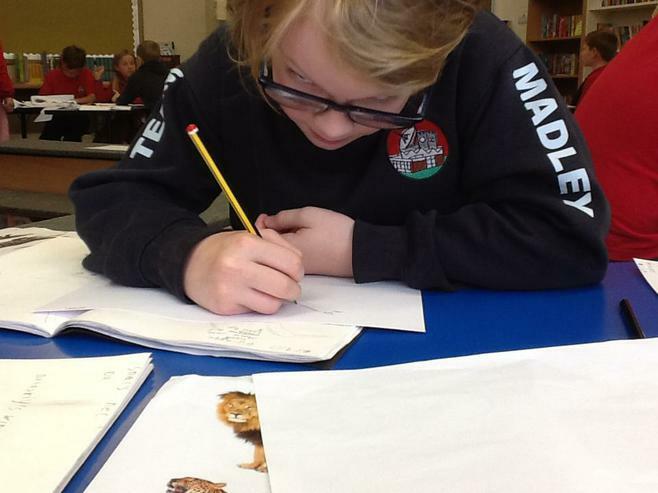 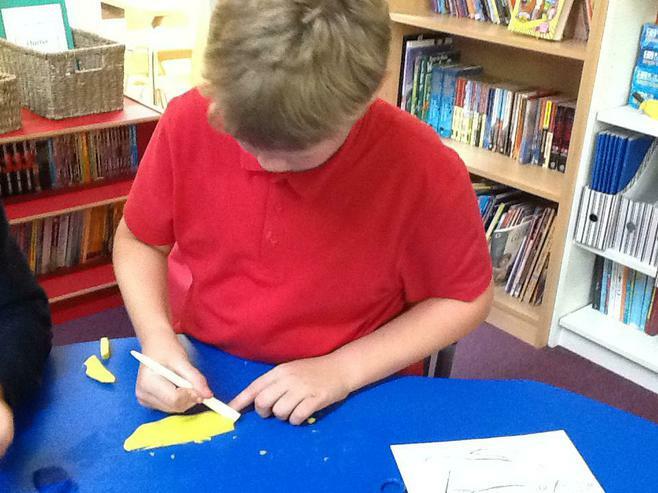 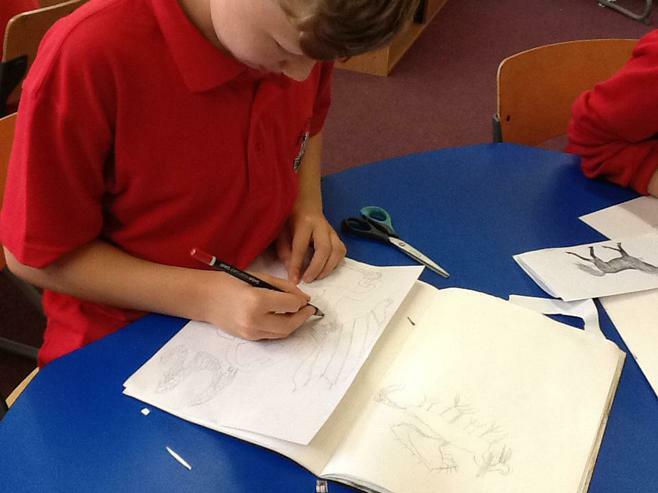 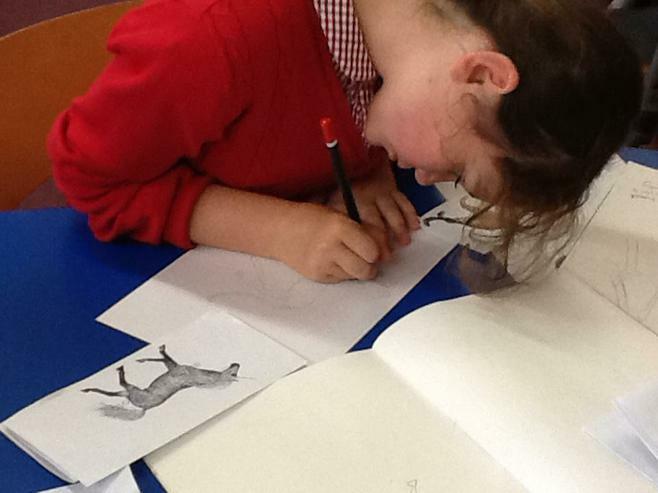 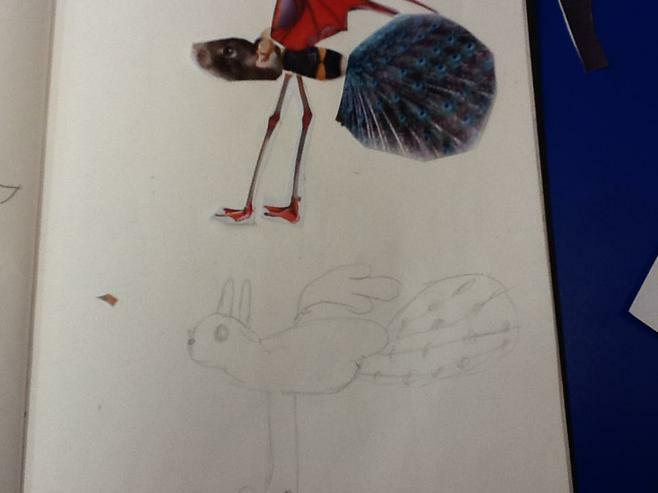 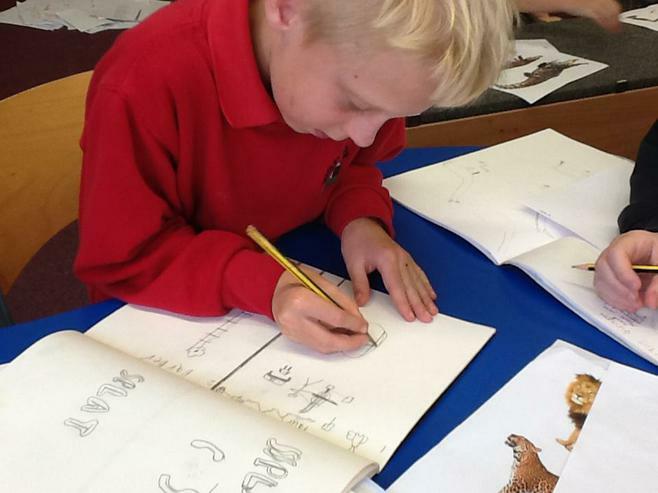 As part of our theme, we are designing mythical creatures. 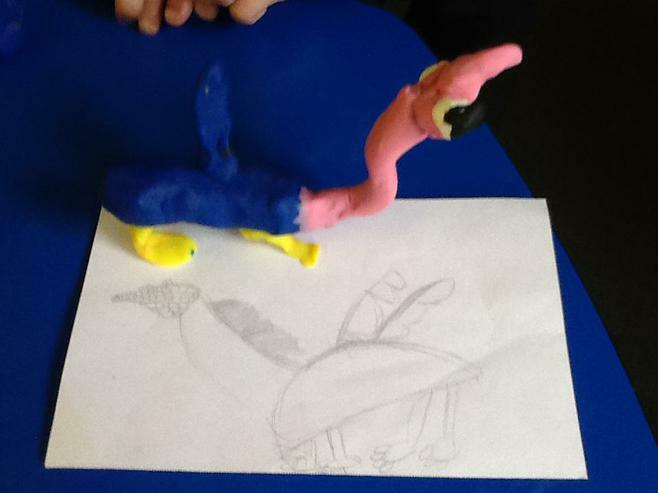 We are using inspiration from books such as Harry Potter and Fantastic Beasts; Greek mythology and artists such as Picasso, who was obsessed with the Minotaur, Jon MacNair, who takes inspiration from old medieval drawings and Leonardo Di Vinci and his hybrid creatures. 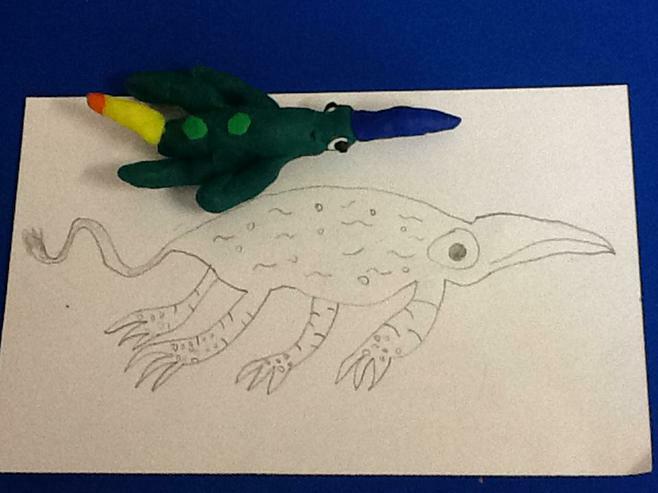 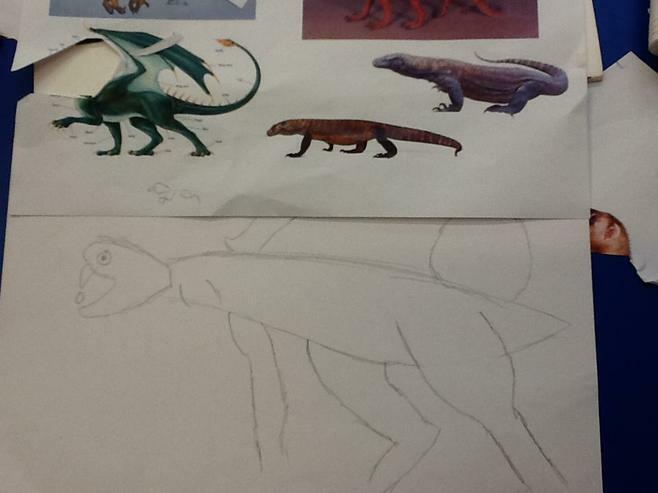 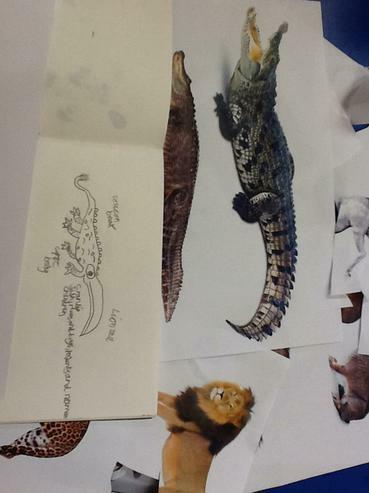 We will start with drawing these creatures before creating 3D models of them. 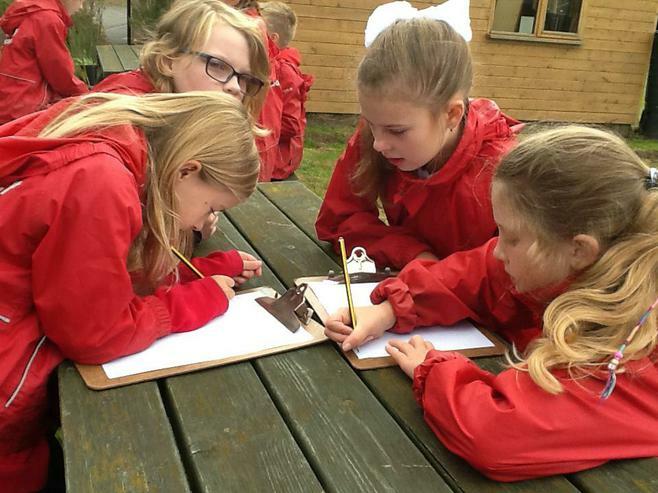 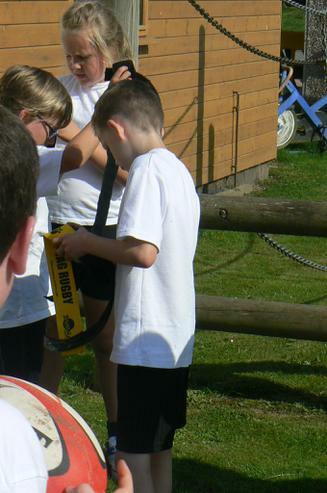 Year 5 visited Barton Hill Farm in Kentchurch on Wednesday 15th March for Lambing Live, following in Reception Class's footprints. 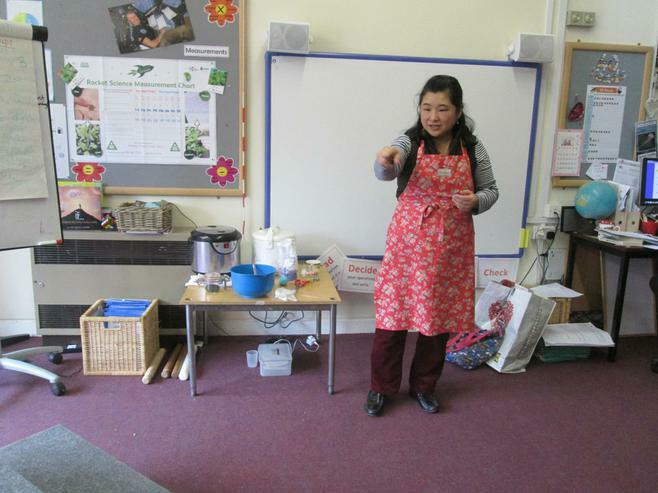 A big thank you to the farmer, Bill Quan, who makes this amazing opportunity available to schools every year! 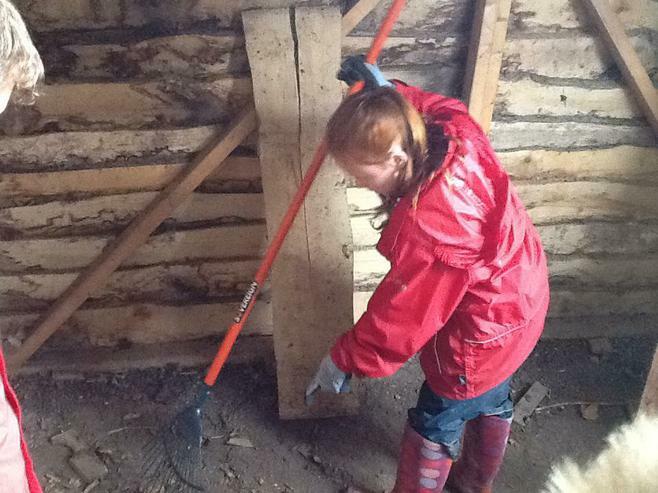 We started out in the barn, learning about how the farm works and getting an idea of what life is like for a farmer. 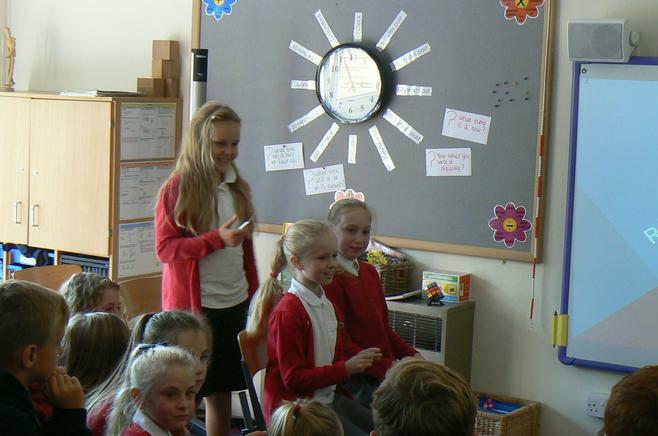 Class 5 had a lot of questions for Farmer Bill, especially about the profits and costs of running a busy farm. 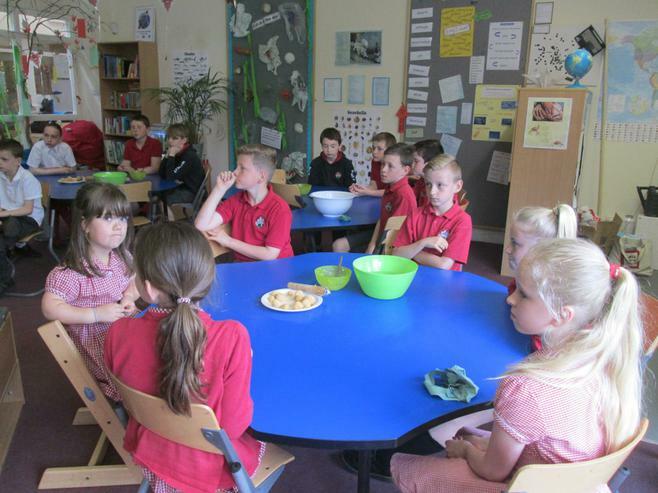 We were interested to learn about all of the crops that the farm produces, including potatoes, wheat and peas (as well as lambs!). 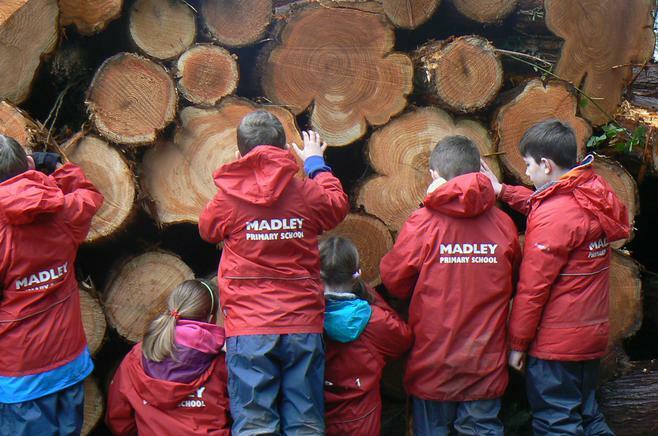 We then moved to the lambing shed, where we found out a lot more about this special time of year - the impact on the farm and the ways that farmers ensure the ewes have healthy births. 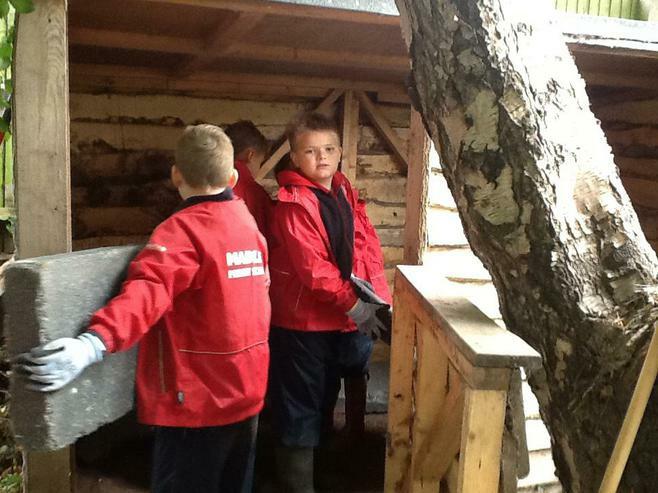 Class 5 loved the hands-on part of the visit, which included holding and feeding the lambs! 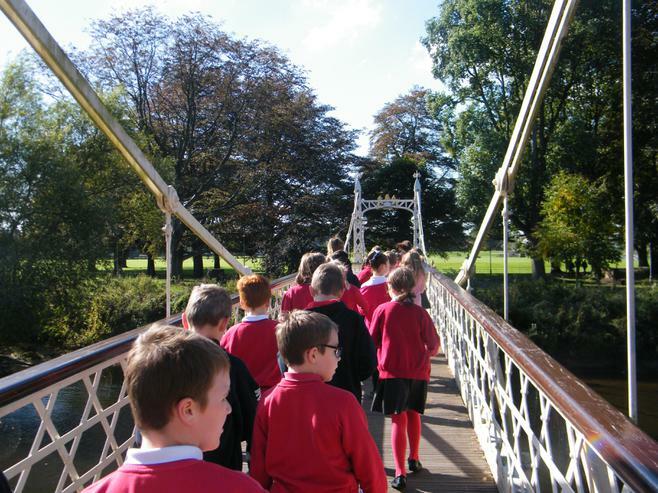 Next, we went for a walk in the spring sunshine, down to the stream and the woods to learn how to identify the trees that grow on the farm. 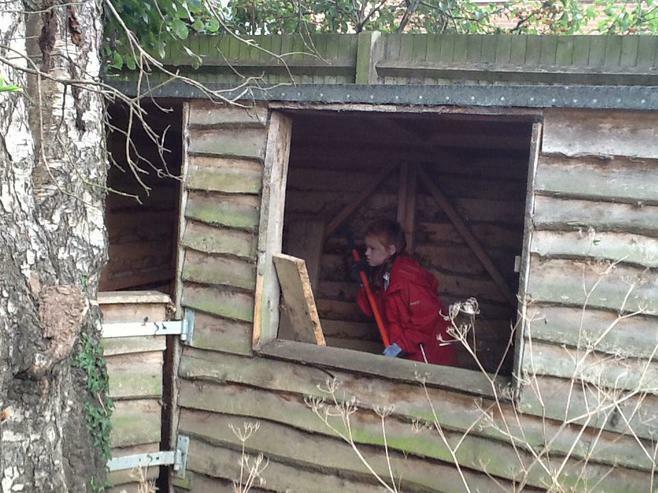 We ended up back in the lambing shed. 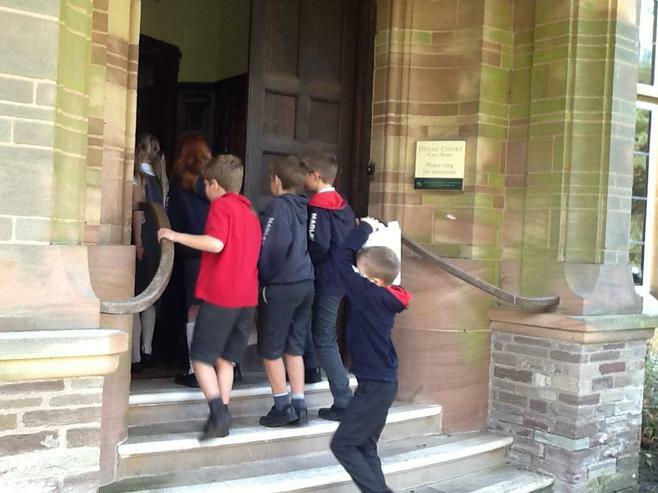 We weren't lucky enough to witness a live birth on this visit, but it was wonderful to see the lambs that had been born earlier in the morning. 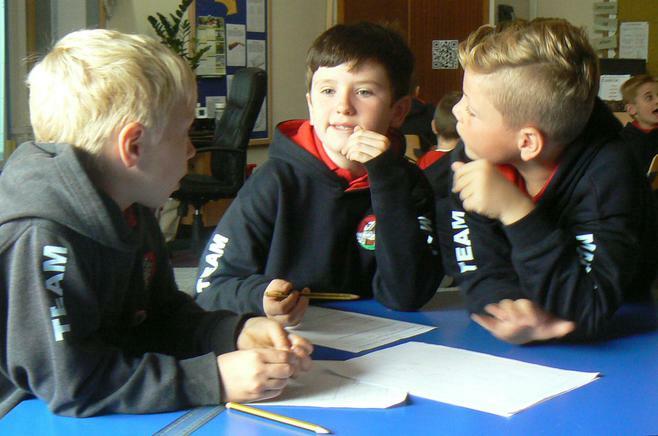 Our improved understanding of life-cycles of animals will form the starting point for our science next term, when we will be focusing on this topic, and including the life-cycle of humans. 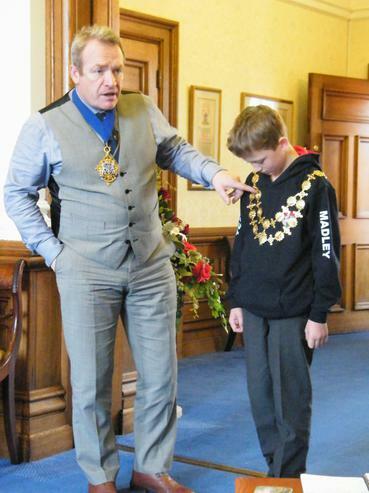 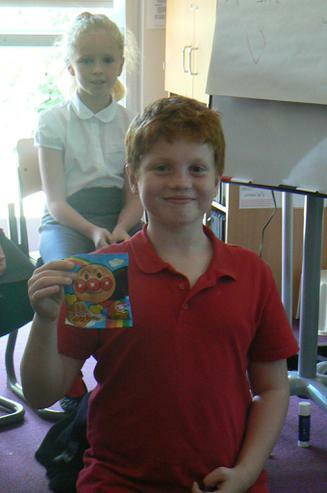 A local magician, Kiegan Vallely, visited Class 5 with the Mayor on 22nd February. 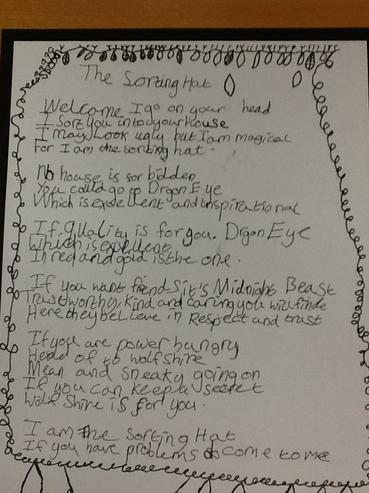 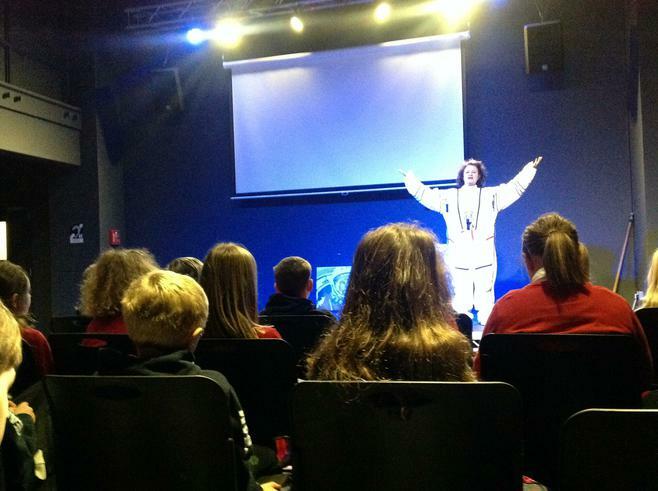 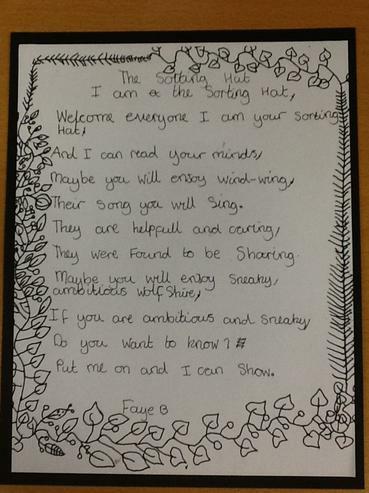 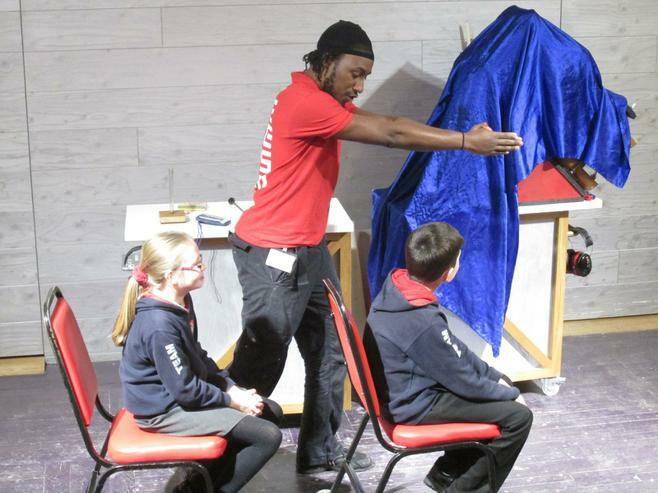 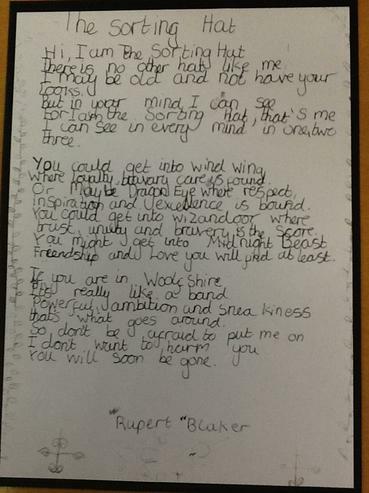 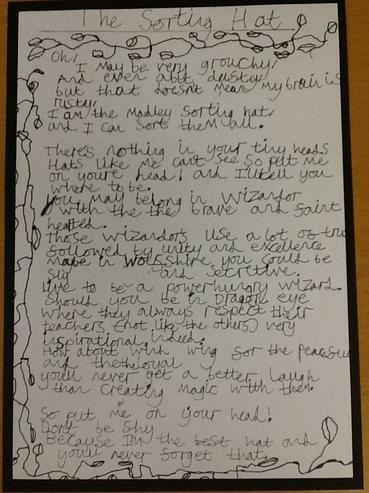 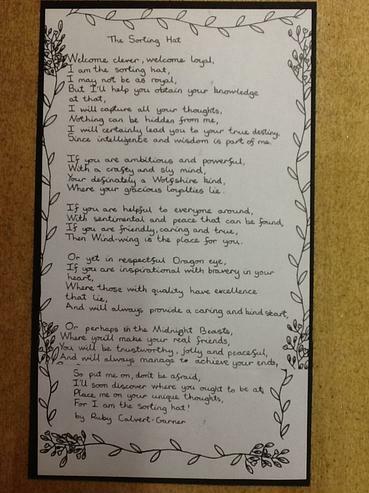 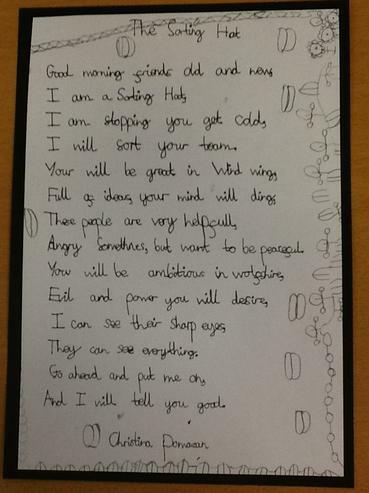 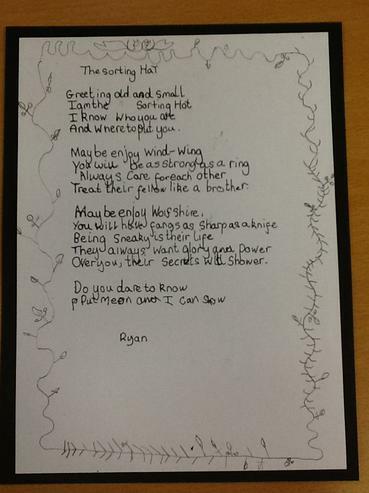 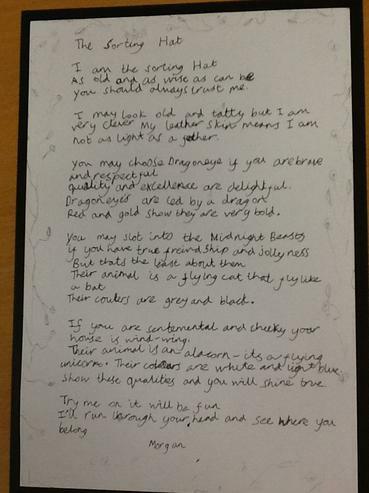 See below for some fantastic reviews of his magic show, written by the children! 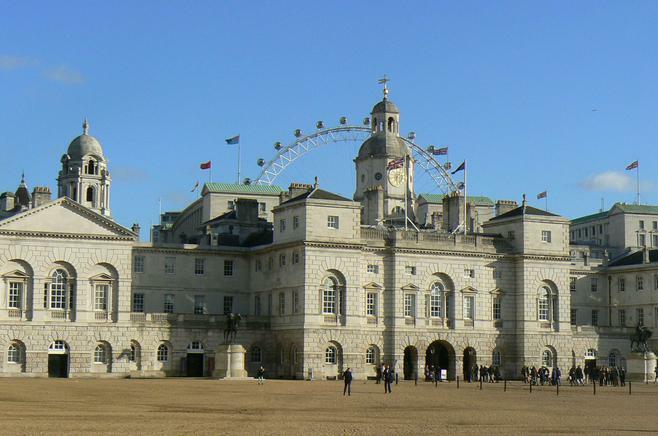 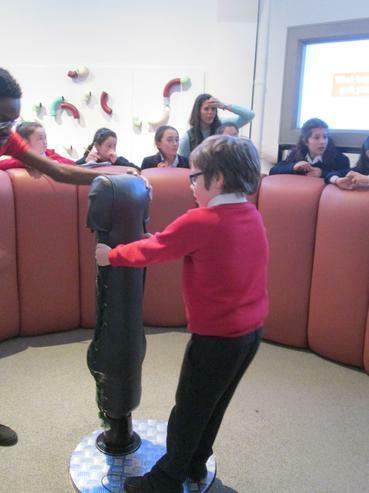 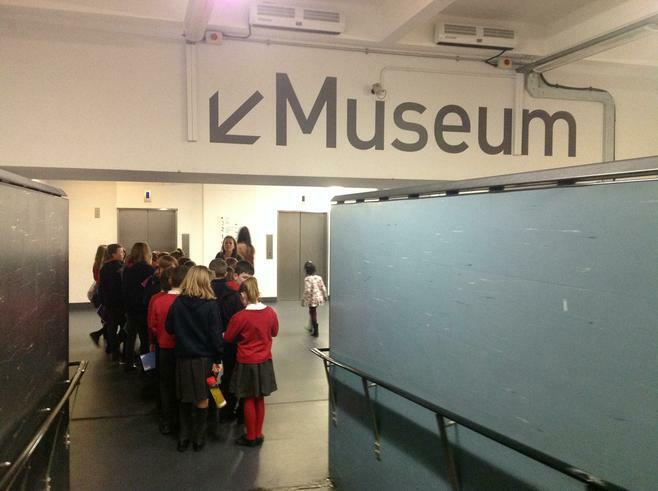 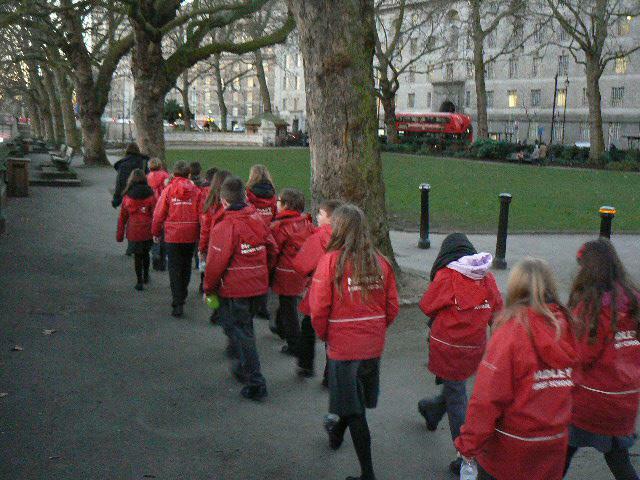 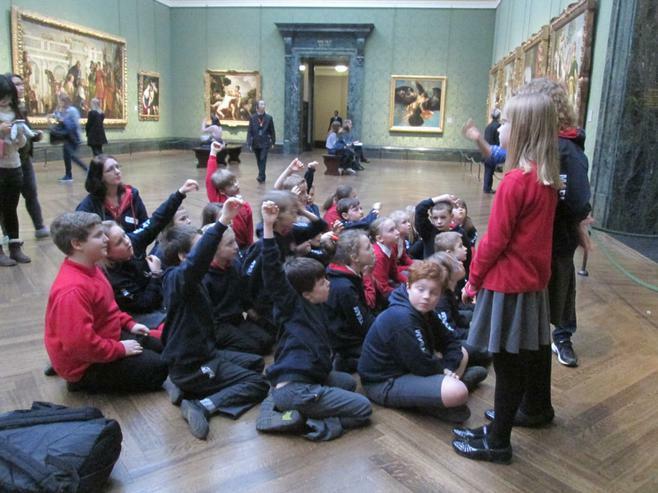 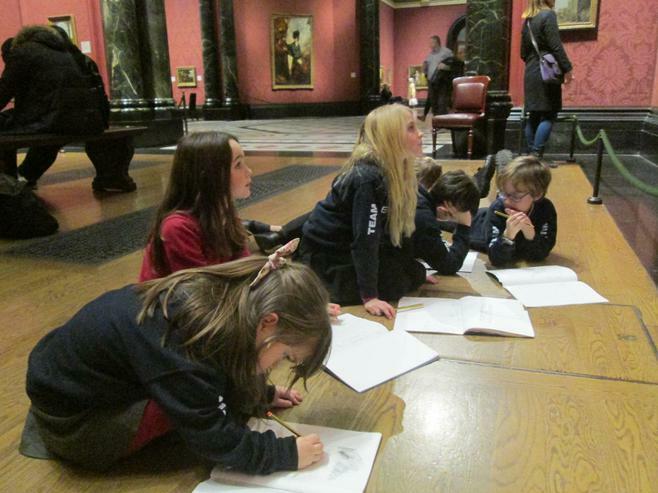 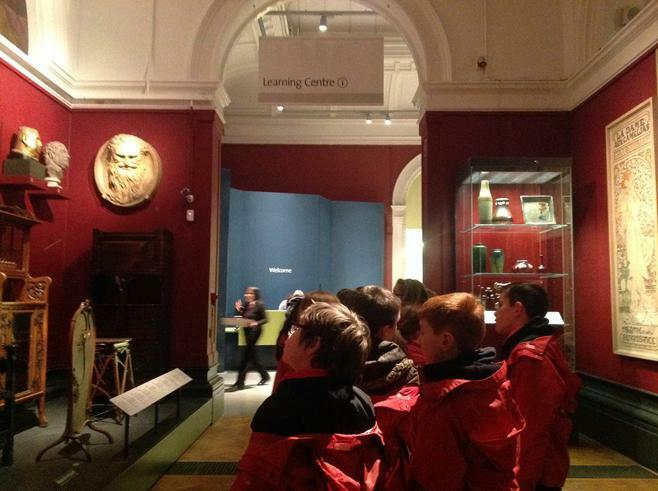 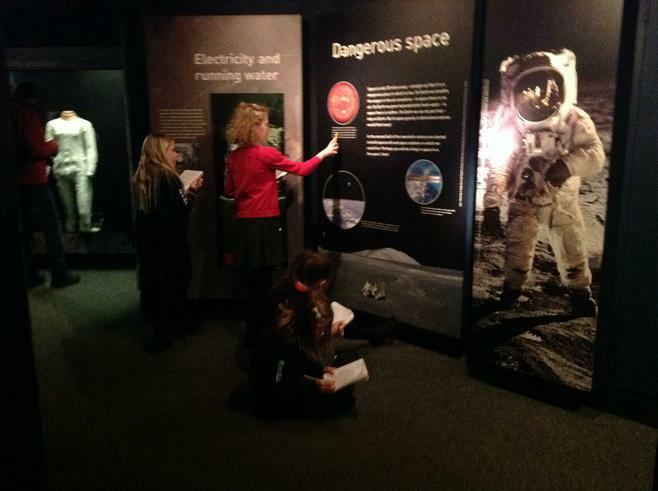 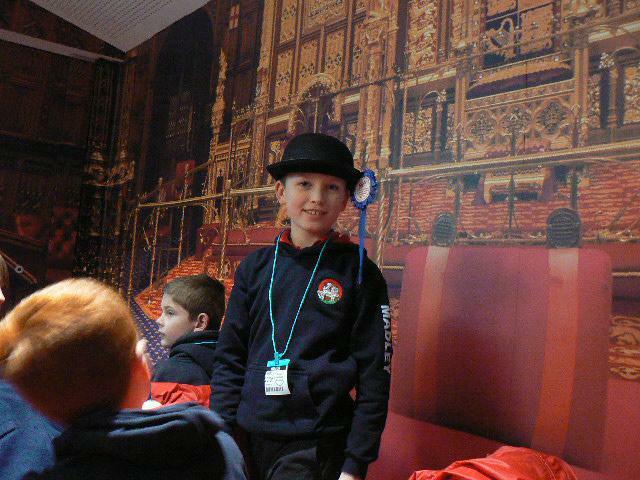 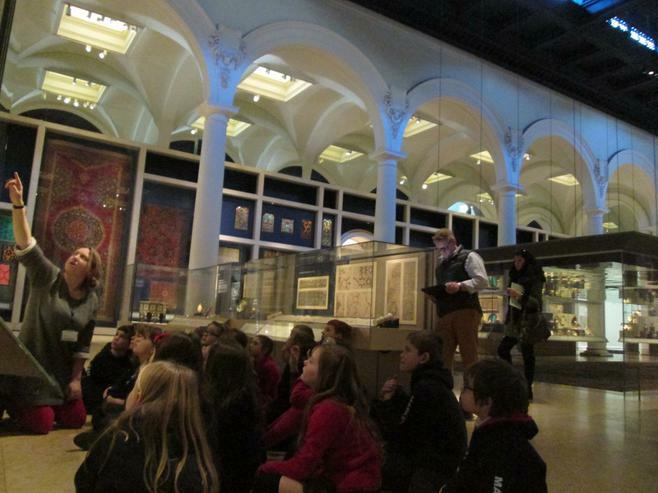 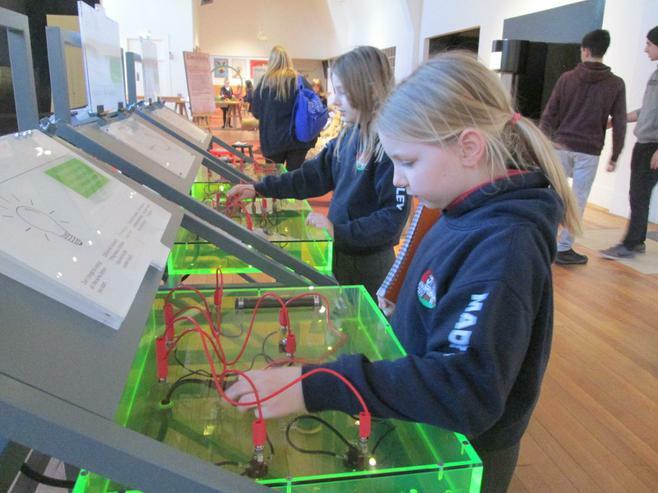 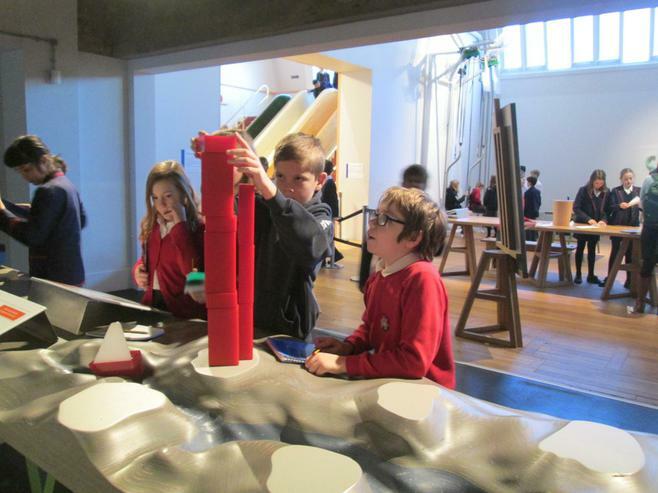 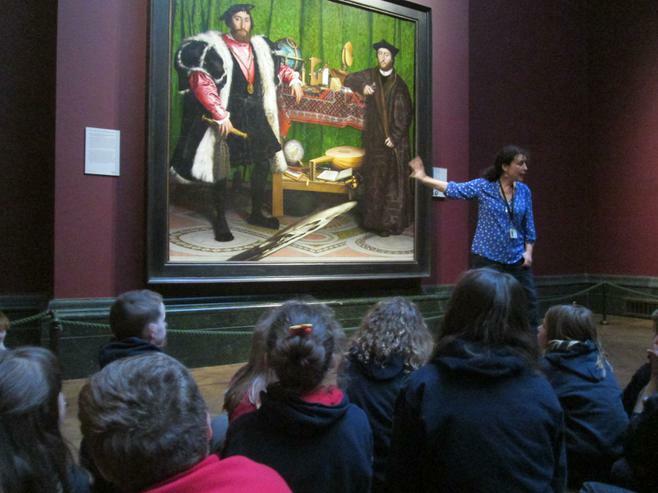 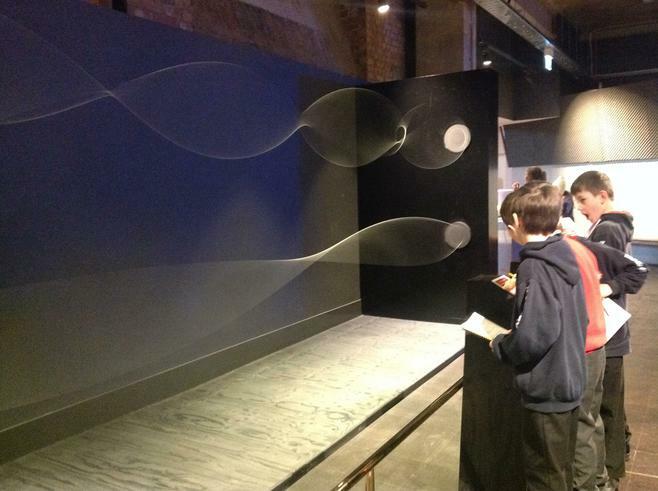 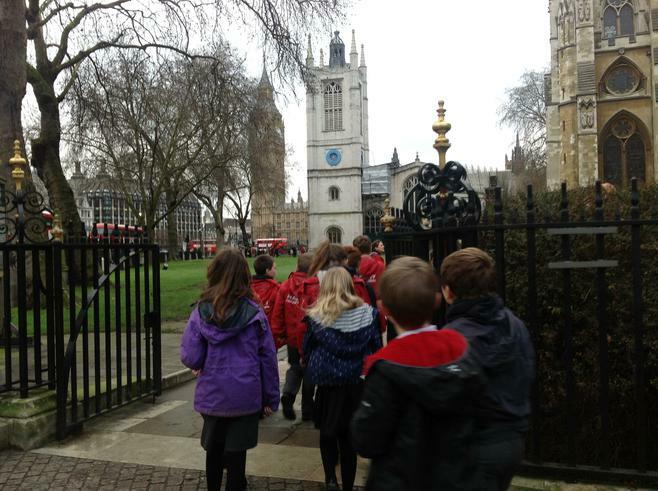 Class 5 enjoyed a wonderful curriculum visit to London in January, taking in the Science Museum, the Victoria and Albert Museum and the Houses of Parliament. 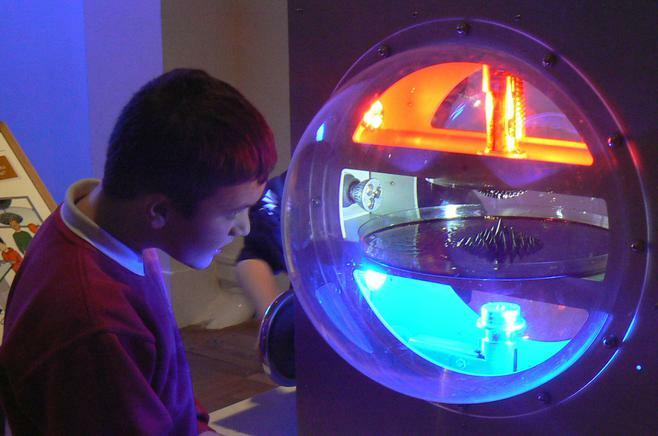 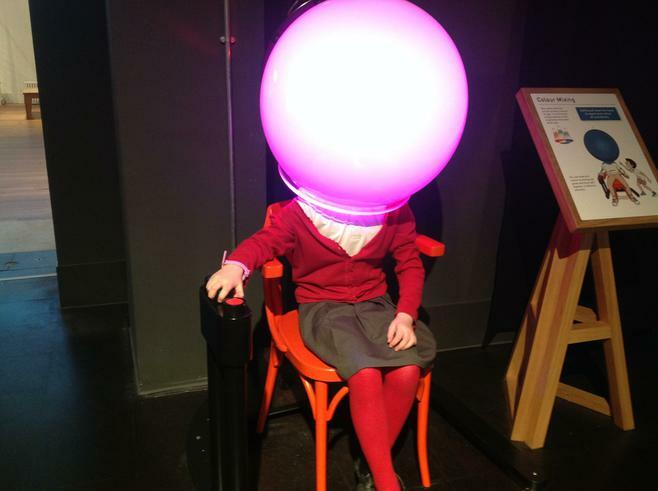 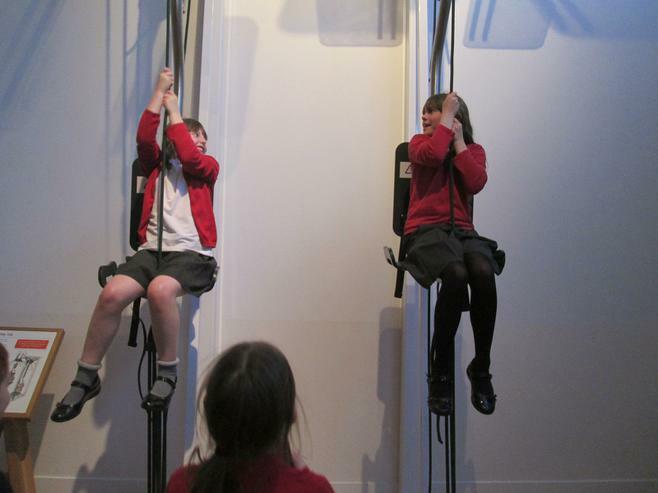 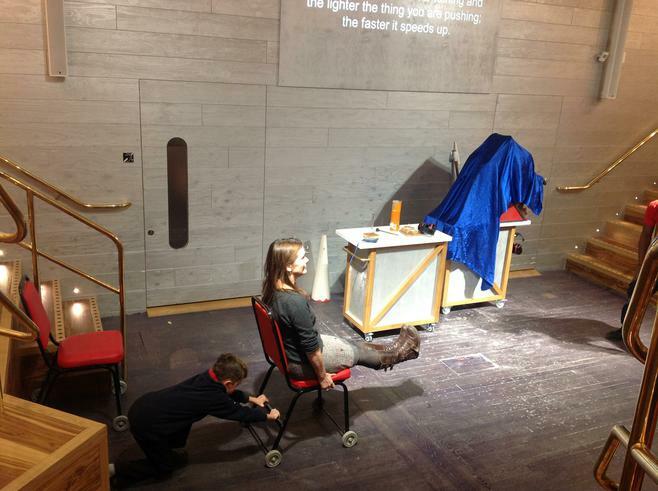 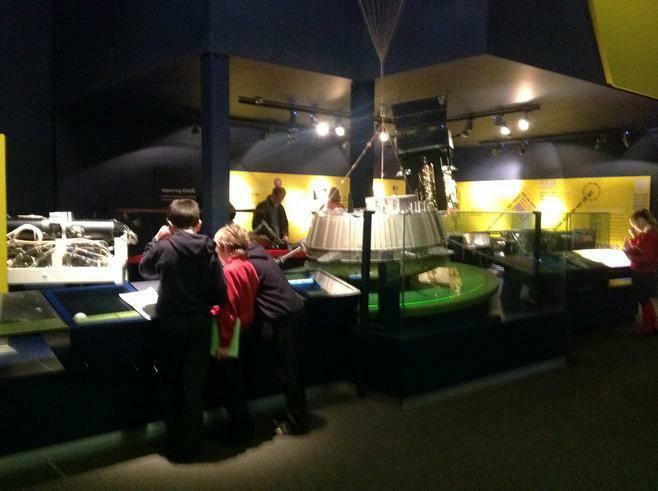 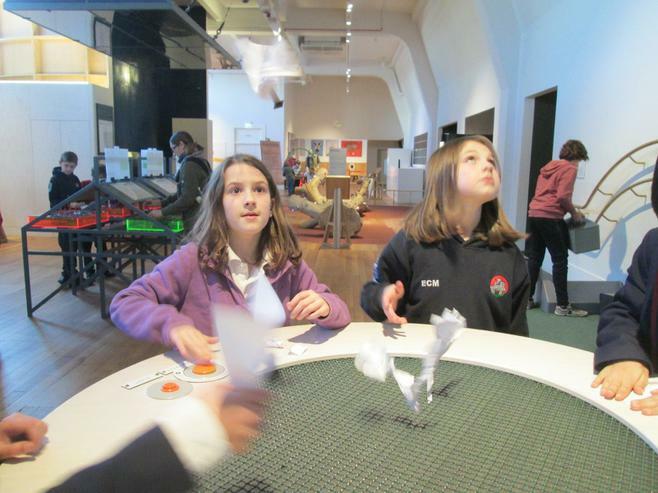 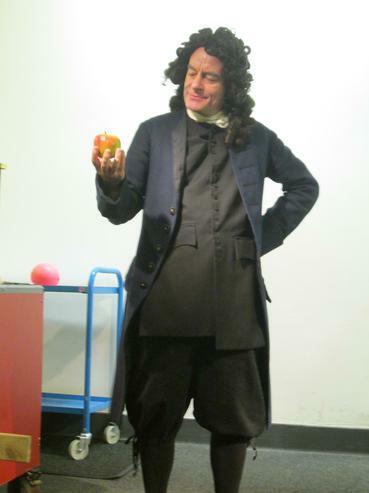 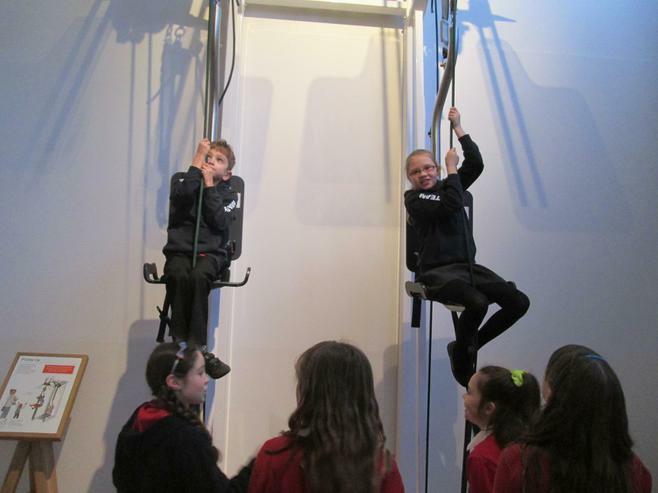 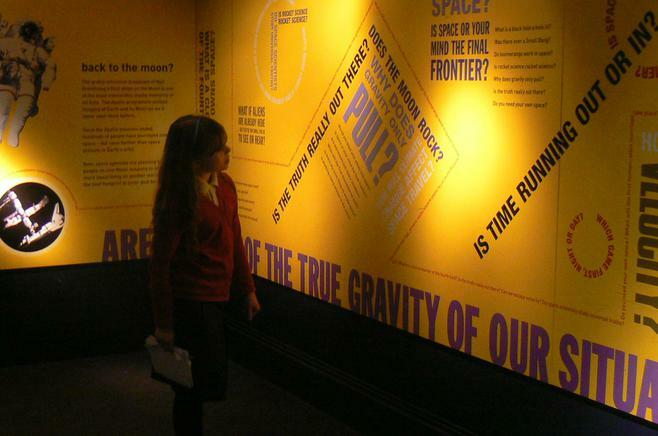 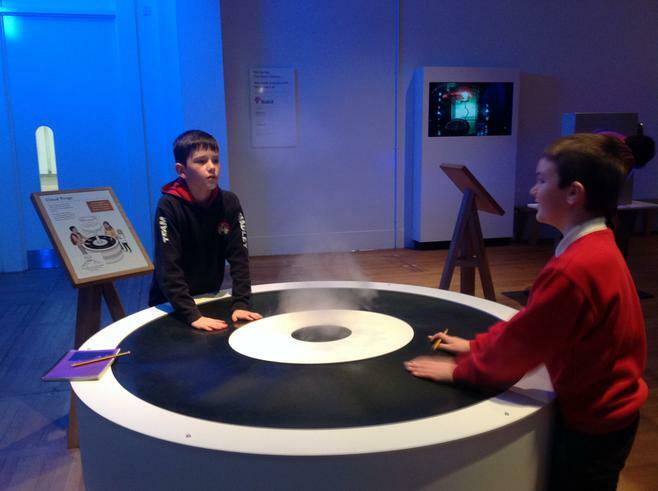 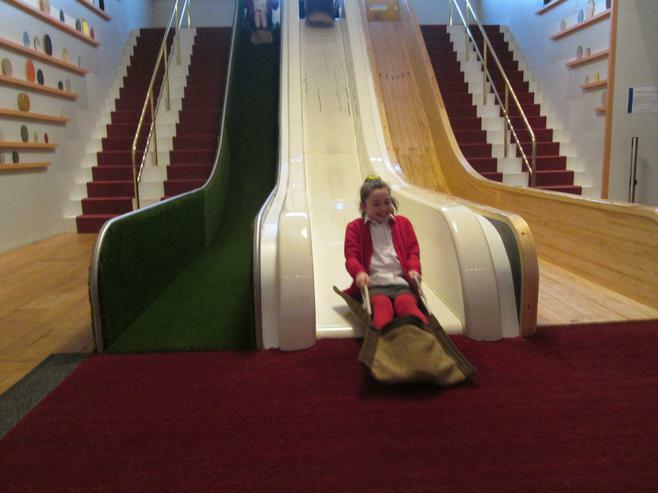 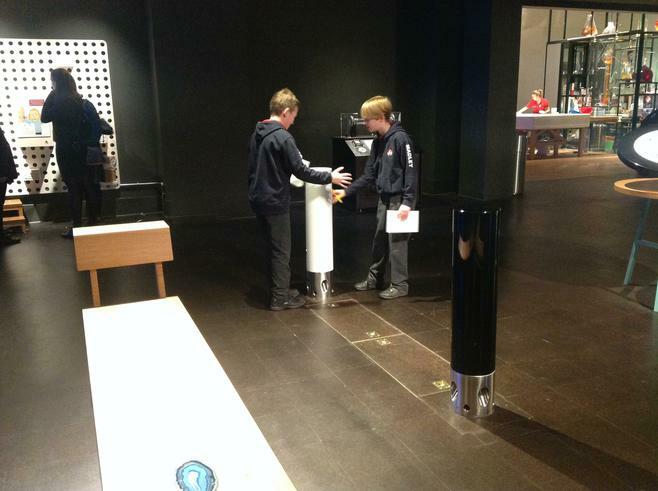 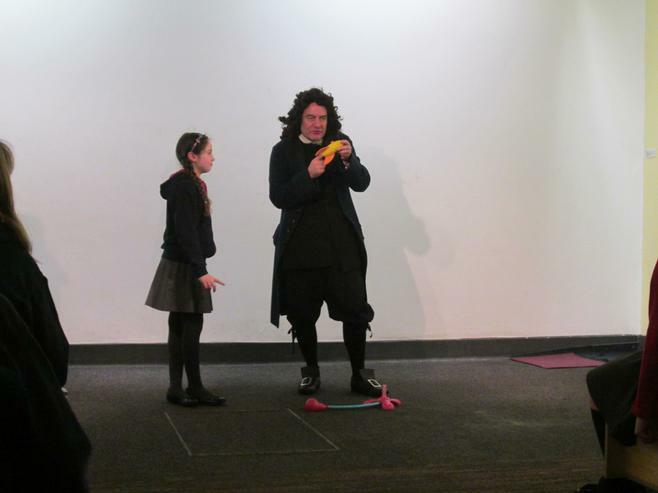 At the Science Museum, we met Sir Isaac Newton for a demonstration of his discoveries about gravity, then spent a full afternoon in the Wonderlab, which is an area filled with hands-on scientific activities. 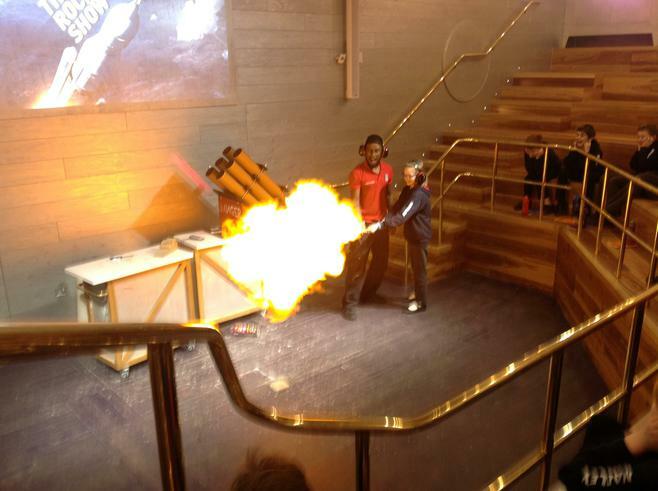 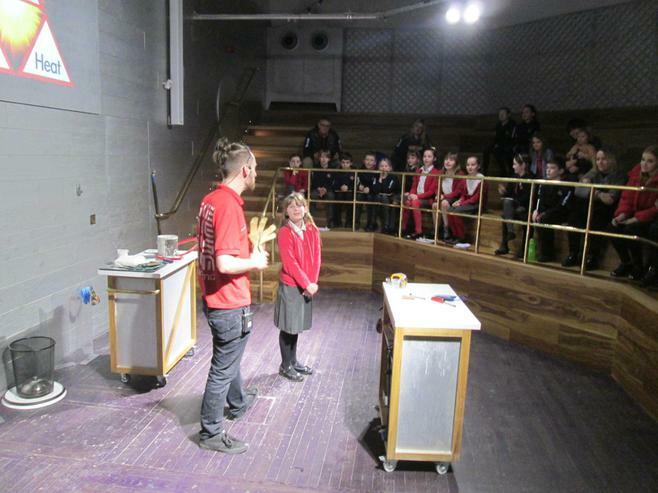 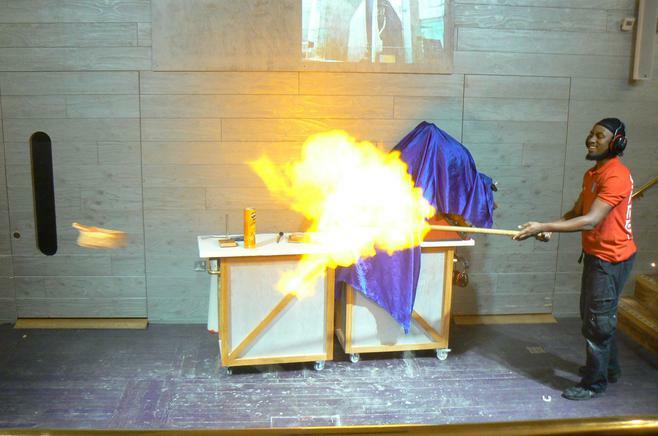 We managed to get ourselves into two workshops where we witnessed fire, explosions and close-up demonstrations of the effects of forces! 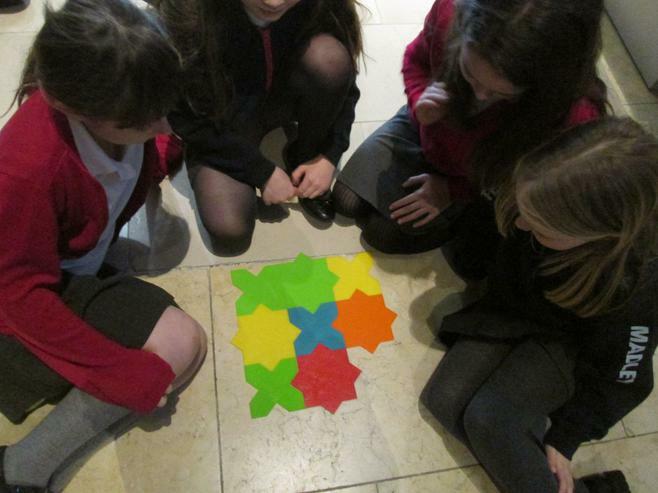 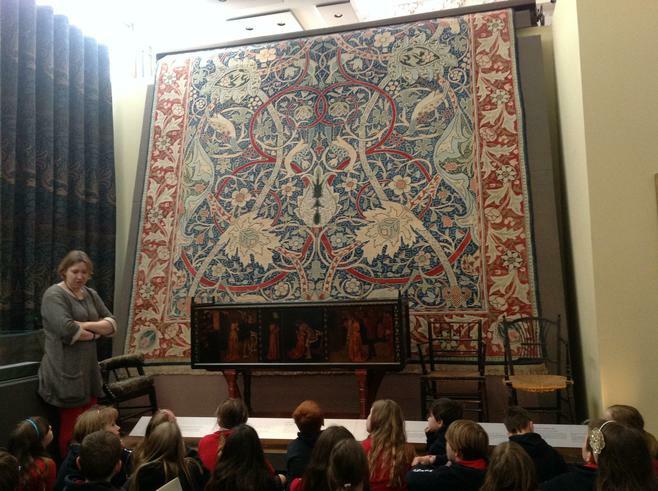 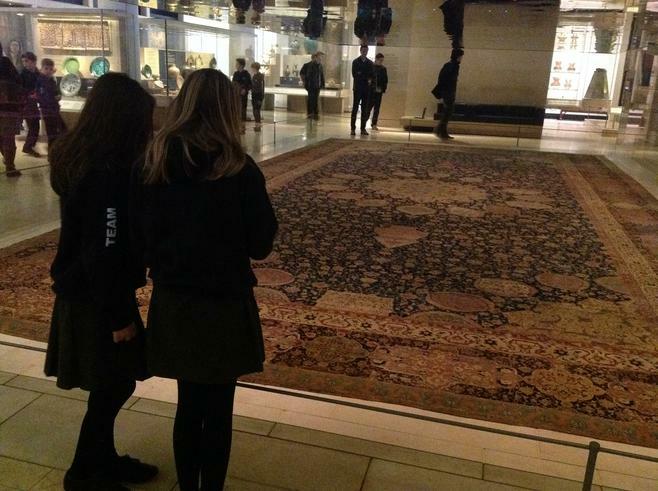 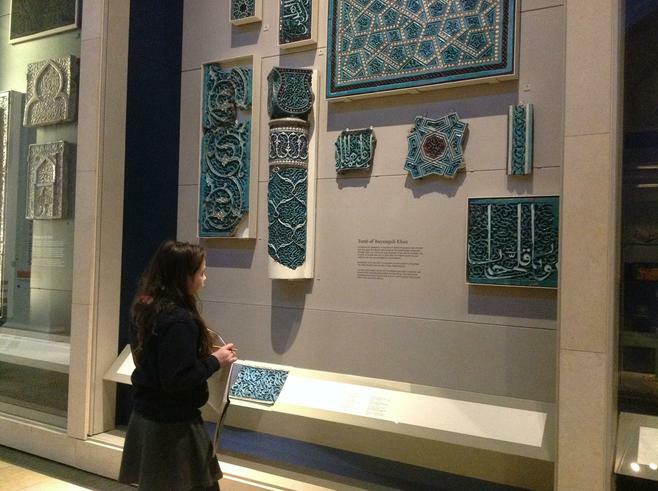 At the Victoria and Albert Museum the next day, we enjoyed a guided visit around the Middle East section of the gallery, exploring pattern and tessellation in Islamic Art, then finishing with a look at the work of William Morris who was so inspired by these artworks. 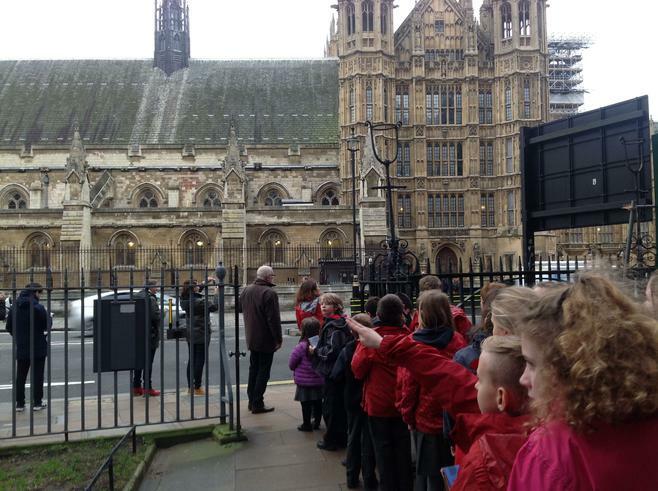 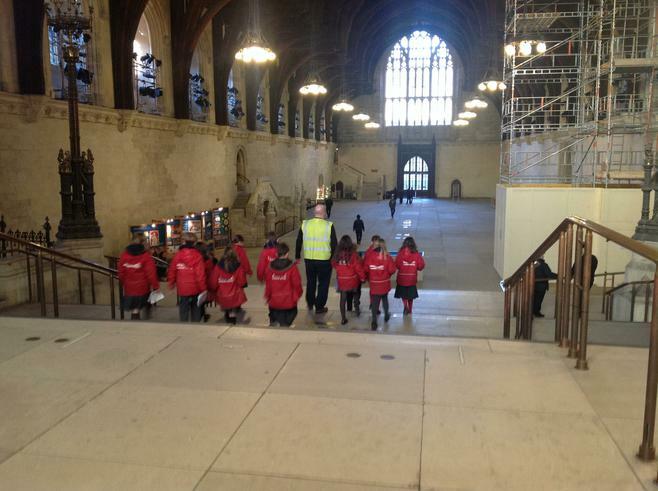 Our visit to London continued with a tour around the Houses of Parliament, where we were able to see a debate in the House of Commons (to do with train company performances) and participate fully in a workshop about how democracy works in the UK. 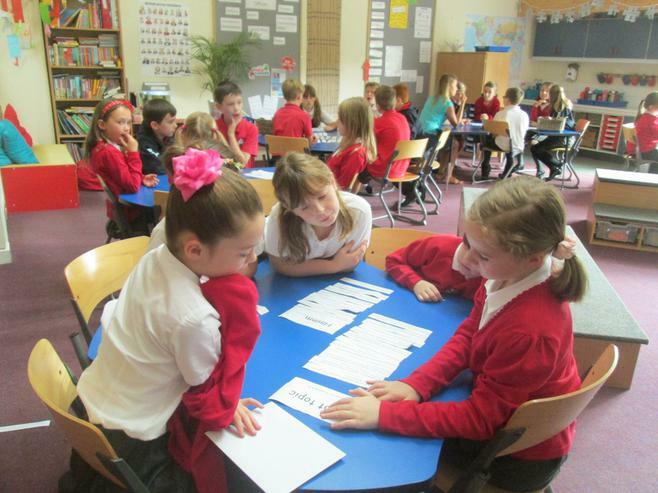 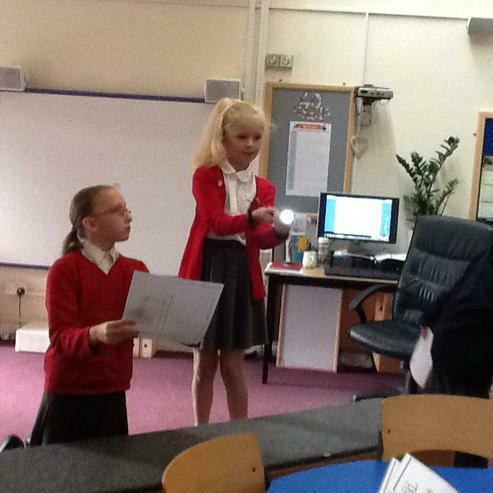 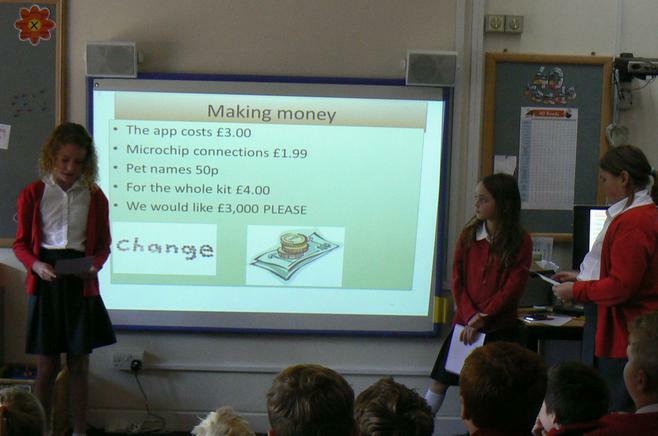 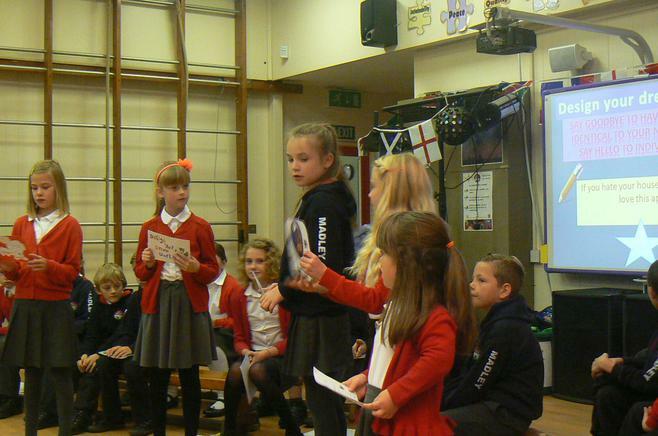 Well done to Charlie and Bethan for leading their parties during the discussions! 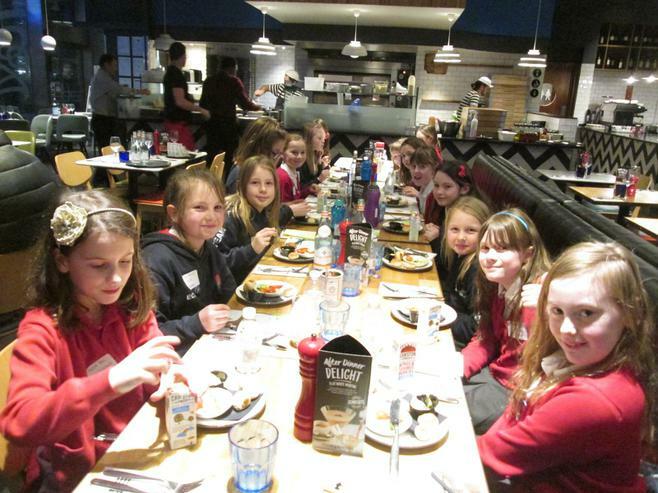 To bring our visit to a suitably celebratory conclusion, we then dined at Pizza Express on the riverbank, before heading home to Madley. 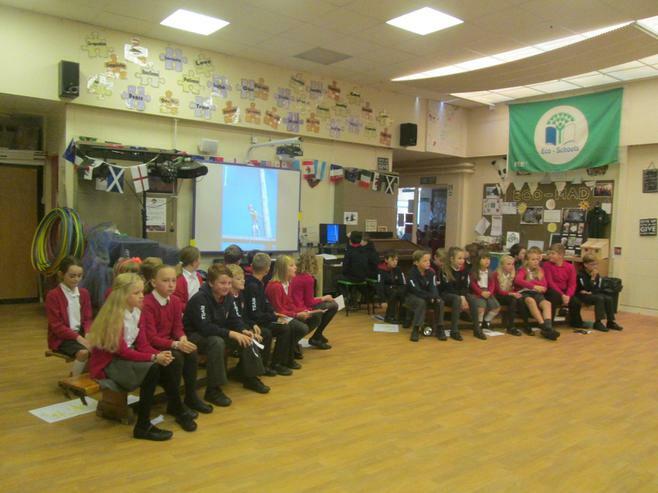 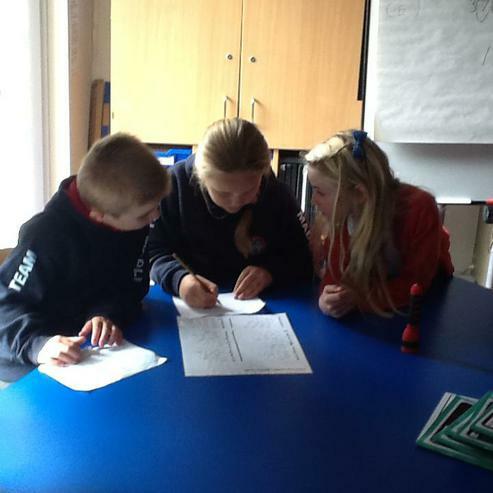 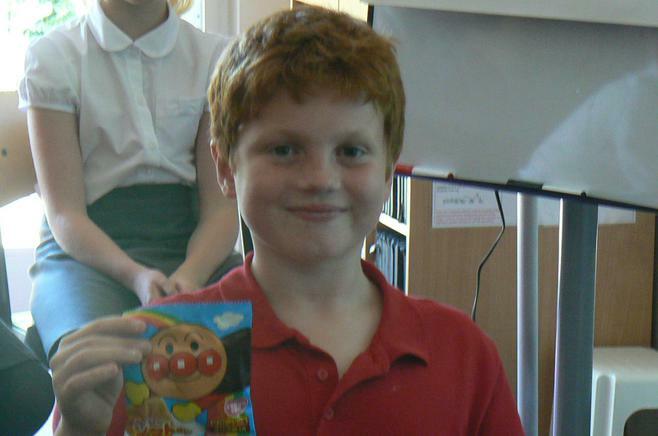 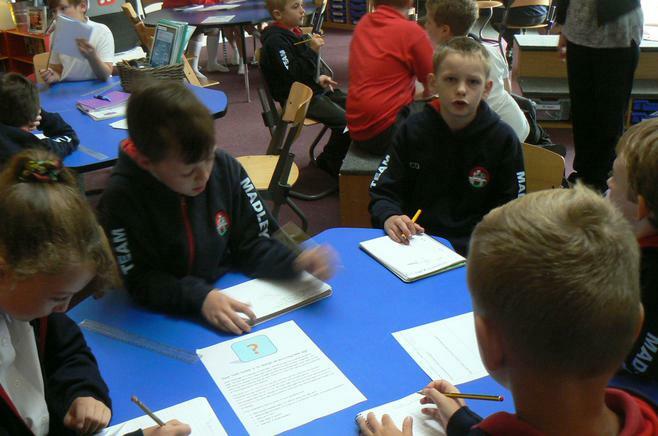 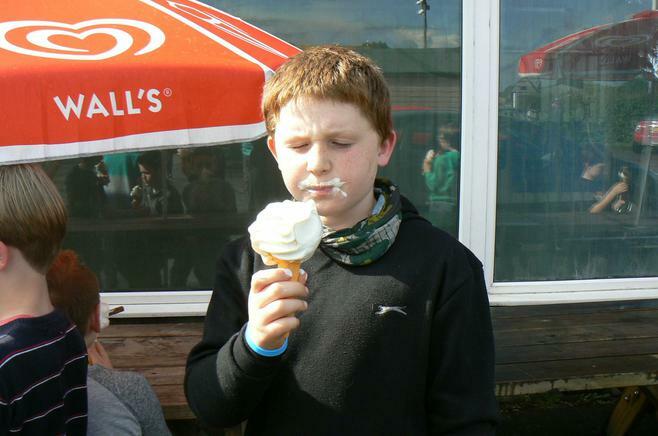 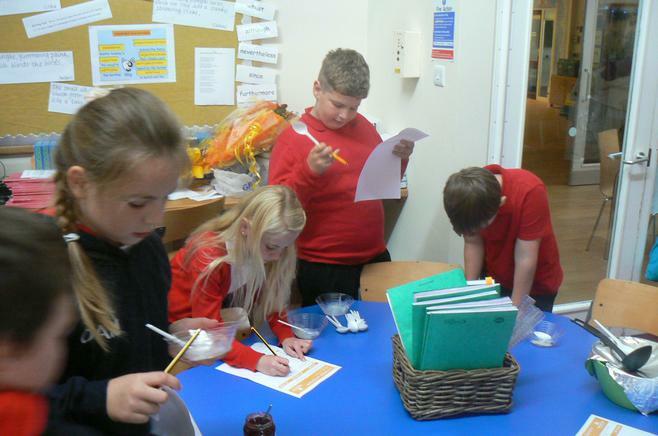 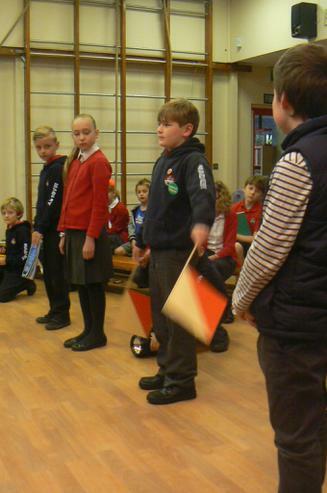 Class 5 were complimented throughout the visit on their excellent learning behaviour and manners. 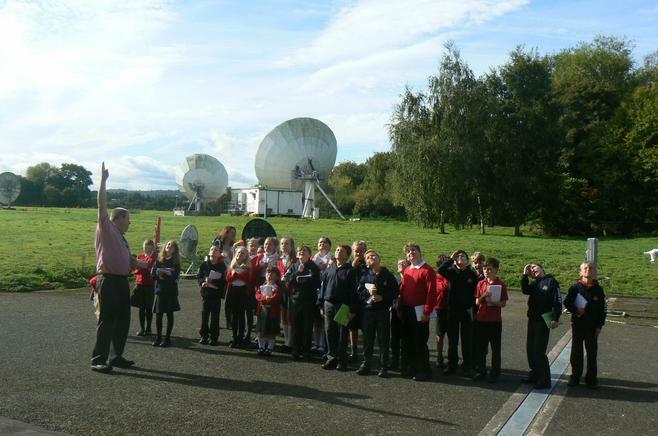 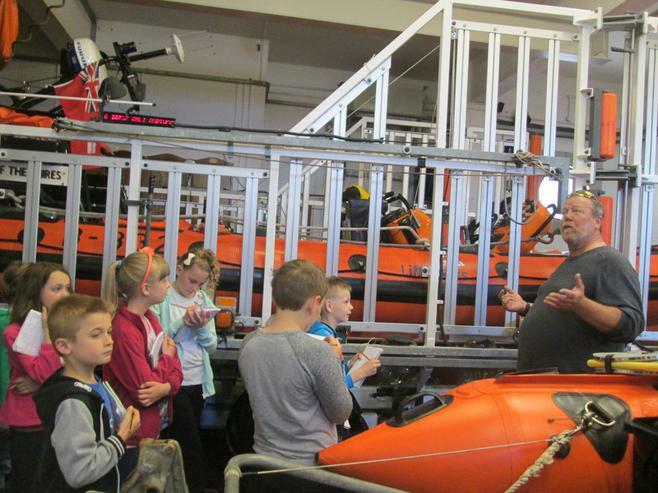 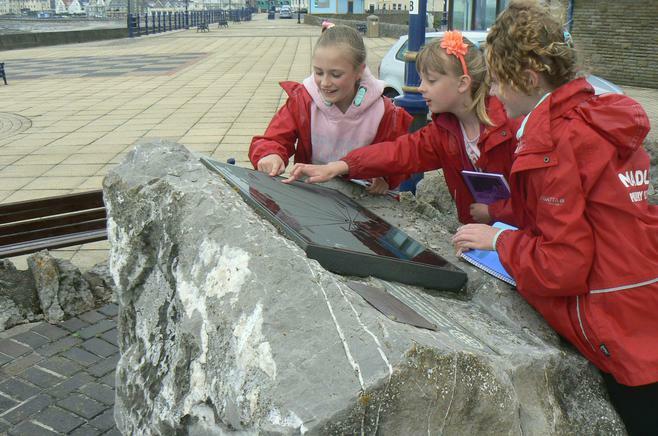 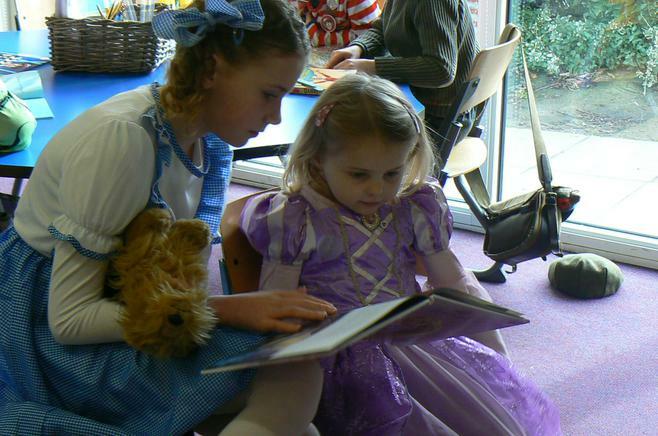 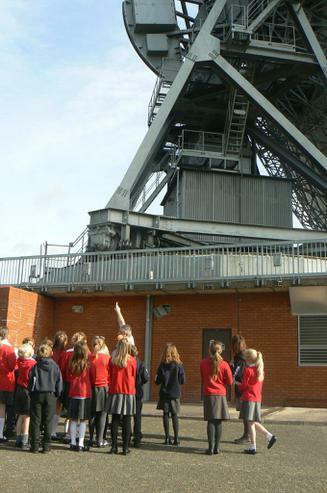 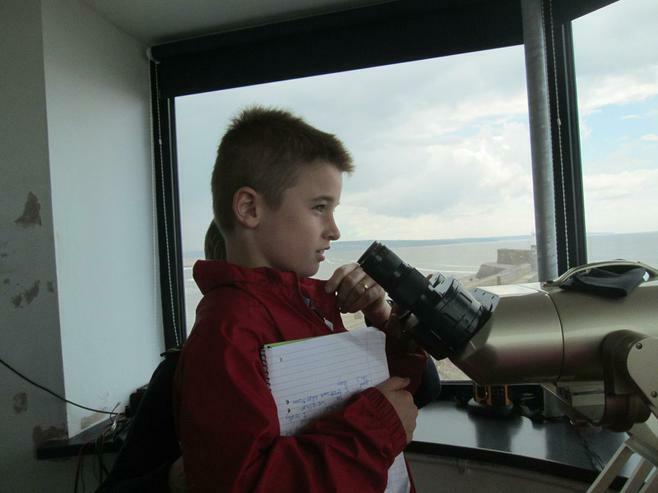 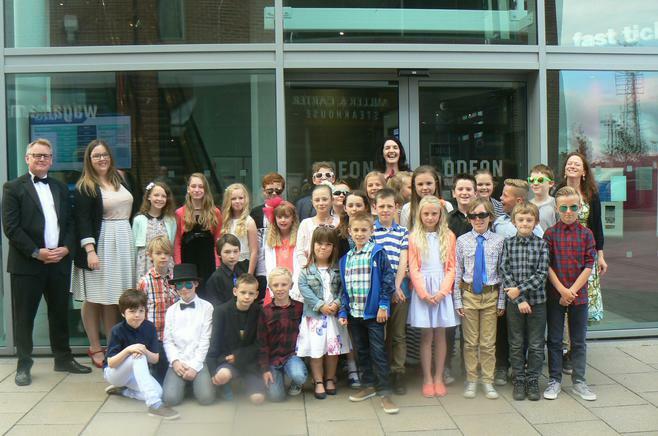 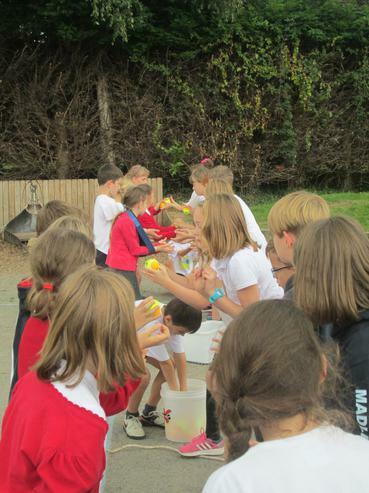 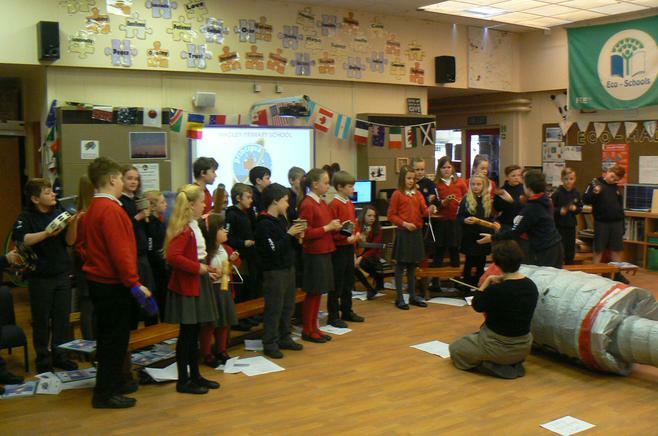 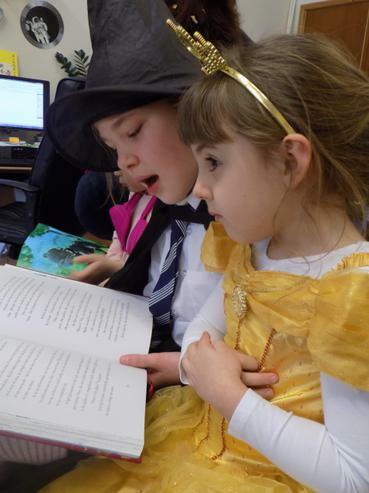 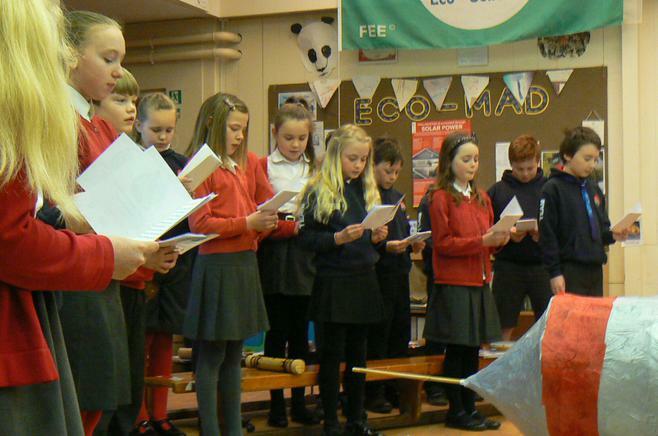 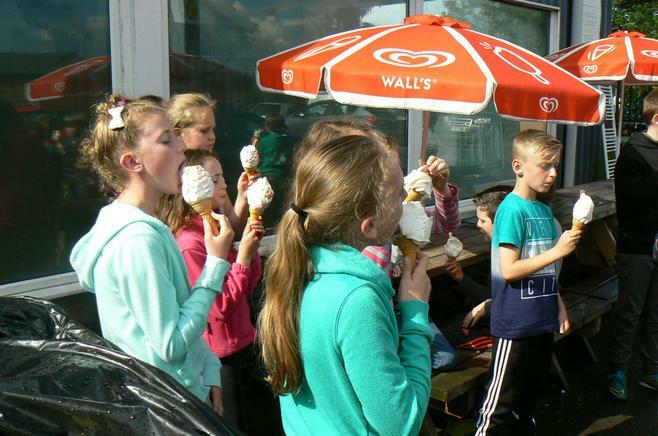 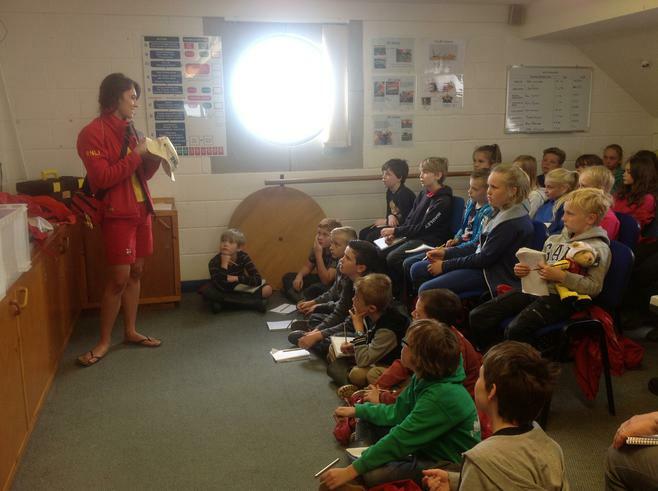 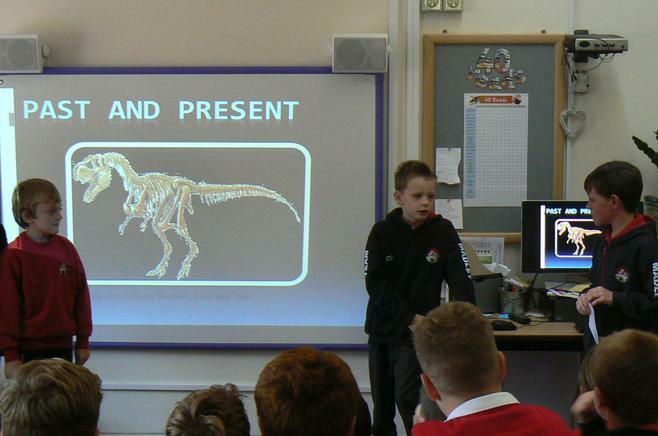 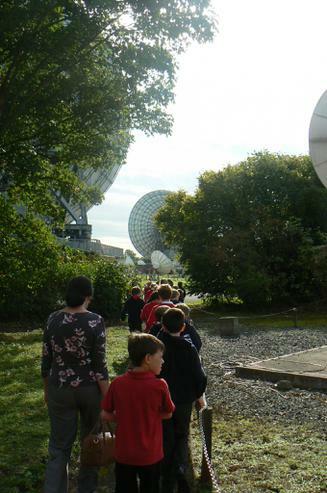 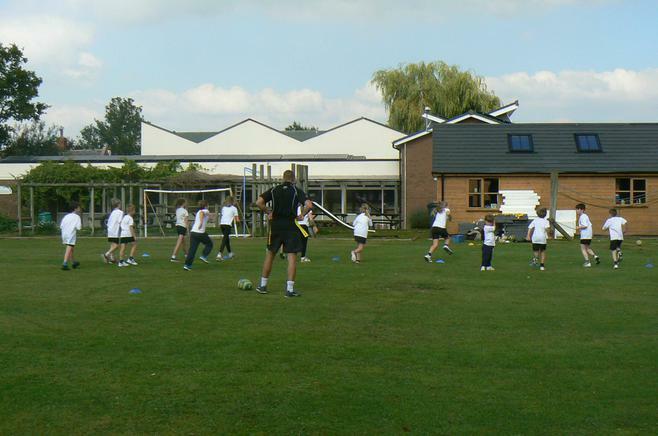 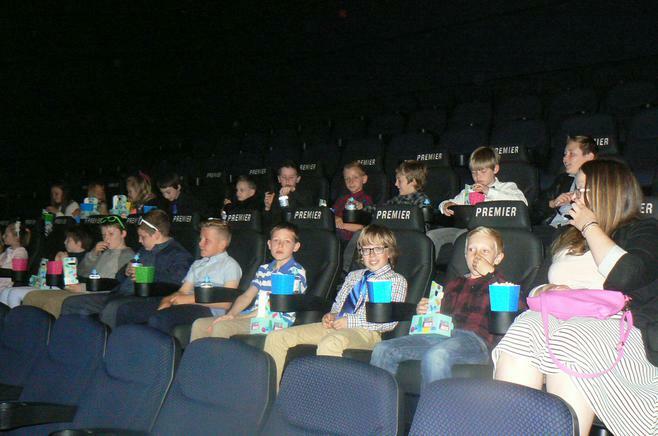 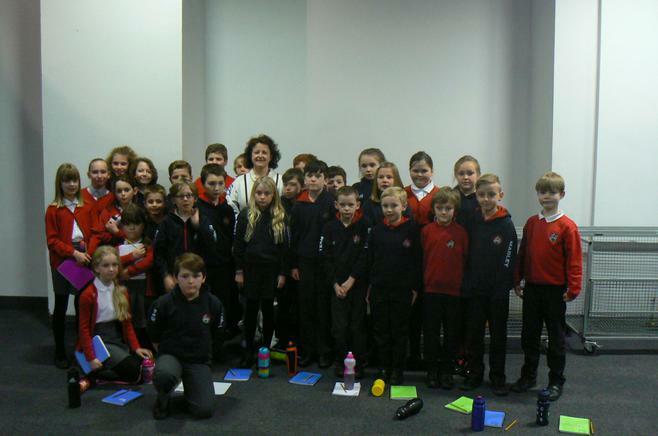 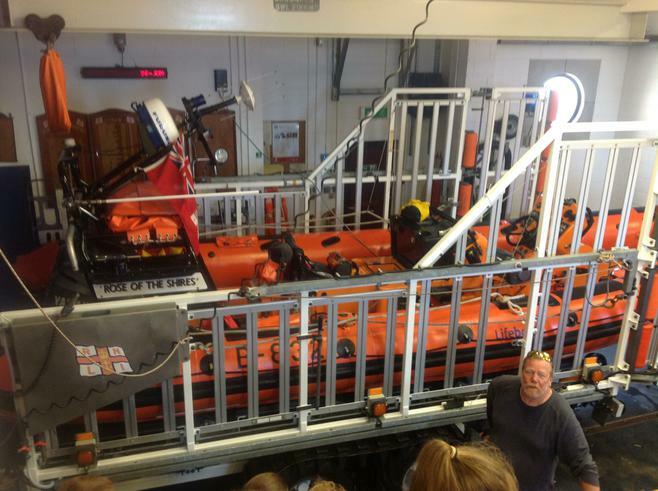 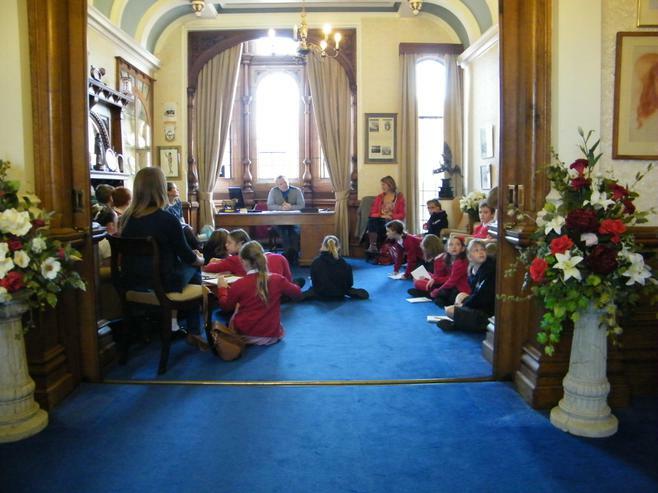 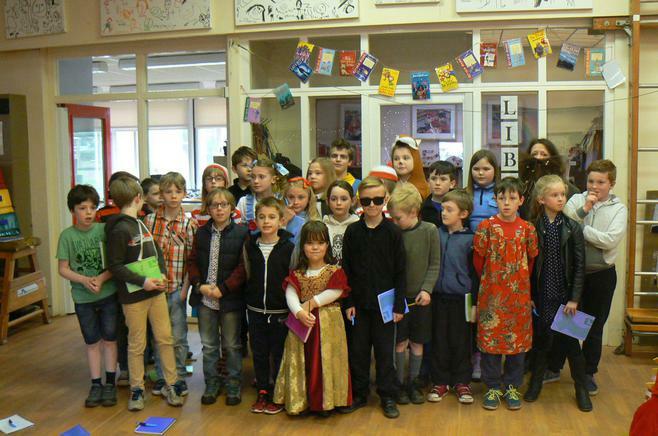 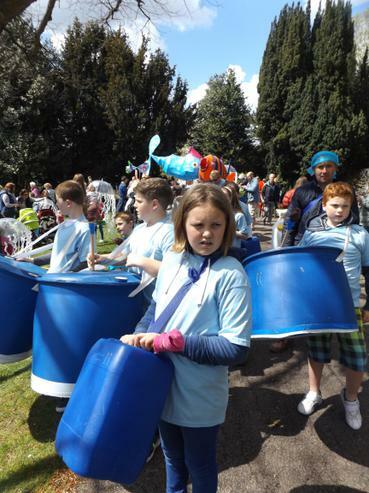 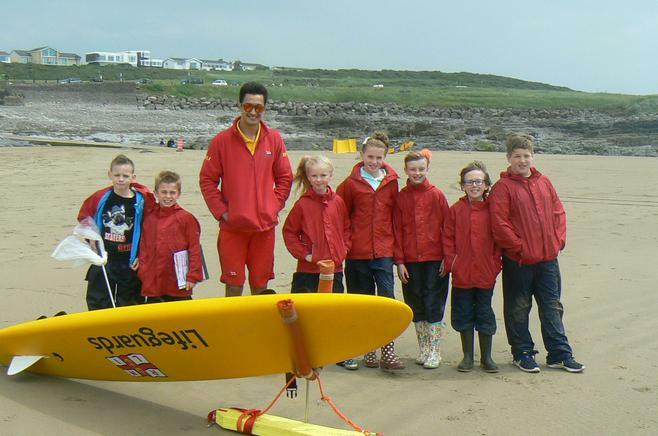 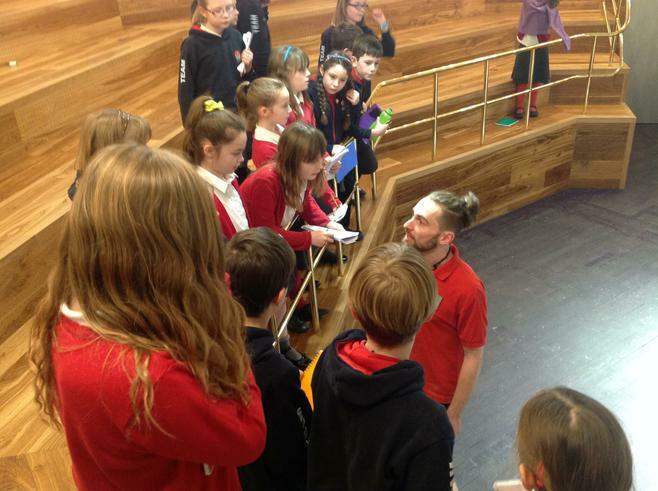 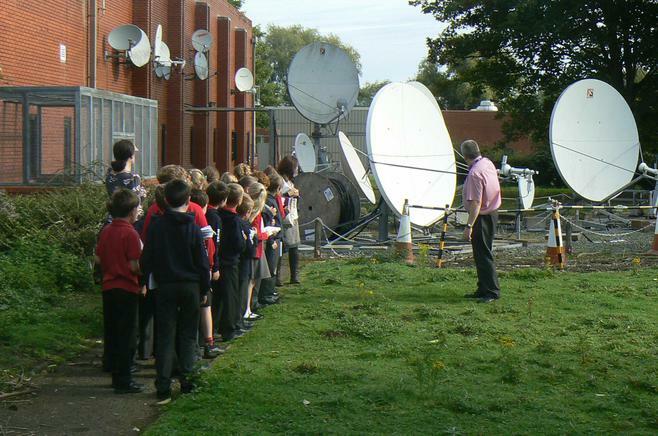 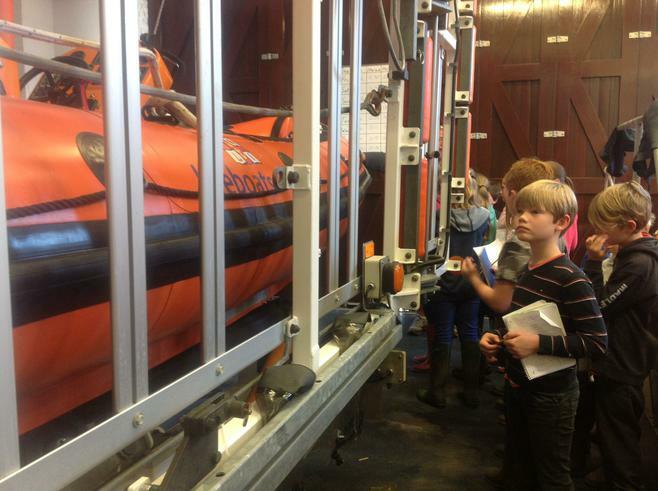 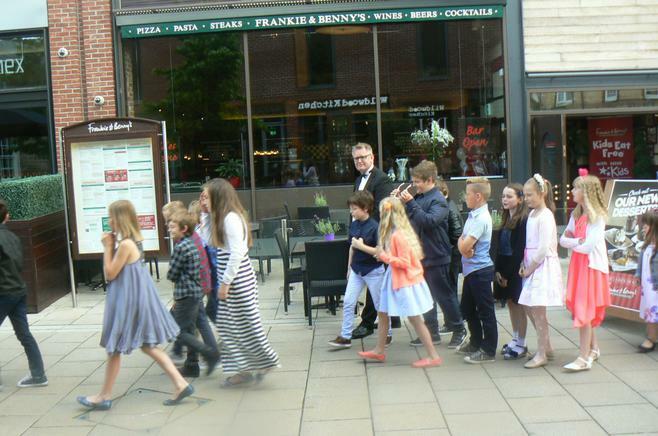 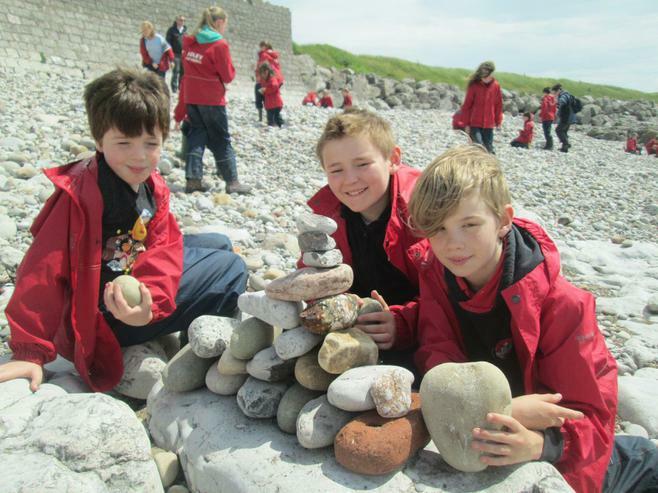 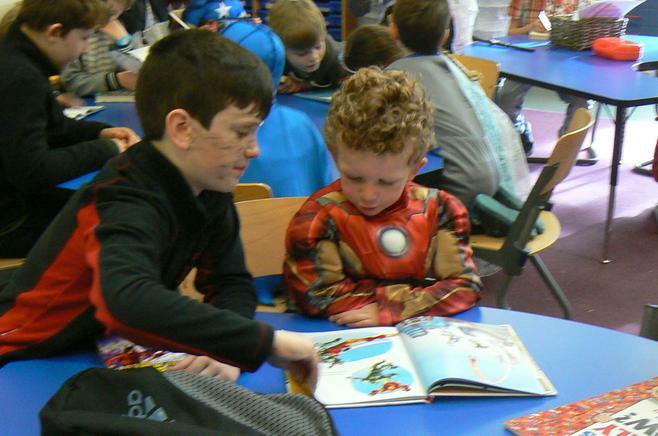 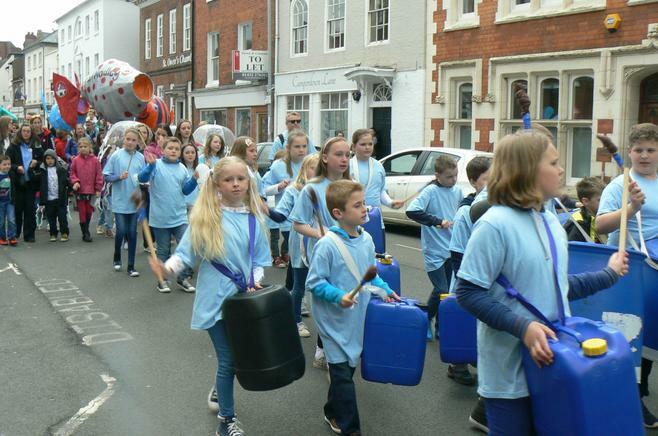 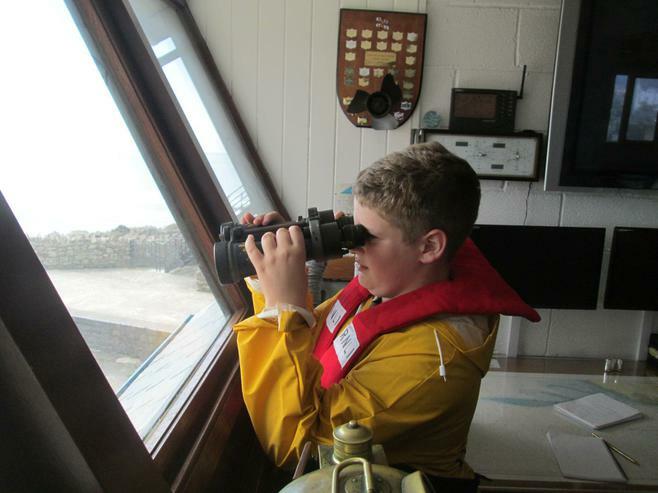 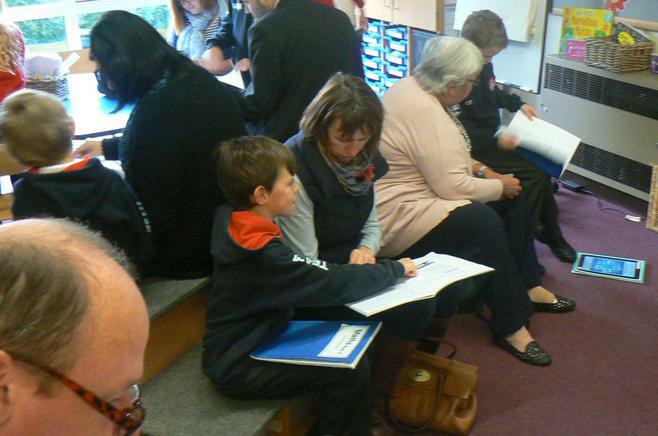 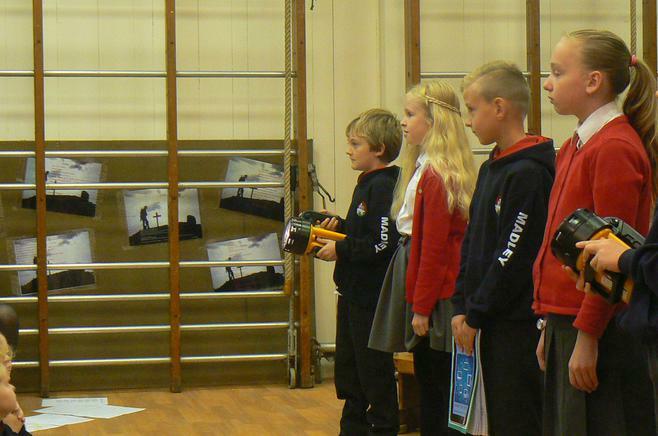 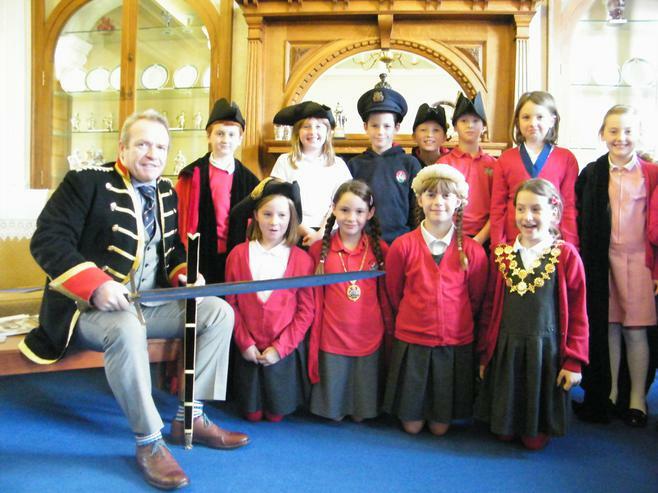 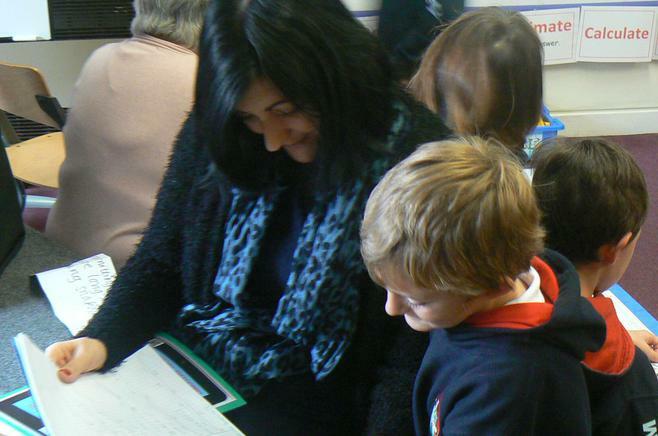 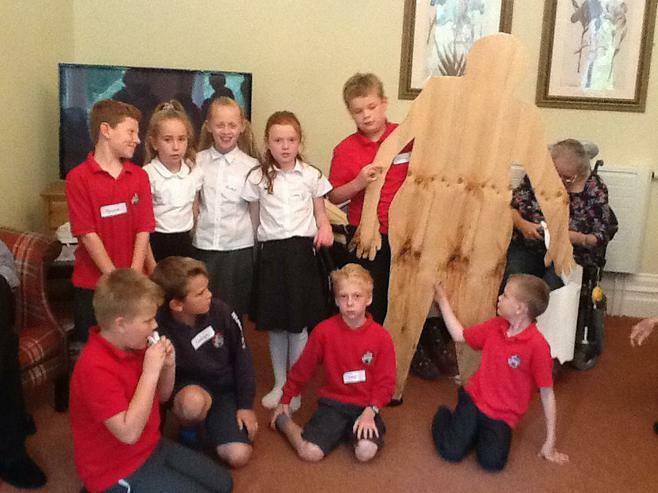 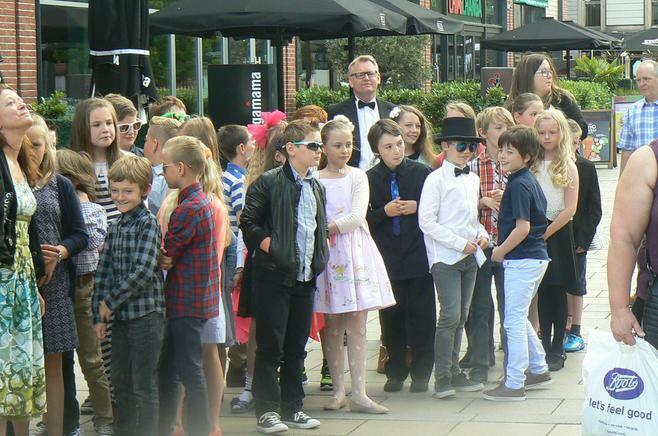 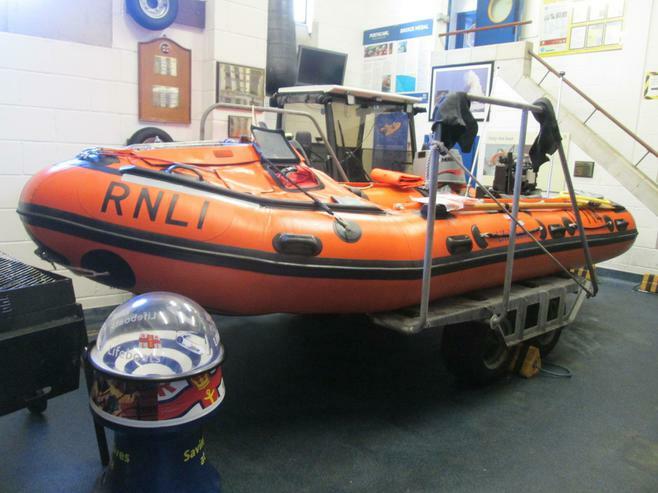 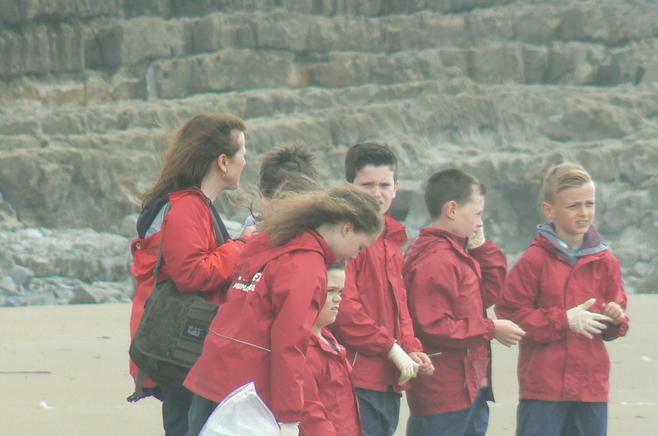 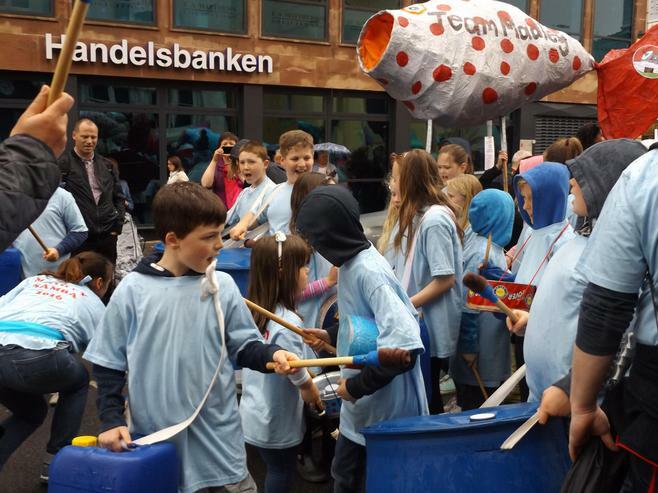 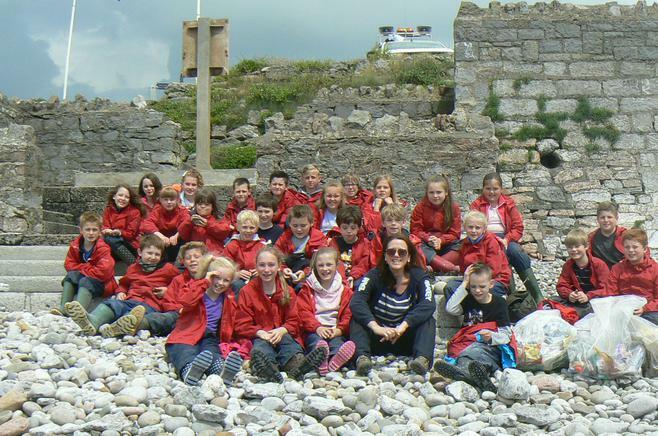 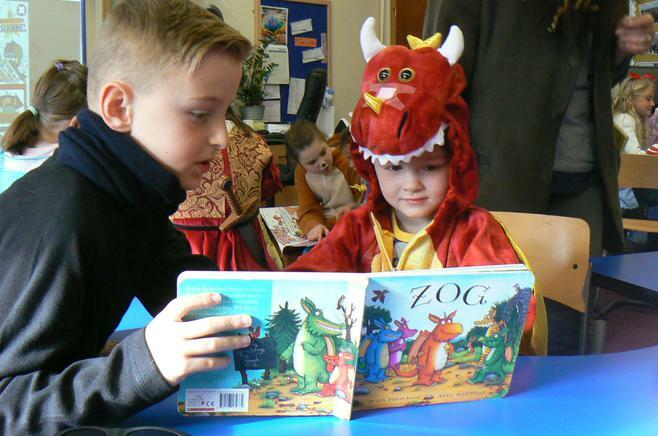 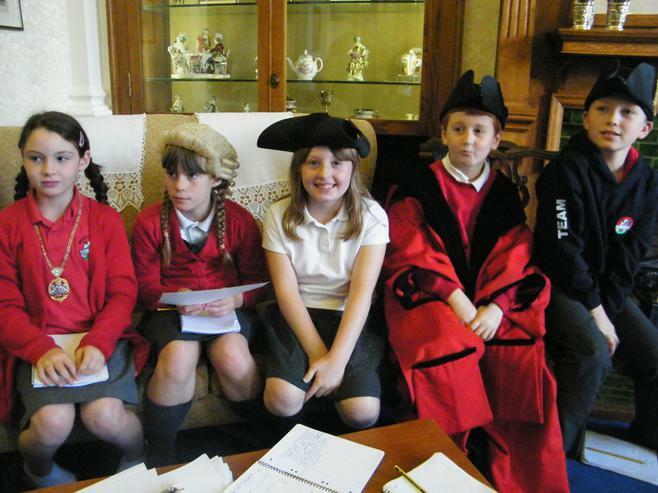 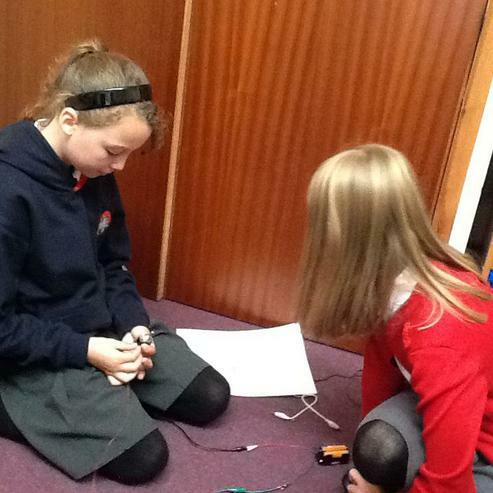 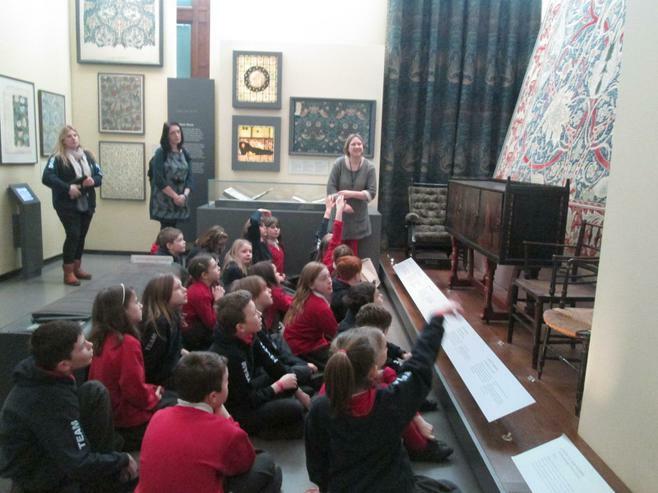 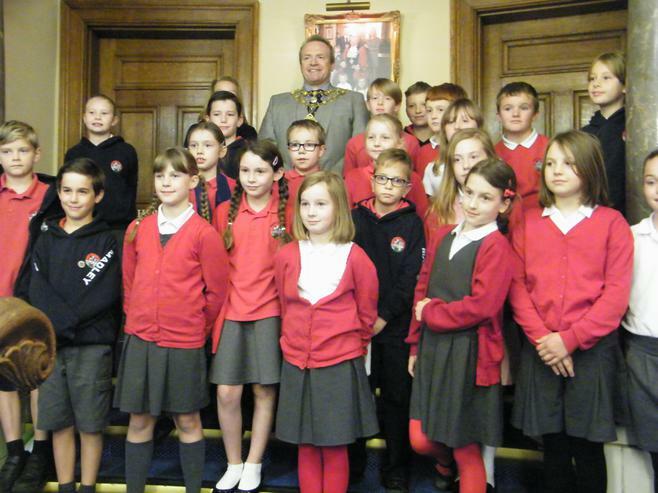 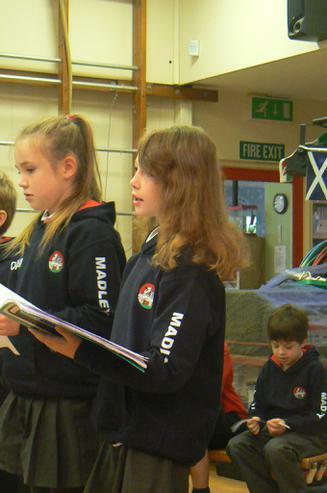 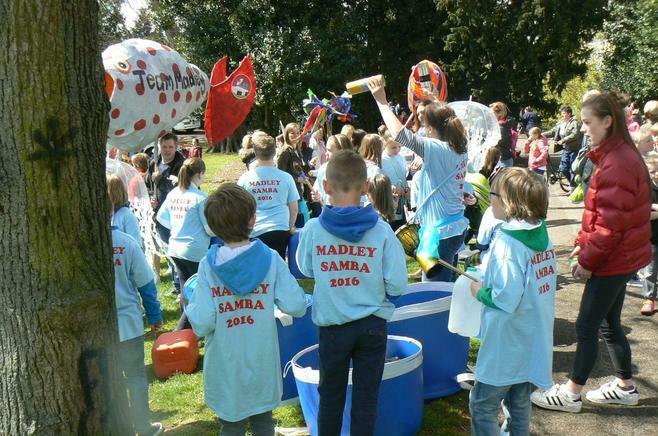 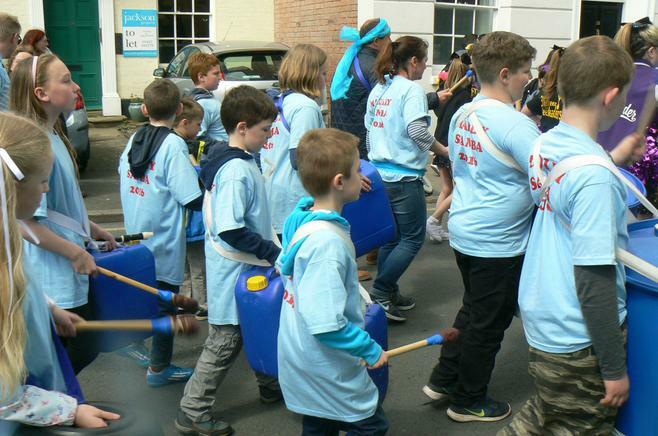 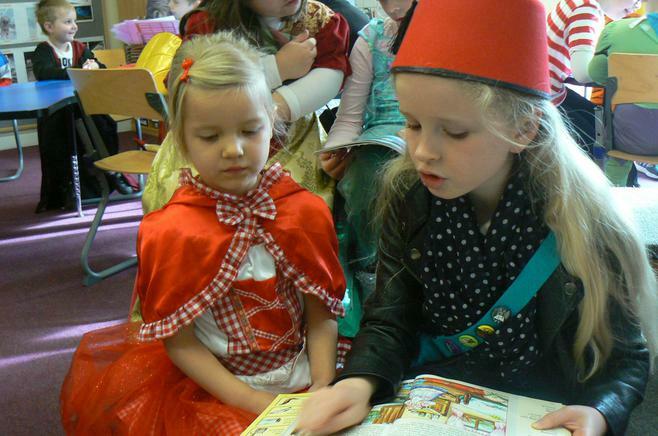 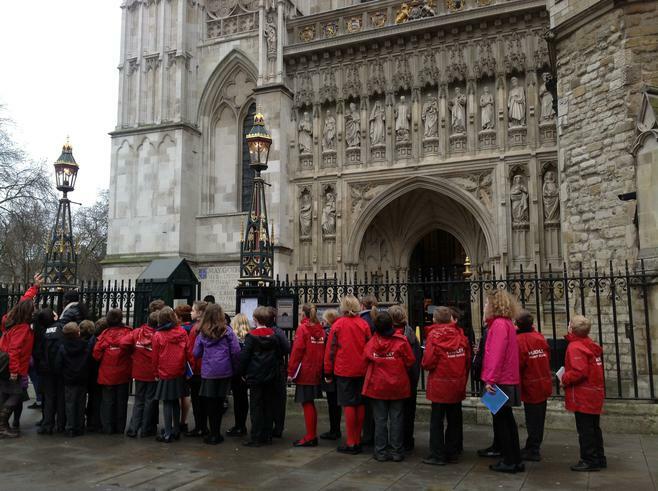 We are very proud of all of the children for making the visit such a resounding success! 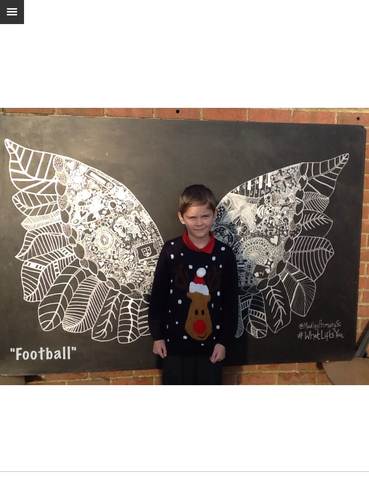 On the last day of the Christmas term, Class 5 children had the opportunity to work on a very special project with Mrs Delahoy, linked into our theme of street art which we have been exploring in our Friday focus groups. 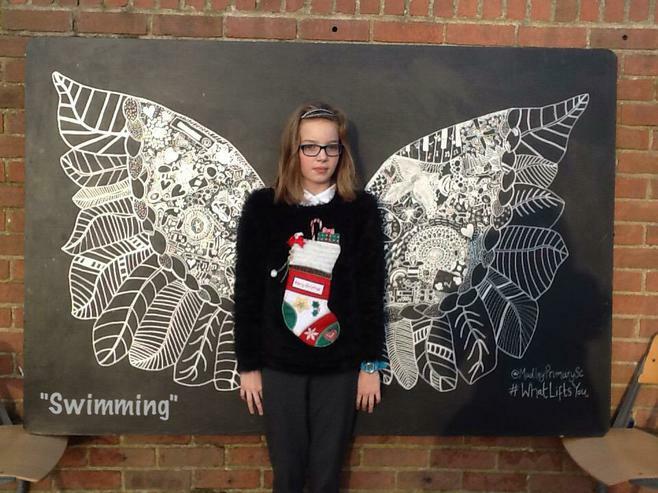 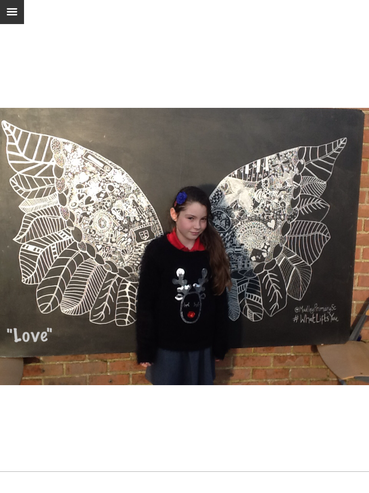 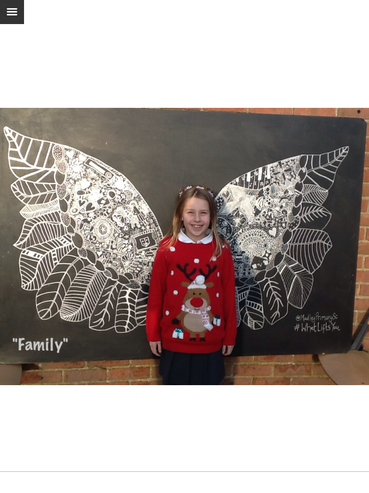 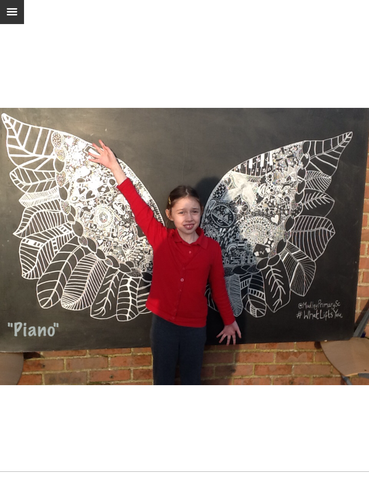 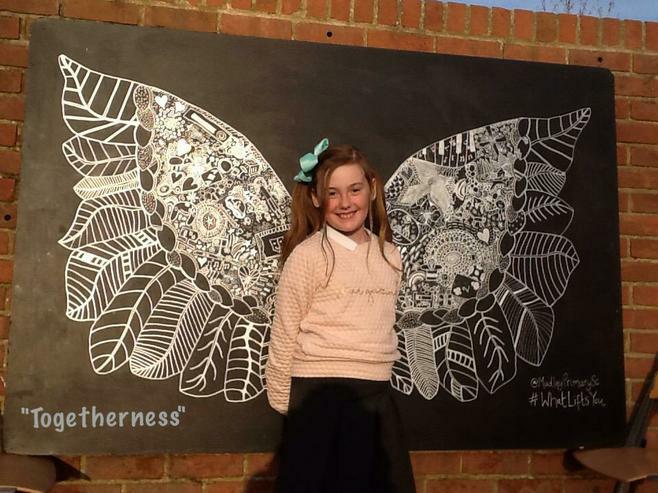 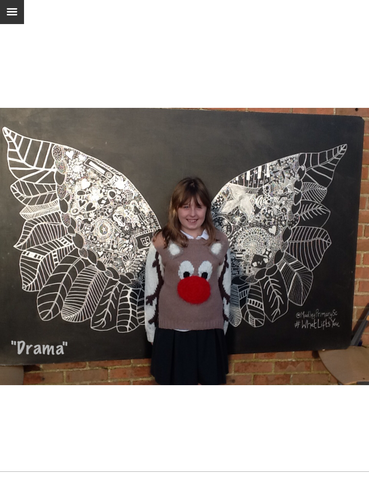 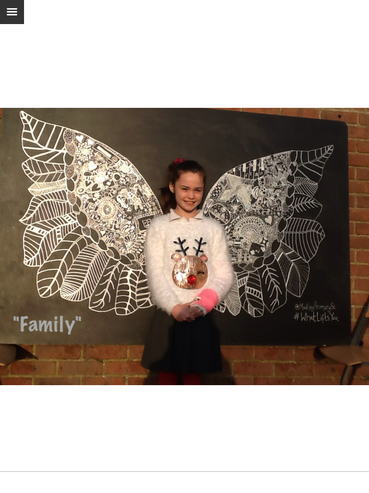 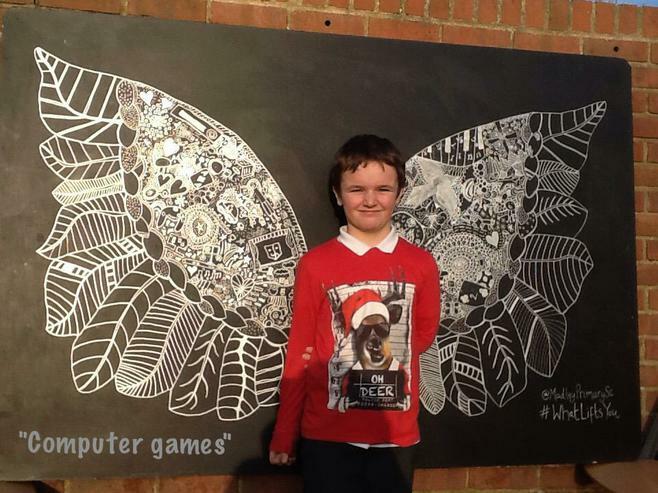 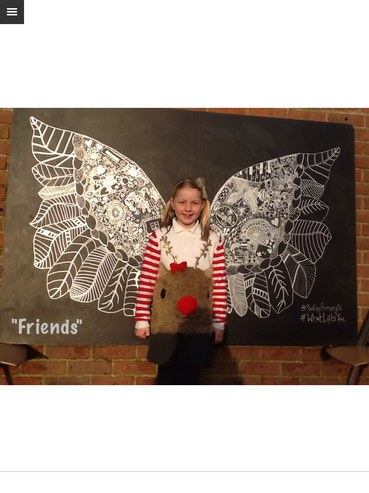 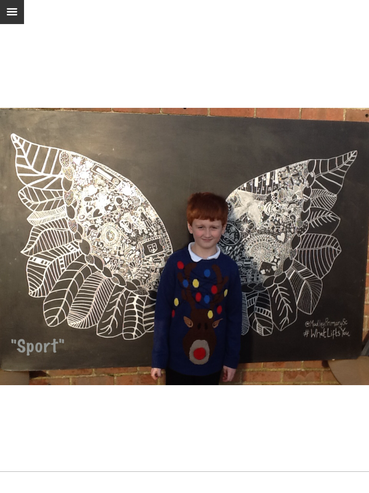 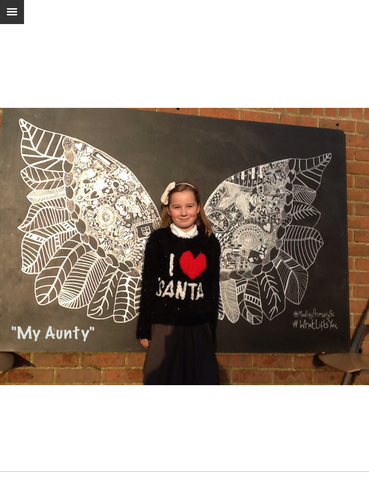 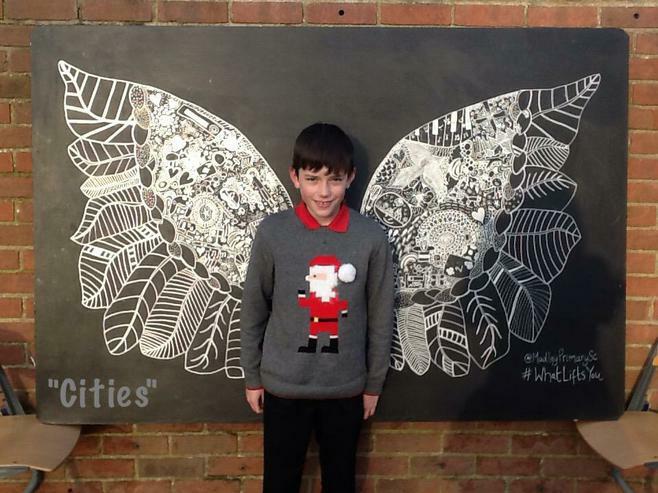 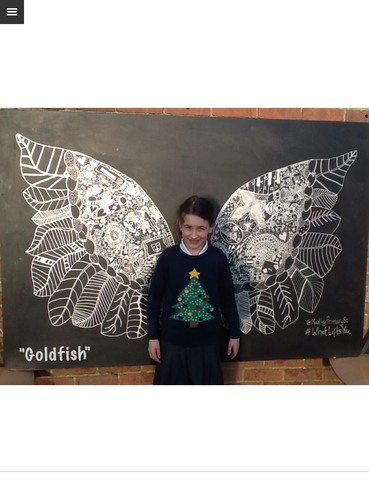 Inspired by the work of Kelsey Montague, Class 5 created their own set of angel wings, which will shortly be mounted outside school for all to use. 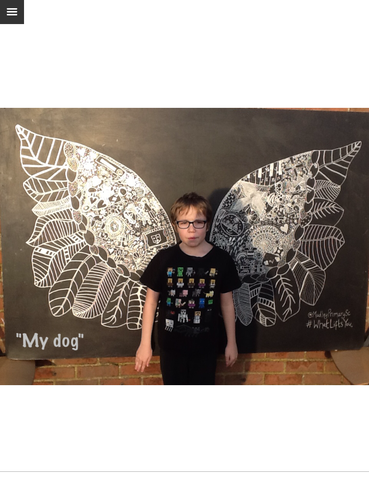 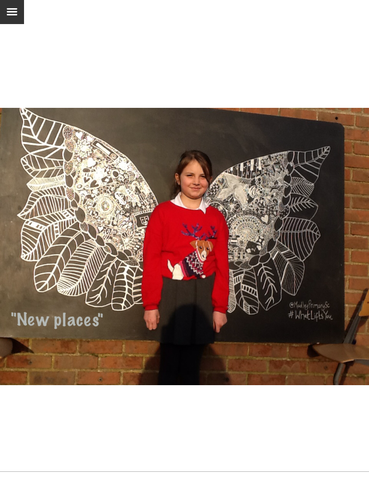 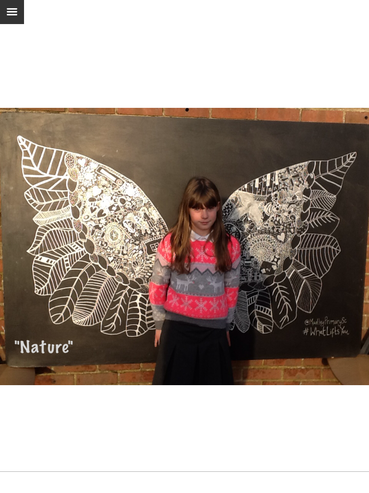 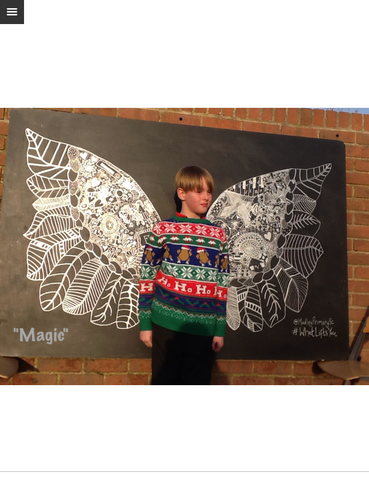 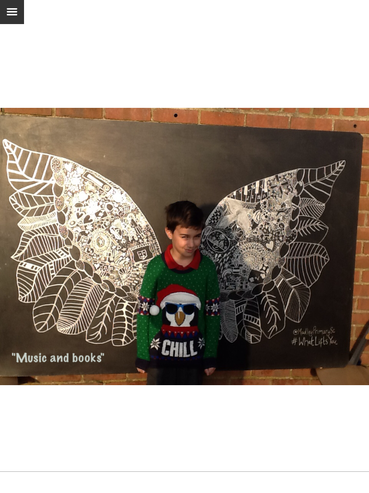 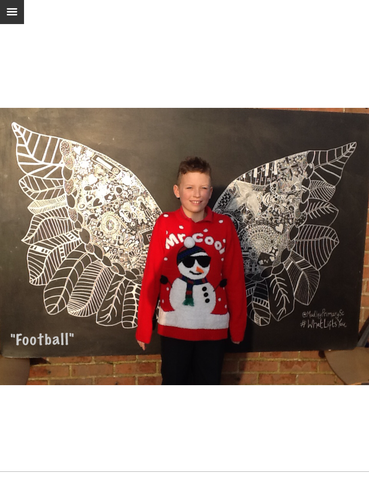 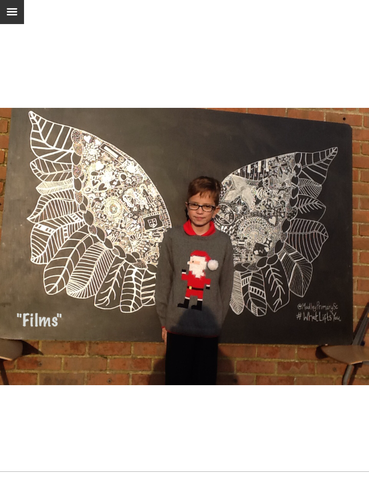 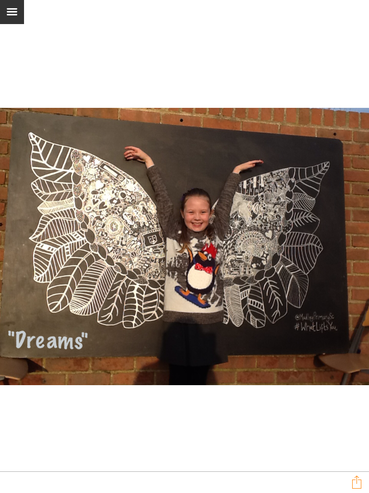 The children considered what 'lifts' them in life, designed and drew a portion of the wings to reflect this, then we added their ideas to the final photographs. 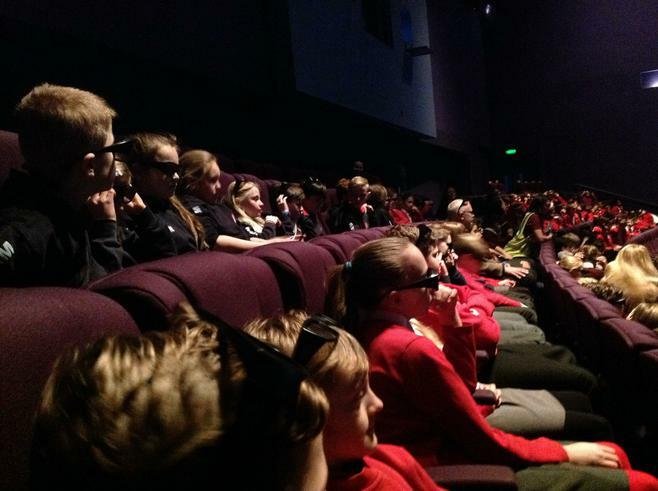 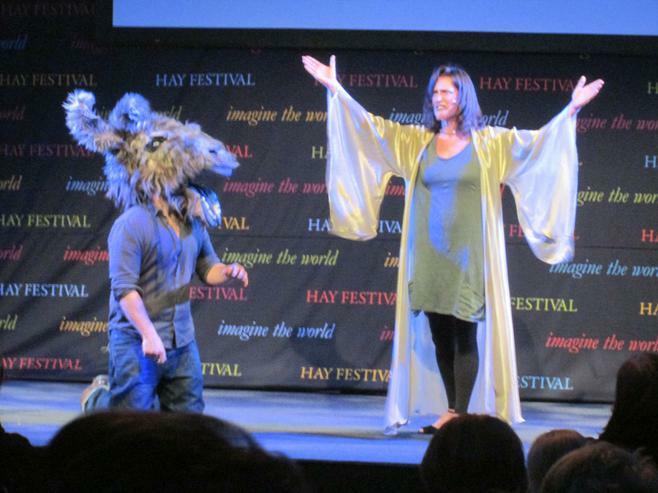 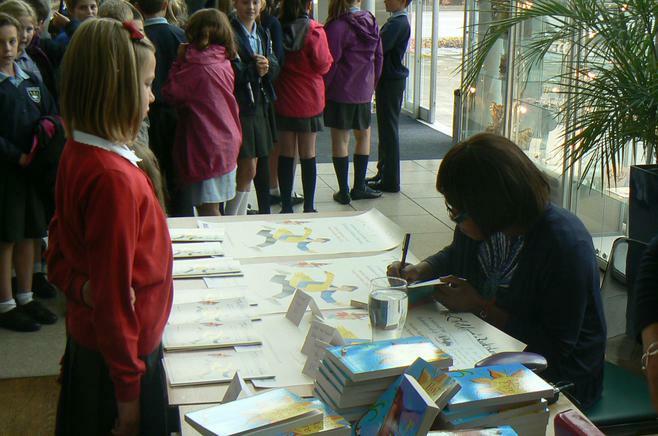 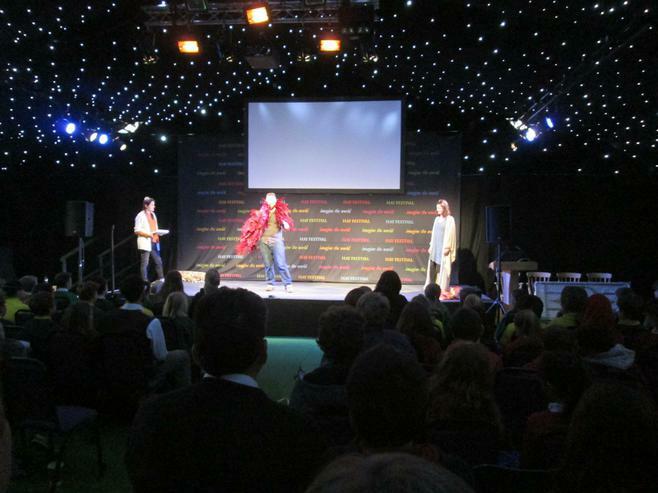 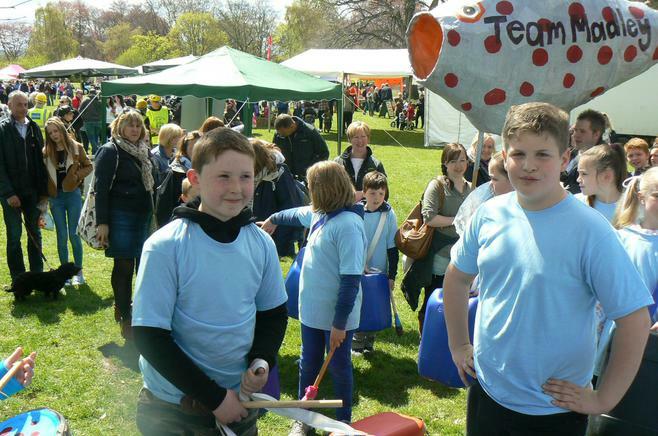 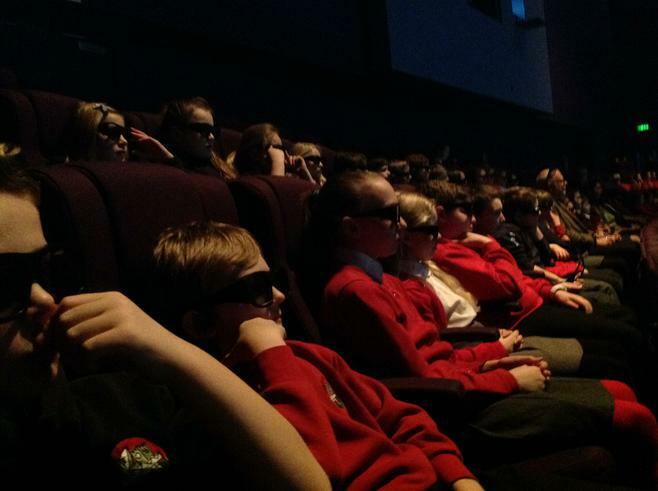 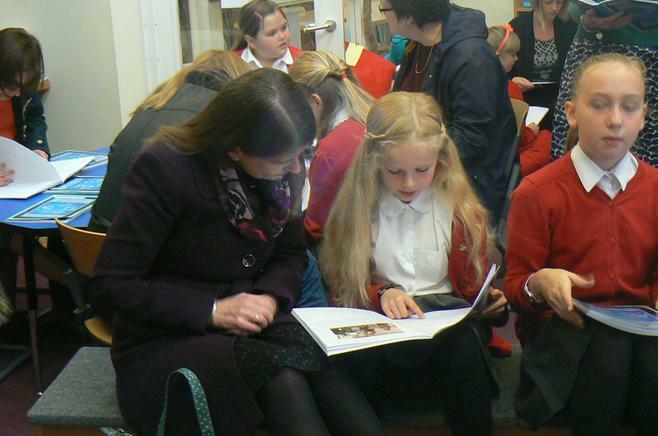 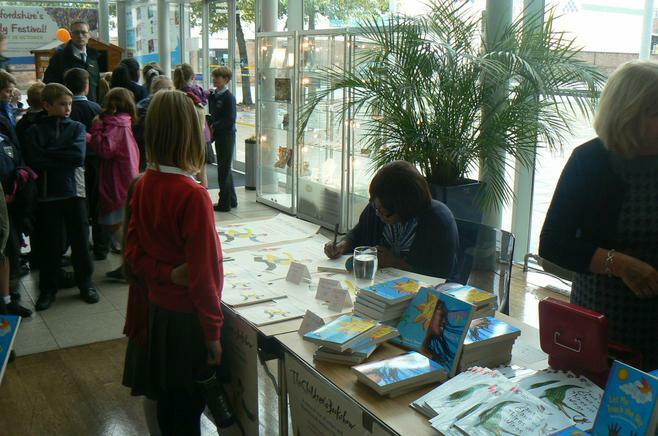 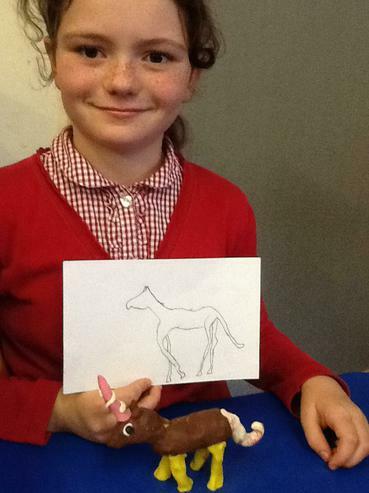 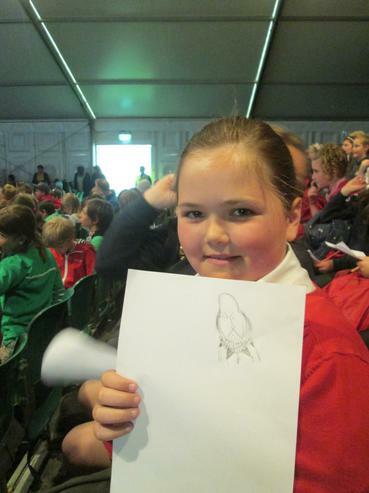 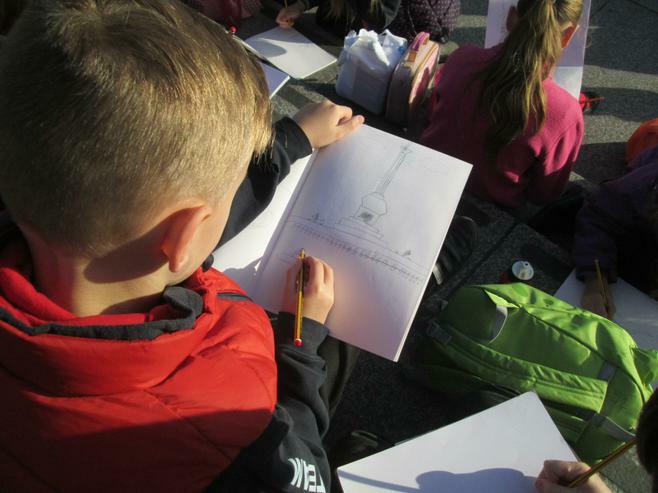 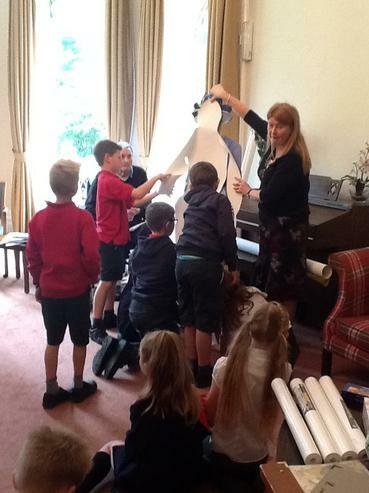 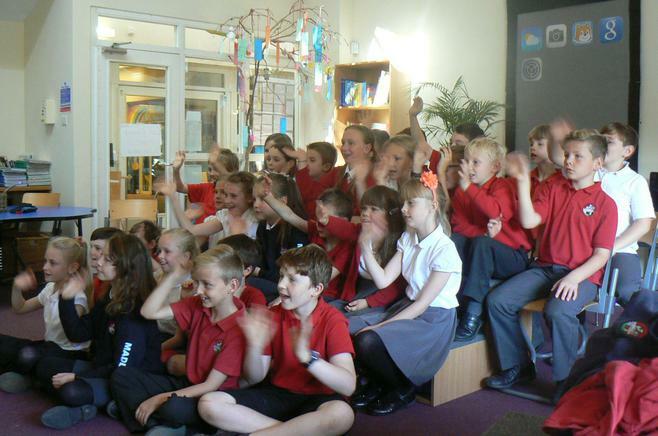 Year 5 spent the day at the Hay Festival on 26th May, meeting authors, illustrators, an animator and actors. 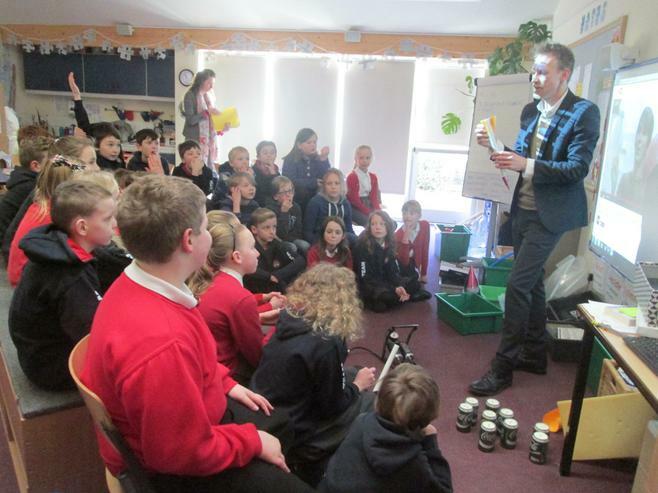 We started our day with Curtis Jobling, who created Bob the Builder and worked in the animation industry for many years before writing fiction for children. 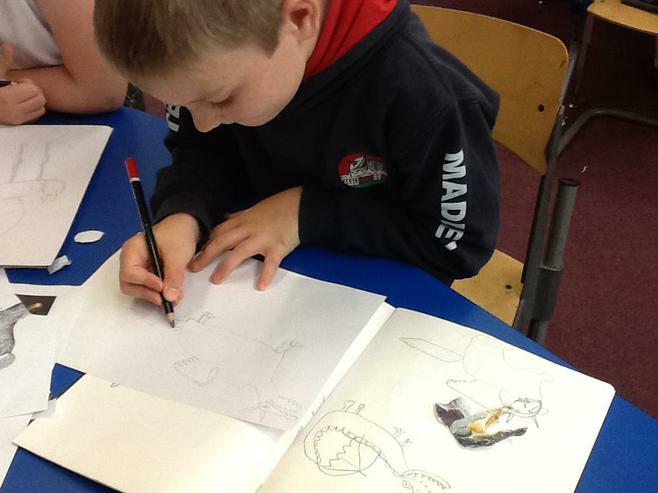 He showed us some of his latest animation work for Nickelodeon as well as drawing the Bob the Builder characters for us. 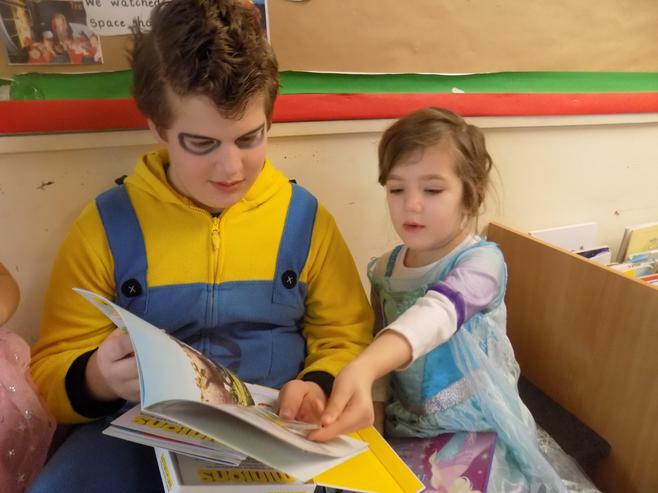 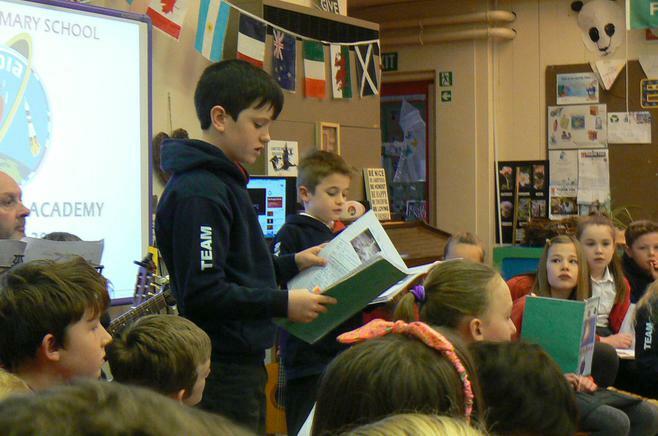 He then introduced us to his fiction, reading from 'Max Helsing - Monster Hunter' and describing some of the vampires, ghouls and gargoyles in Max's world. 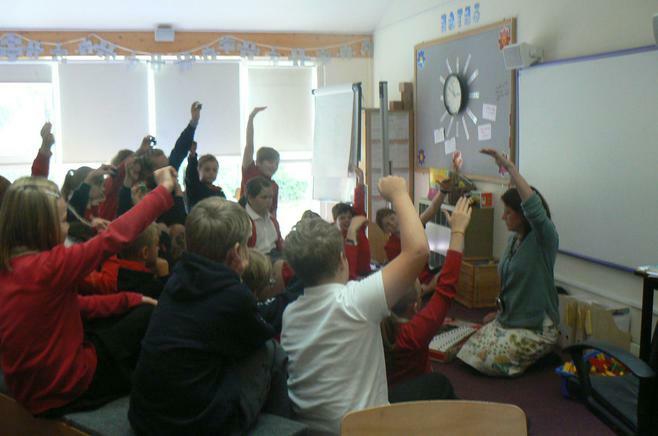 Next, we found out about 'The Boy in the Globe' with the author, Tony Bradman - a book about a boy who meets William Shakespeare. 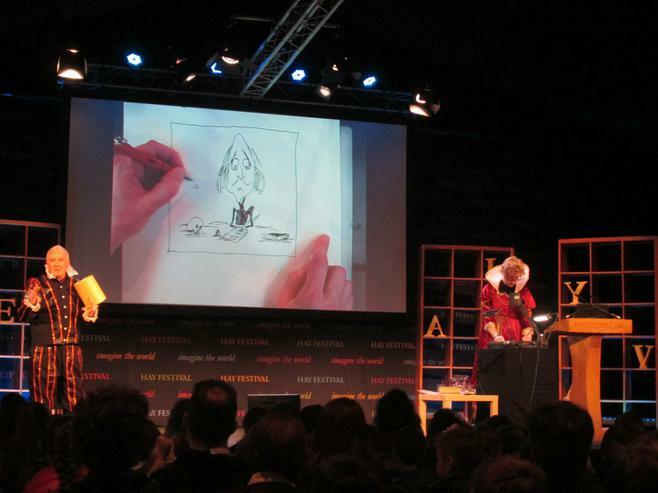 This was accompanied by live drawing from the illustrator, Tom Morgan-Jones, and we all drew William Shakespeare along with him! 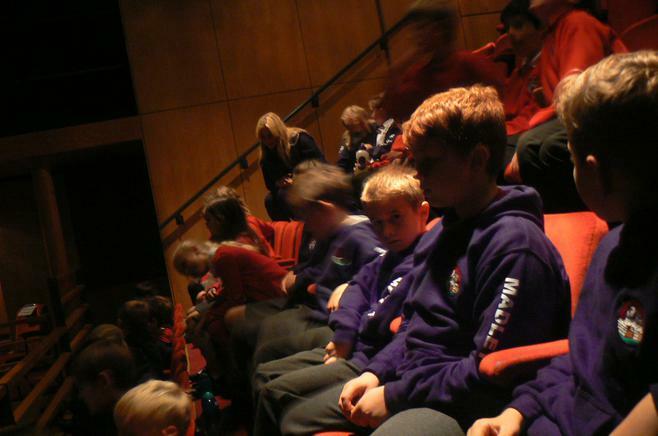 After a picnic lunch on the grass, we then were lucky enough to work with the Royal Shakespeare Company on A Midsummer Night's Dream, a workshop which really brought the play to life for us. 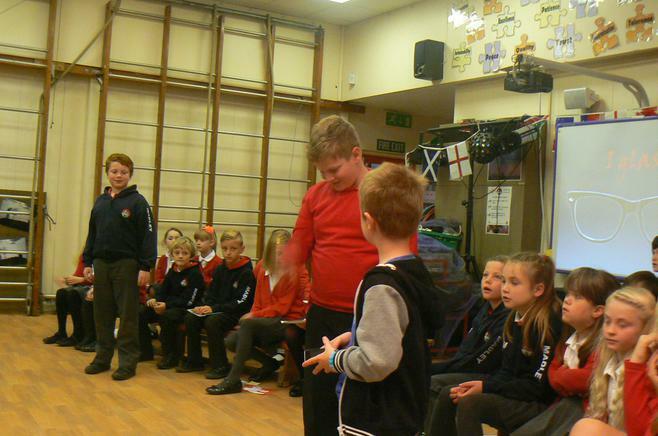 Taking a small starring role were our own James and Rory, who got up on stage to throw Shakespearean curses at each other in character as Oberon and Titania. 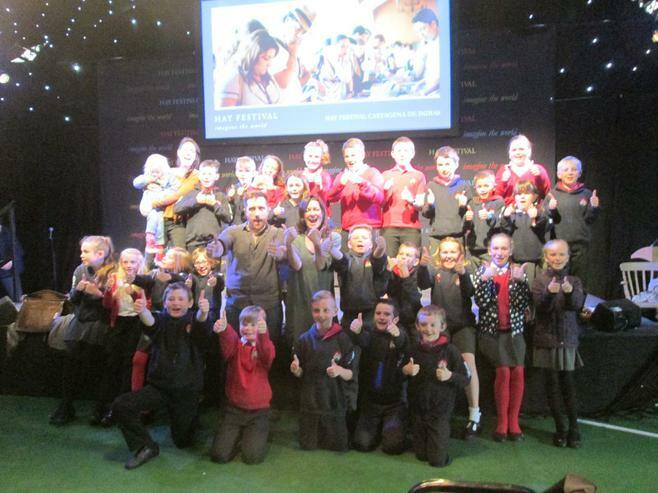 An absolutely fantastic and inspirational day! 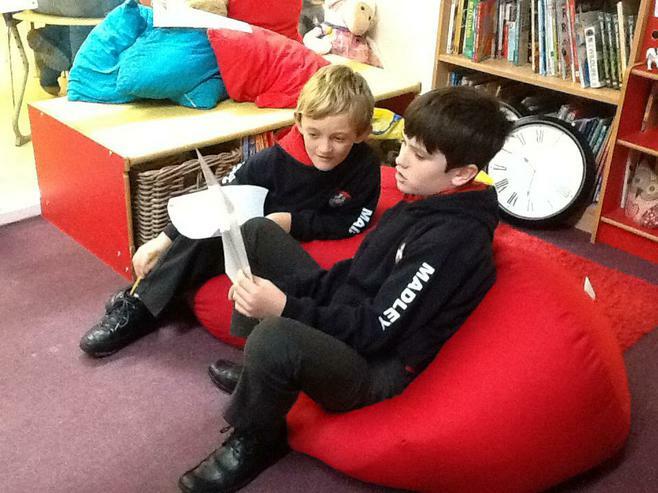 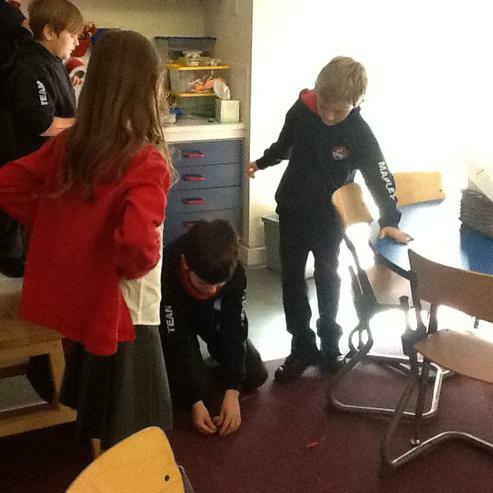 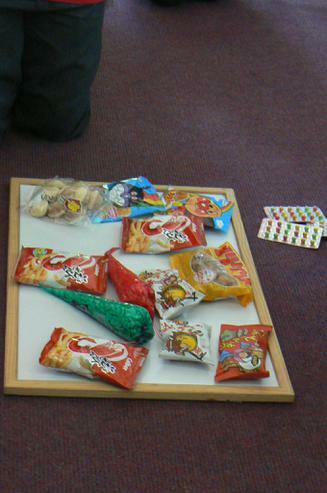 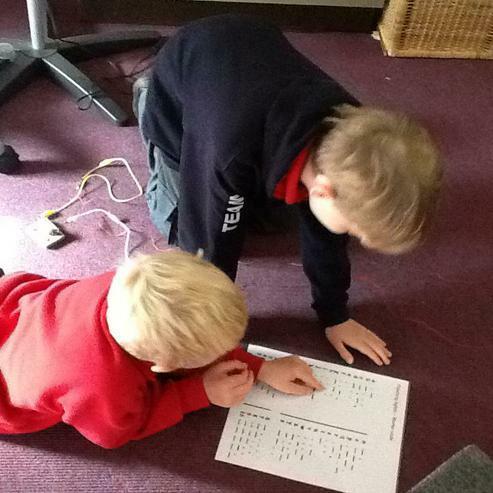 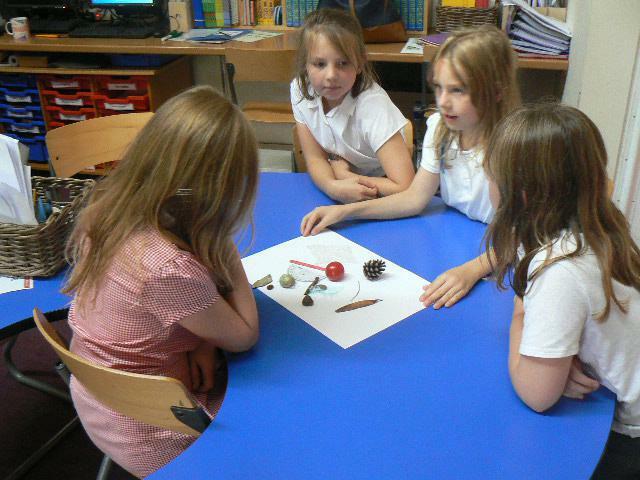 In our Japanese lessons, Class 5 are producing a play based on the Japanese traditional story of Peach Boy (Momotaro). 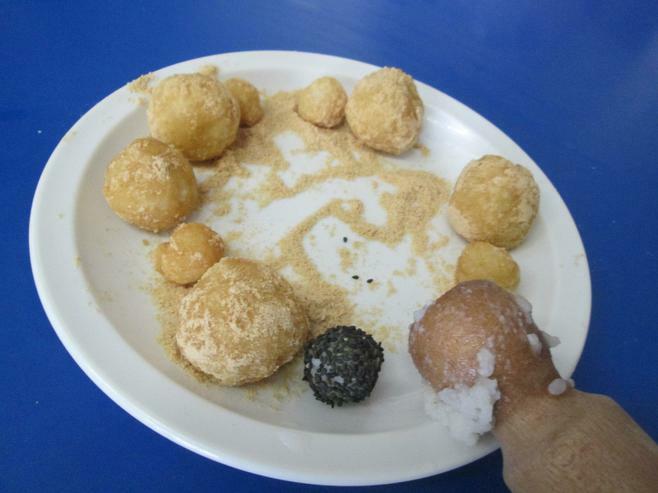 Momotaro takes millet dumplings (kibi-dango) on his journey to Ogre Island. 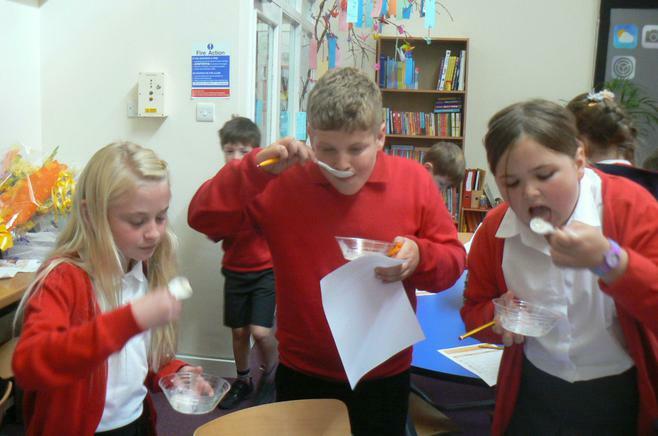 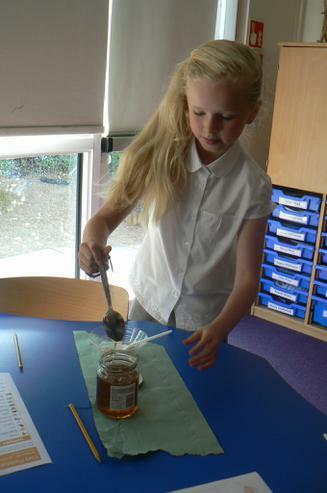 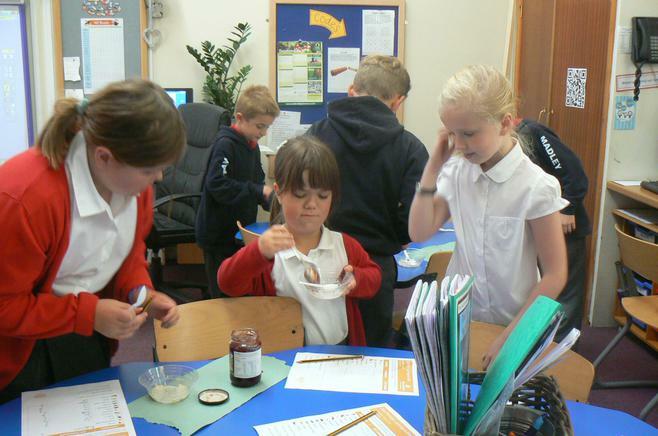 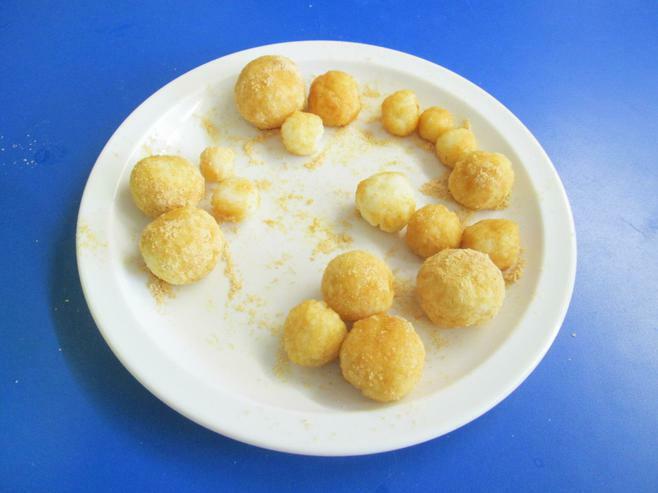 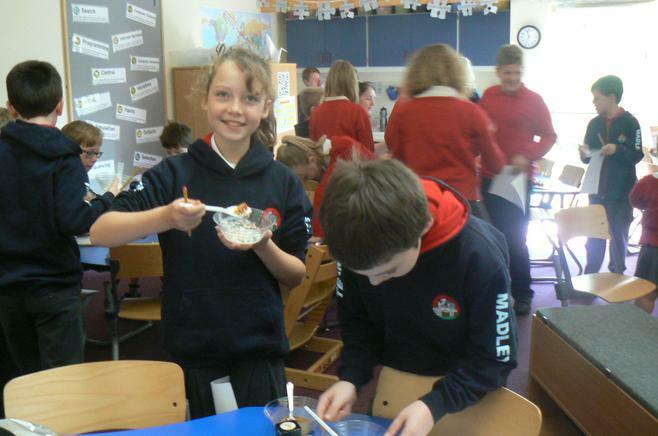 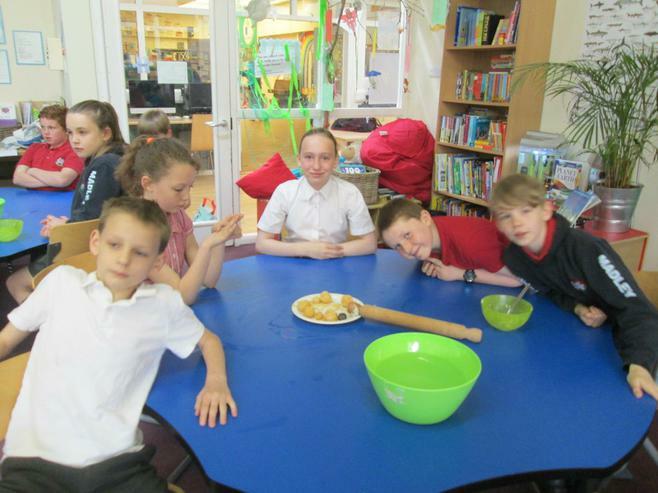 Class 5 were treated this week to a special cookery lesson with Mrs Terry, when we made and ate kibi-dango ourselves! 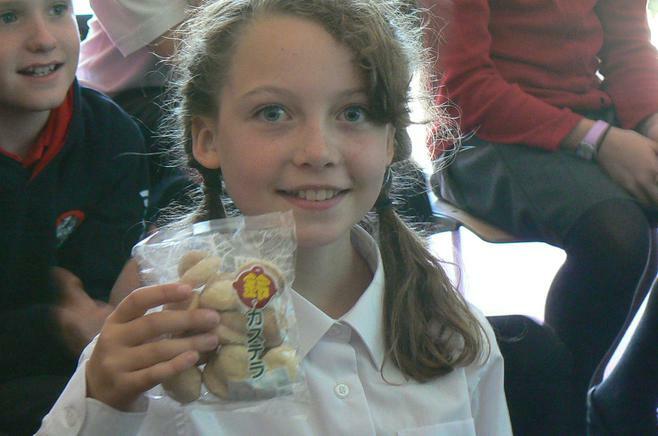 Thank you Mrs Terry (and also your kind father who sent us the special ingredients that we needed from Japan)! 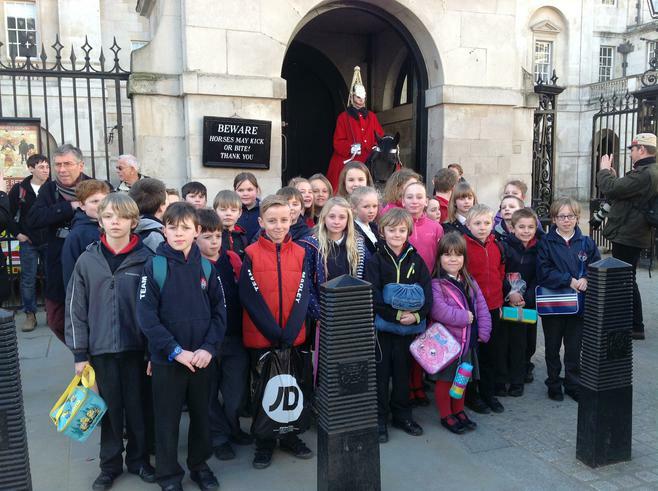 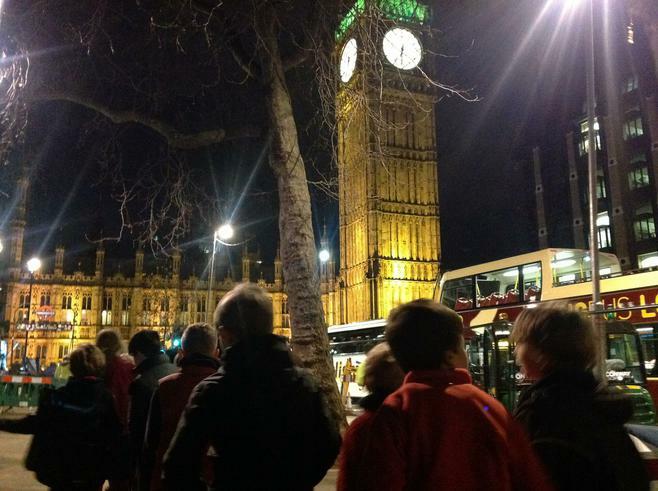 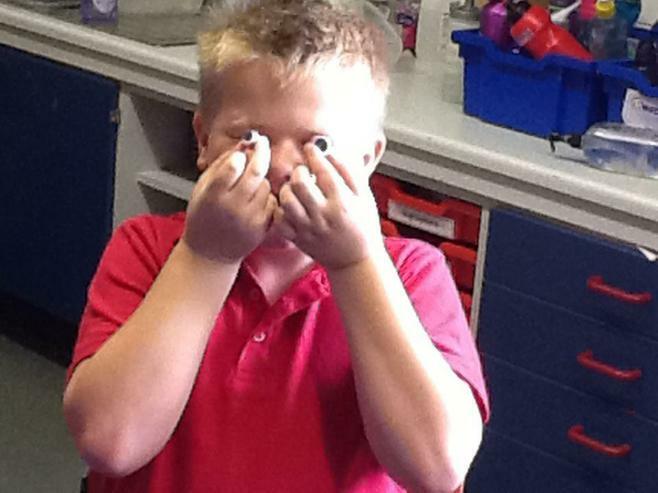 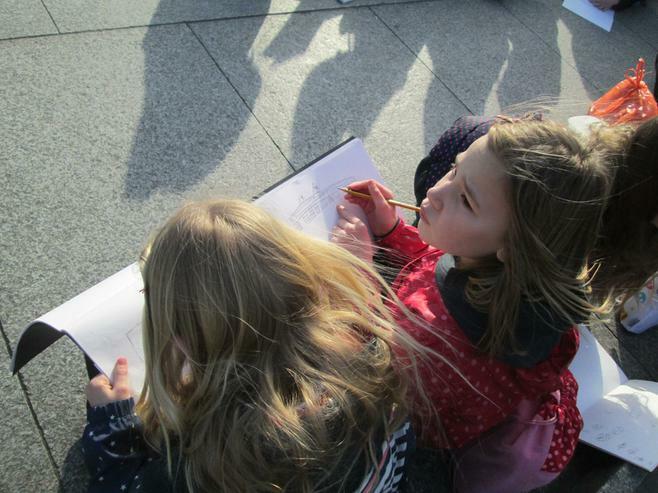 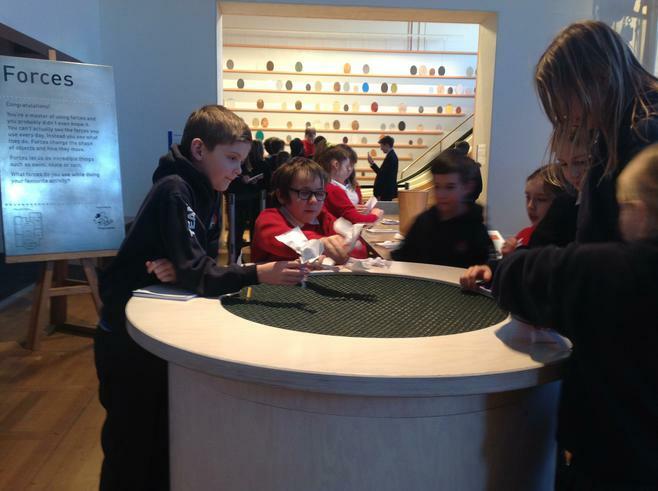 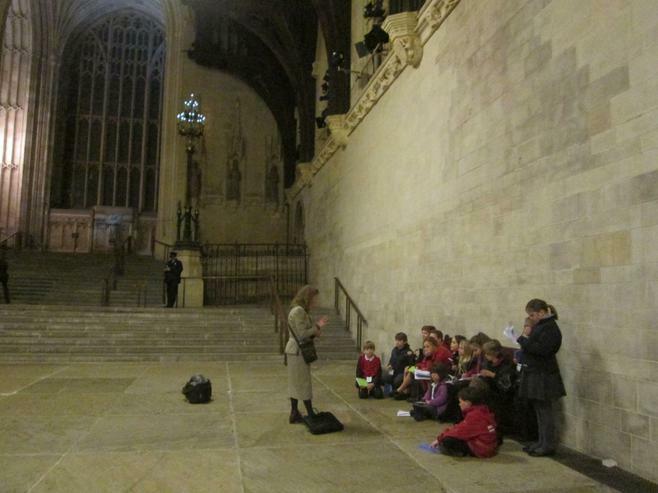 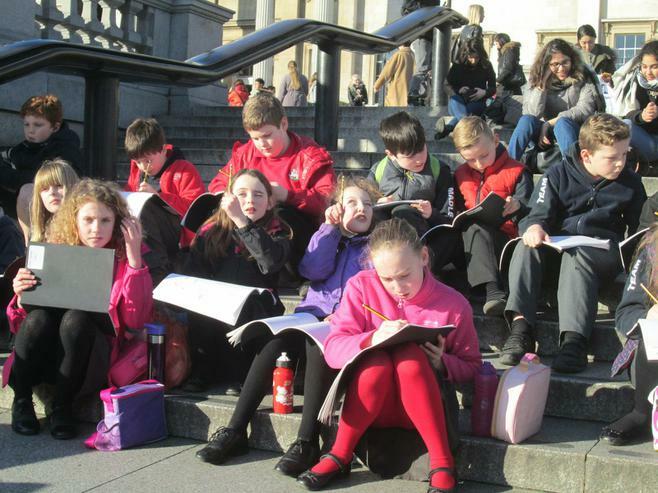 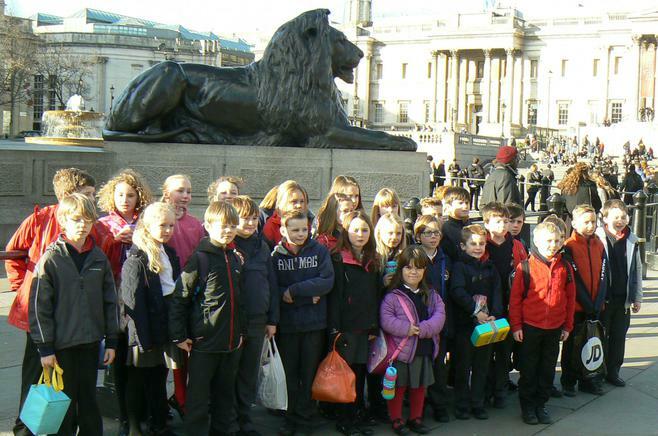 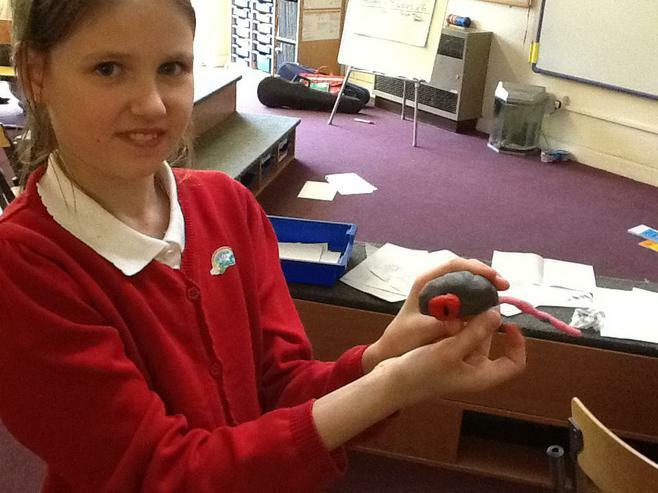 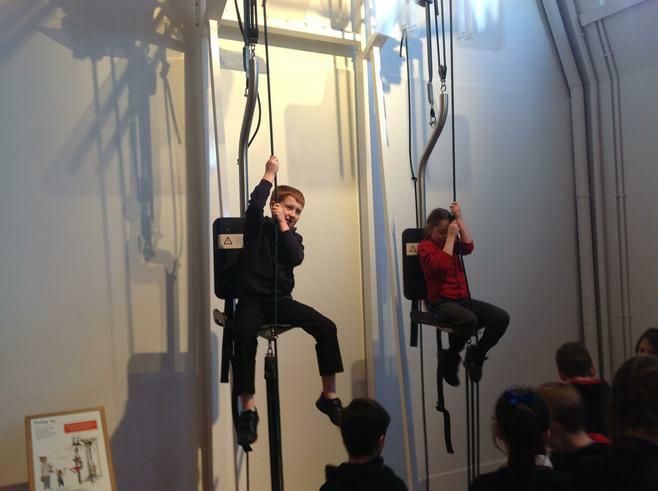 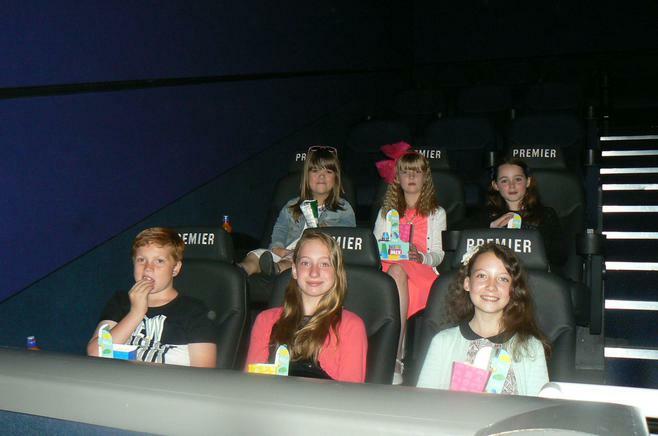 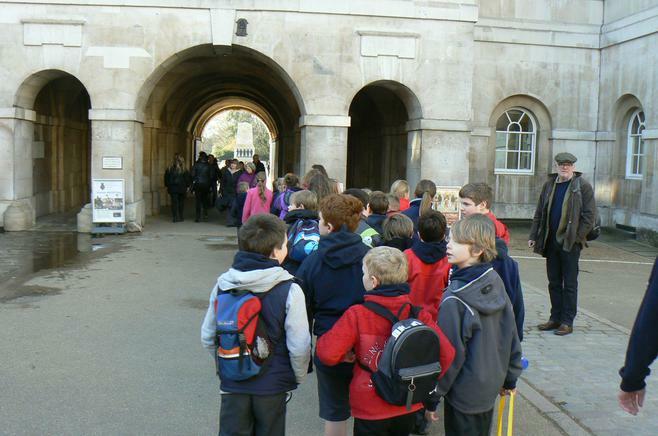 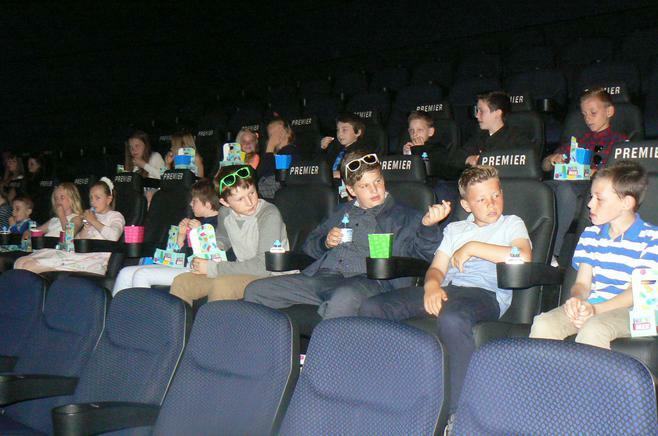 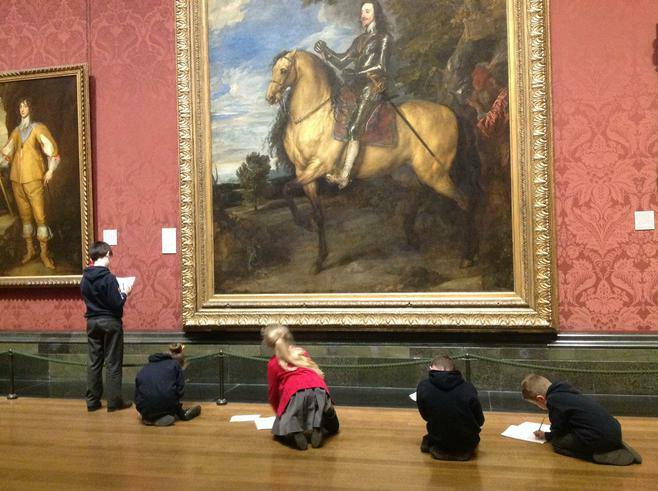 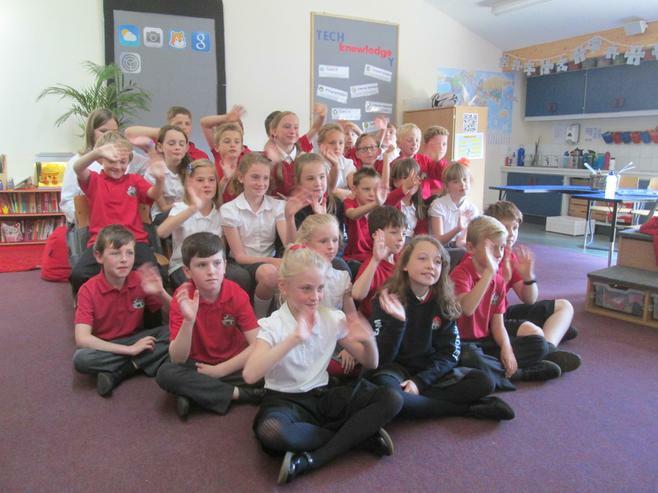 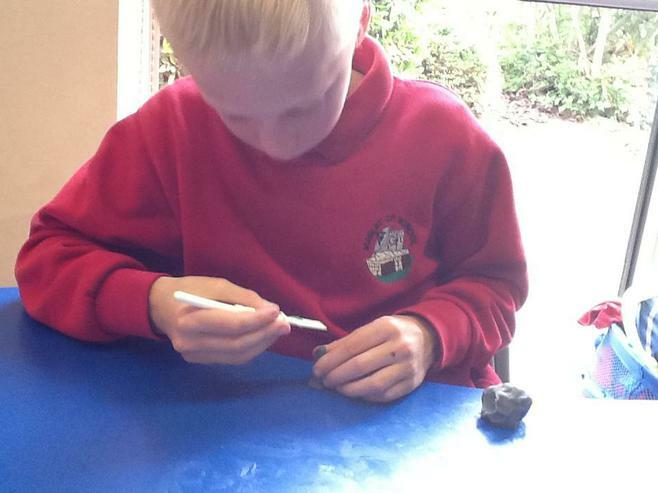 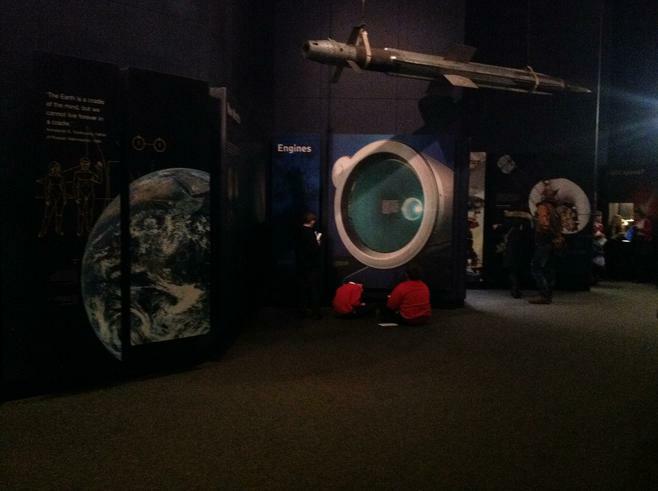 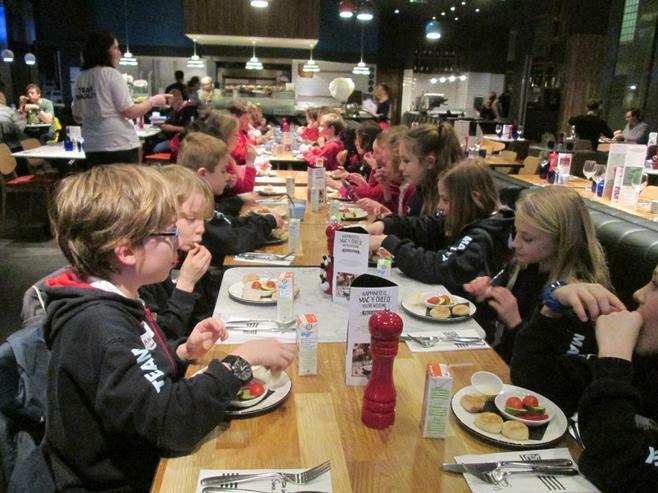 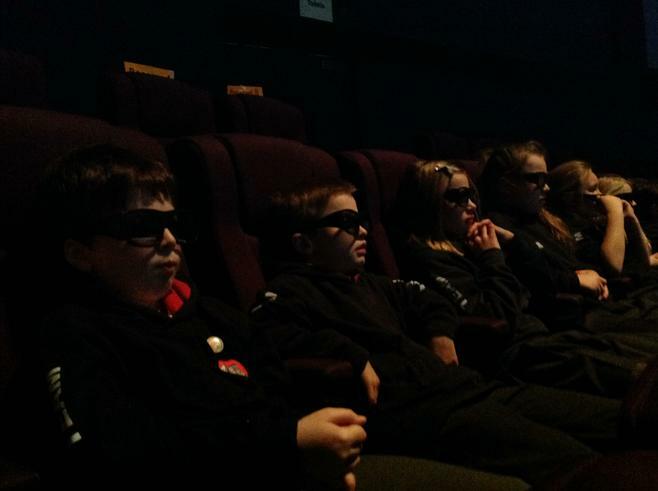 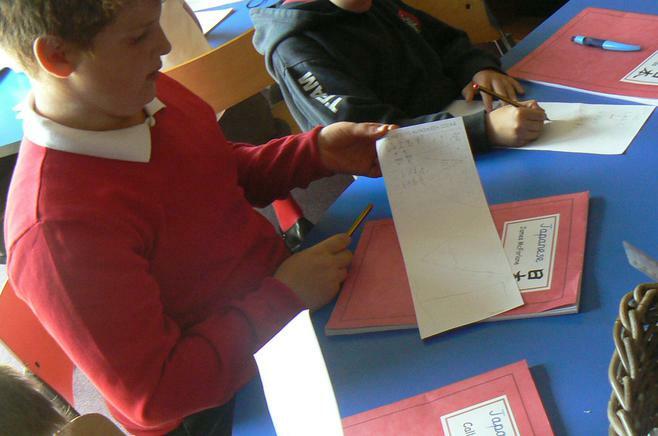 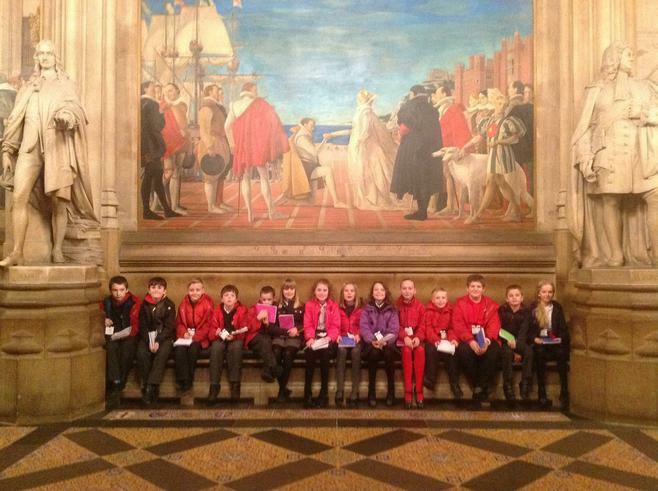 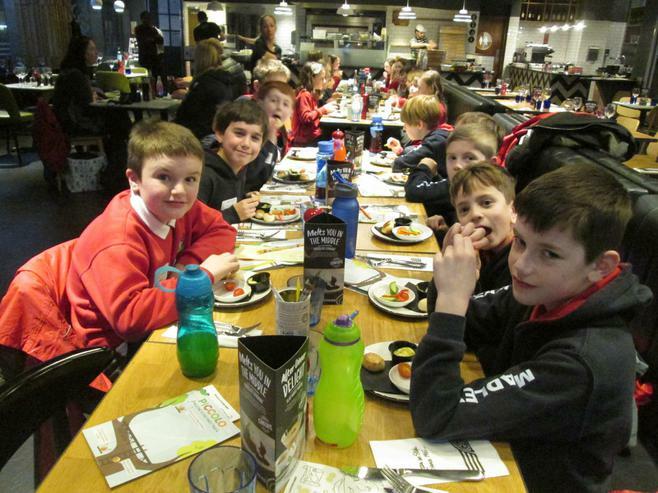 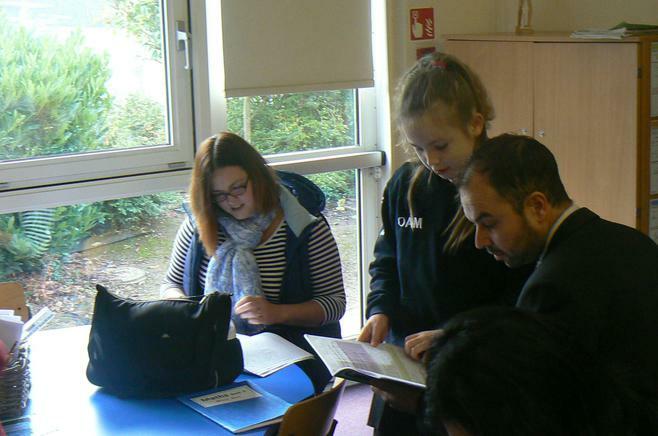 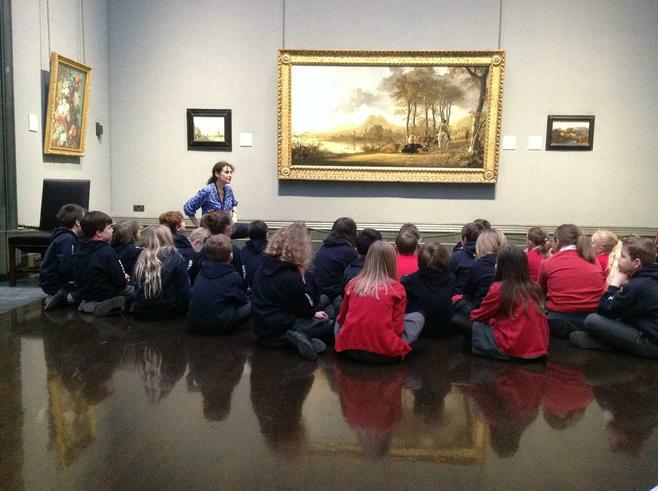 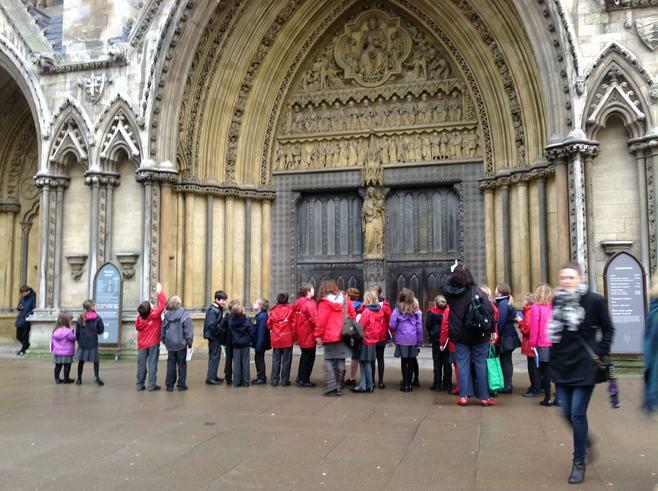 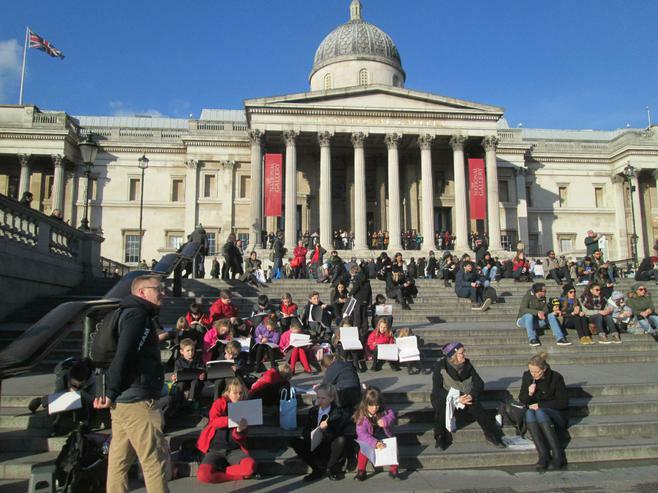 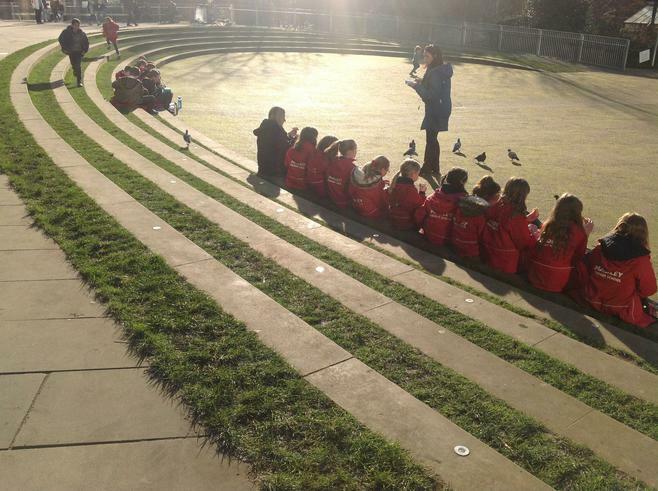 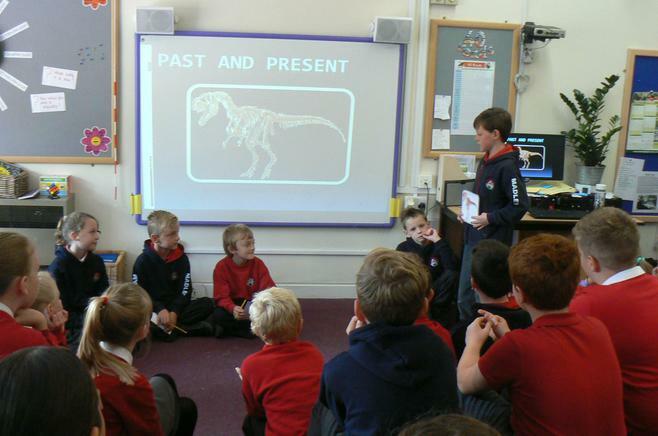 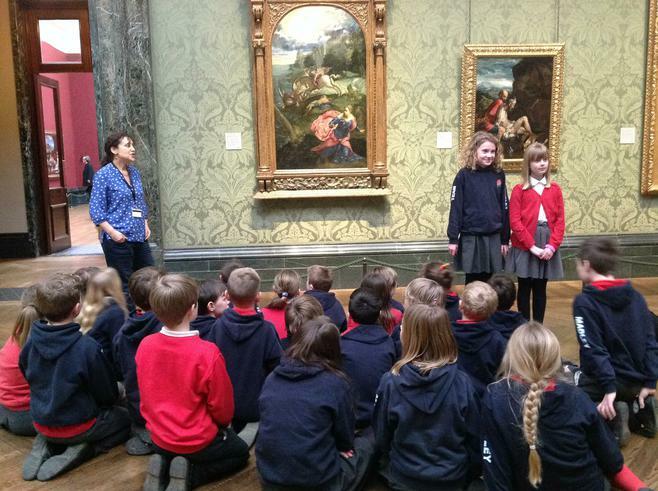 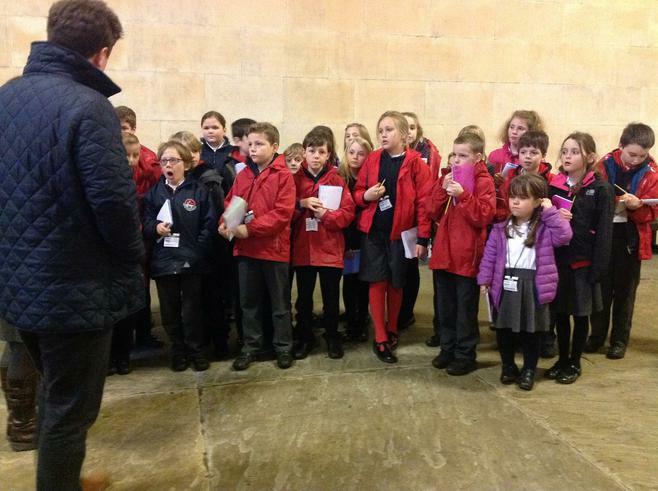 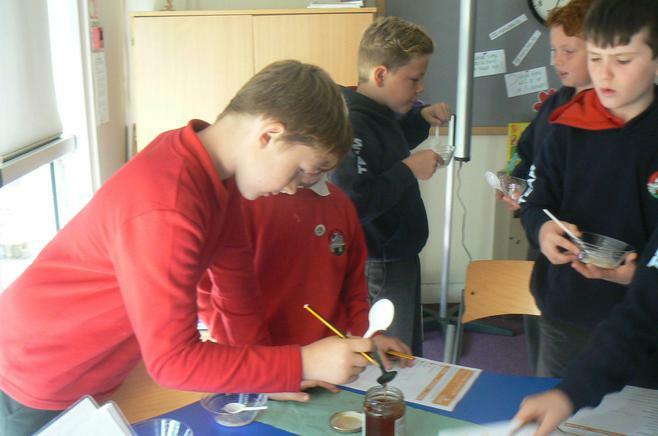 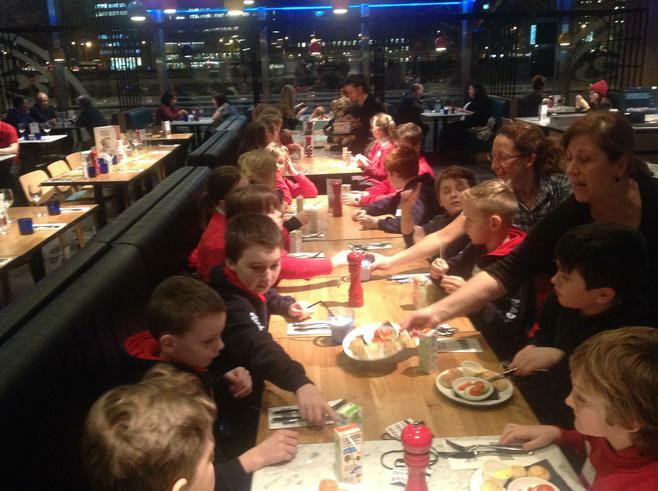 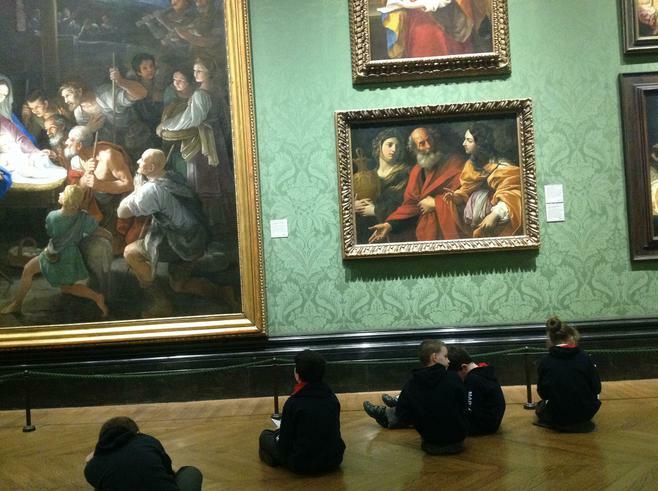 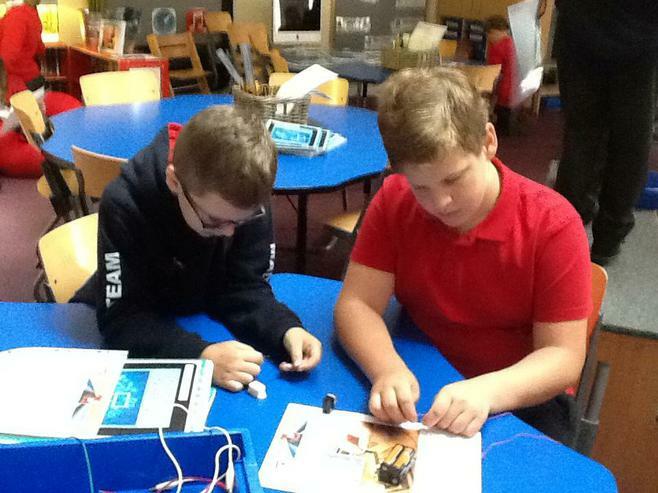 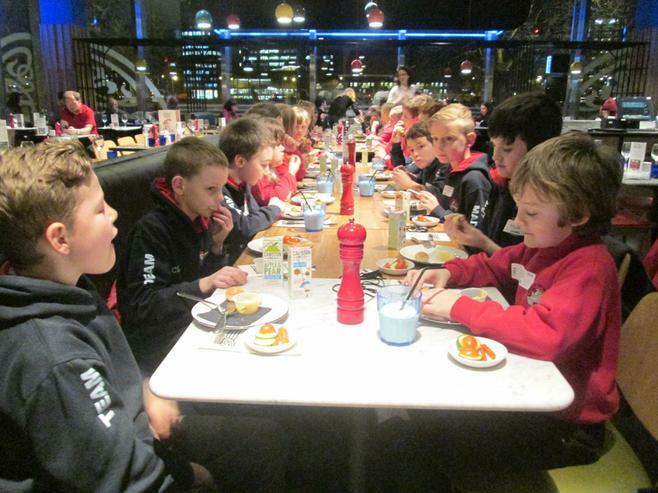 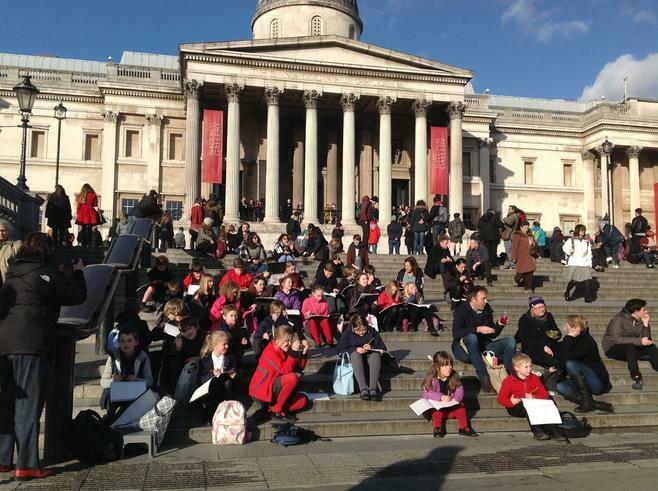 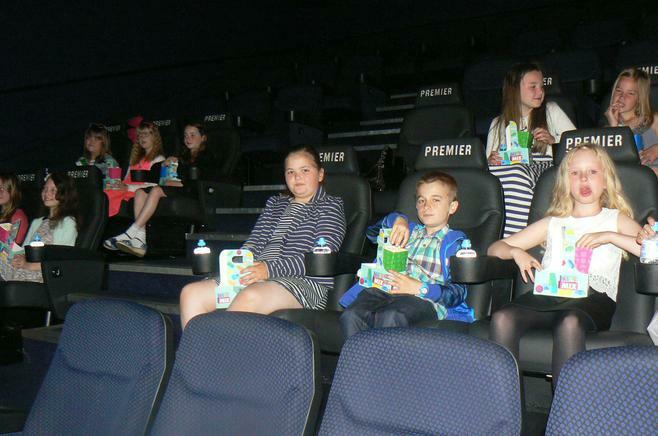 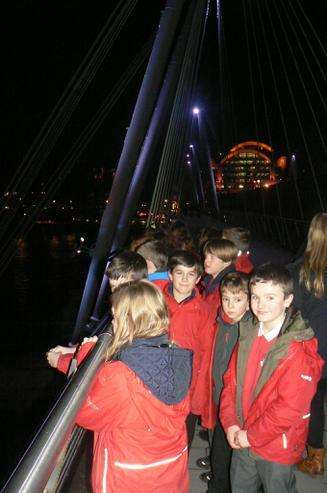 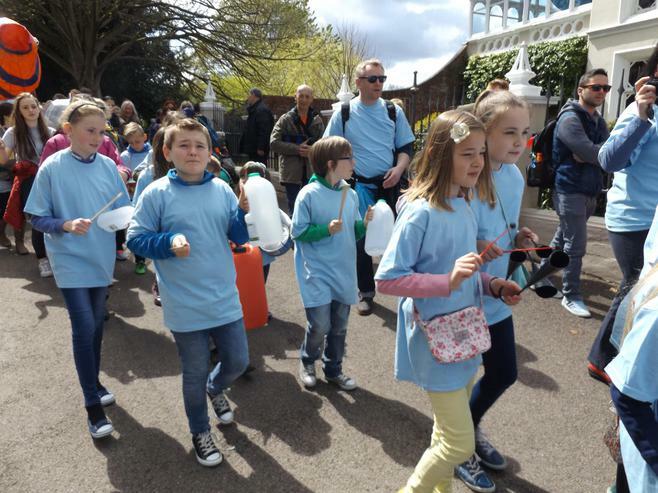 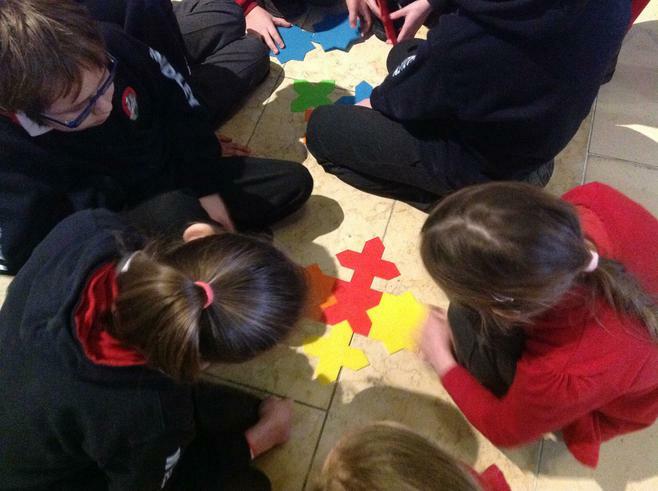 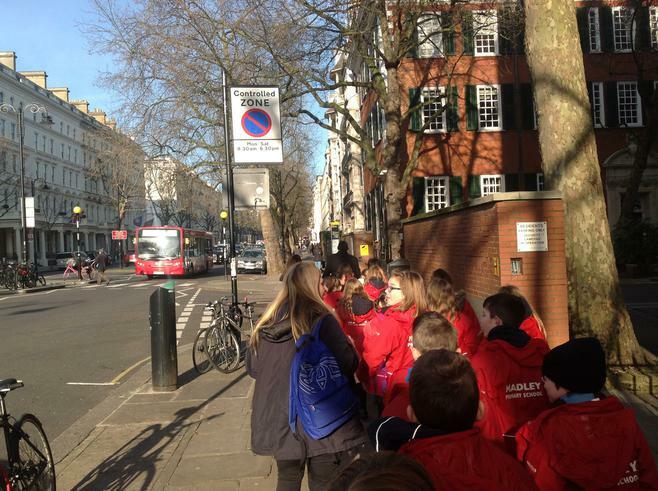 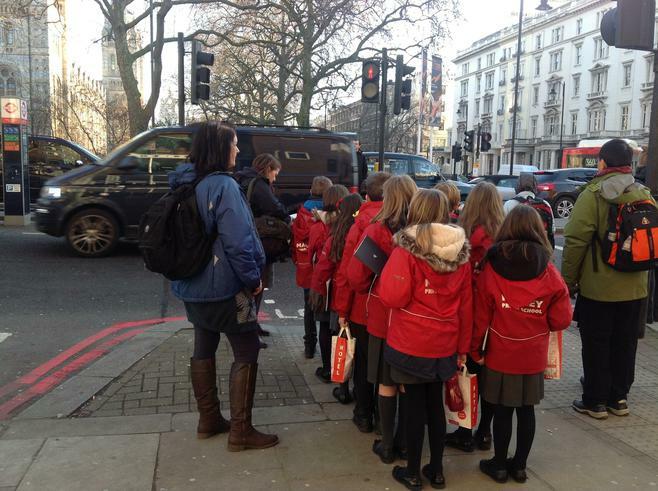 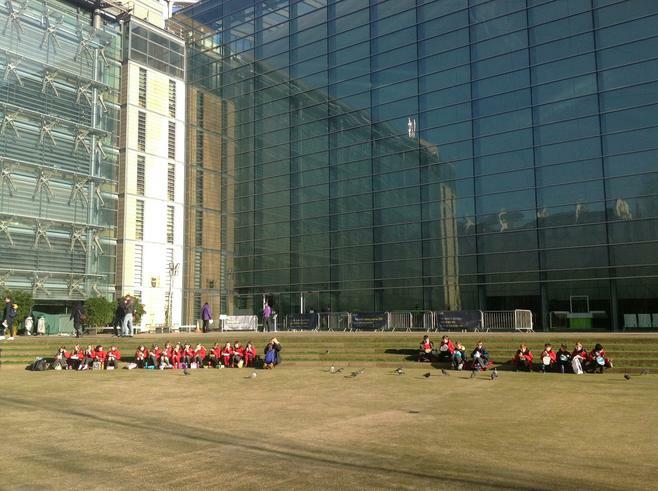 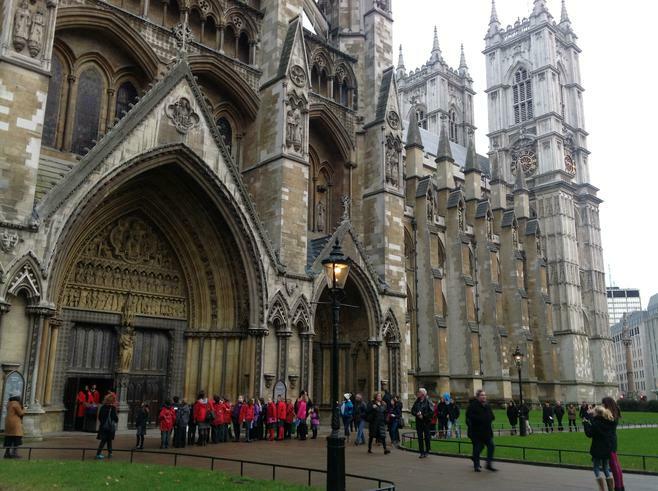 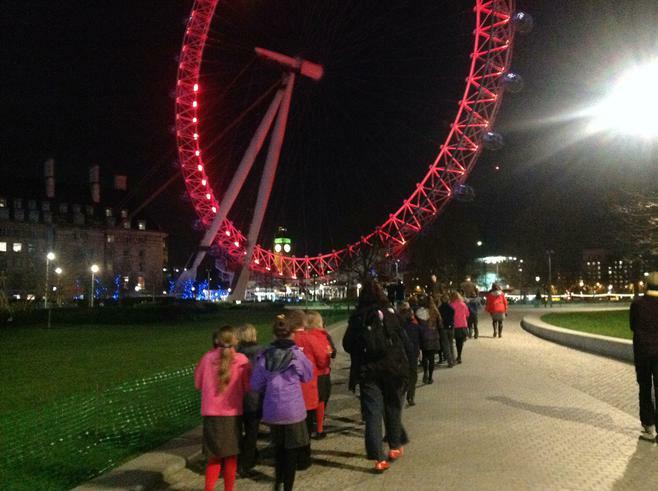 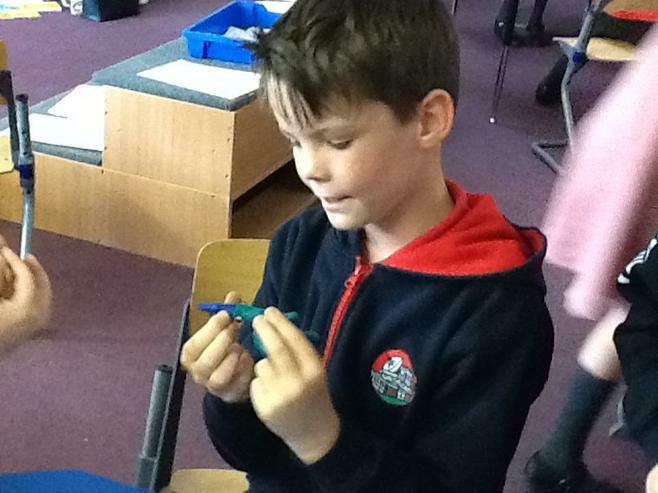 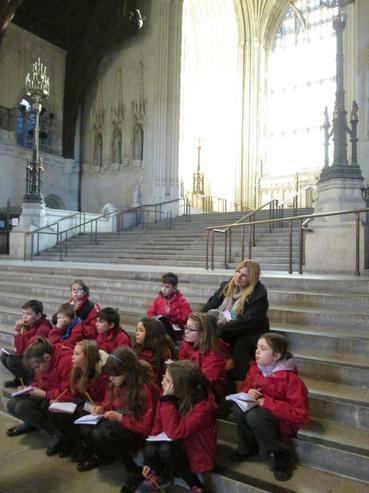 Class 5 Curriculum Visit to London - more pictures! 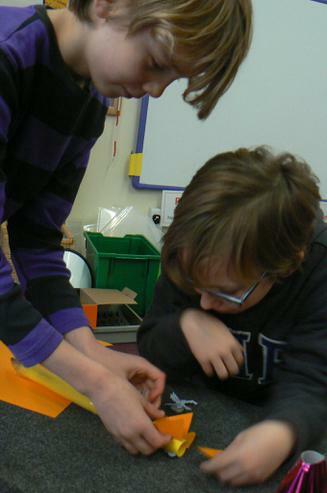 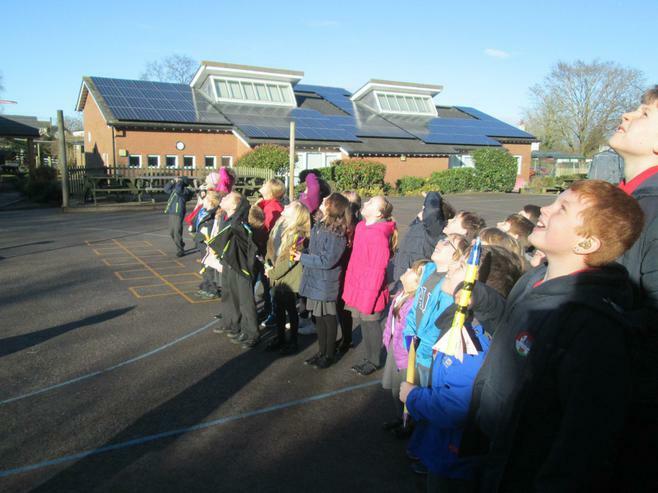 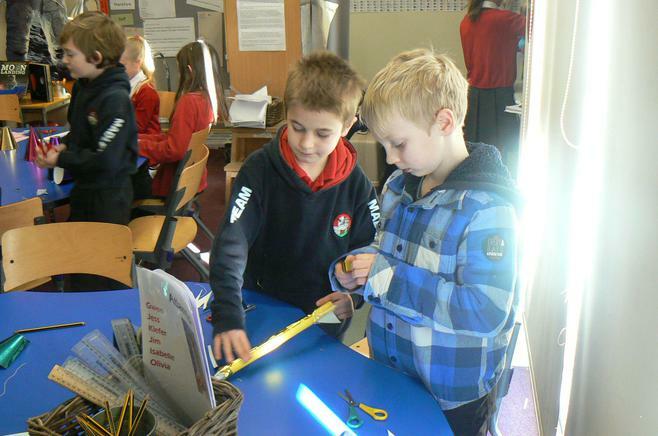 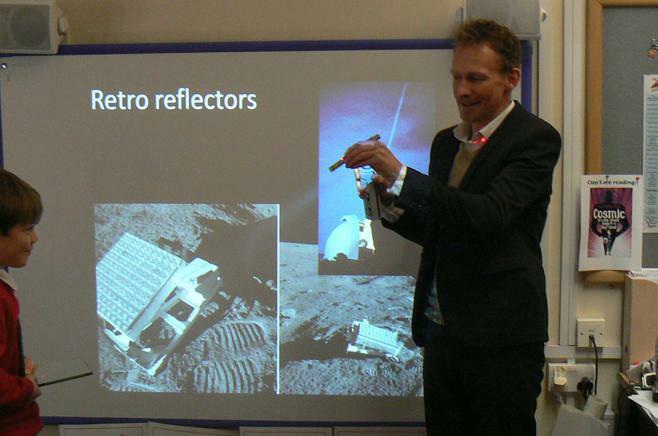 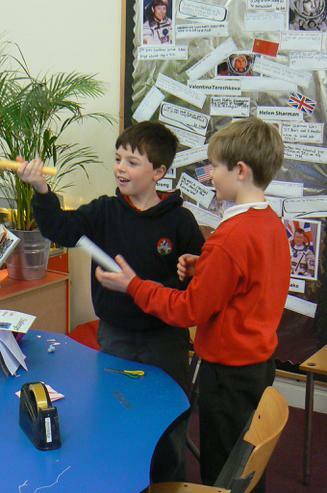 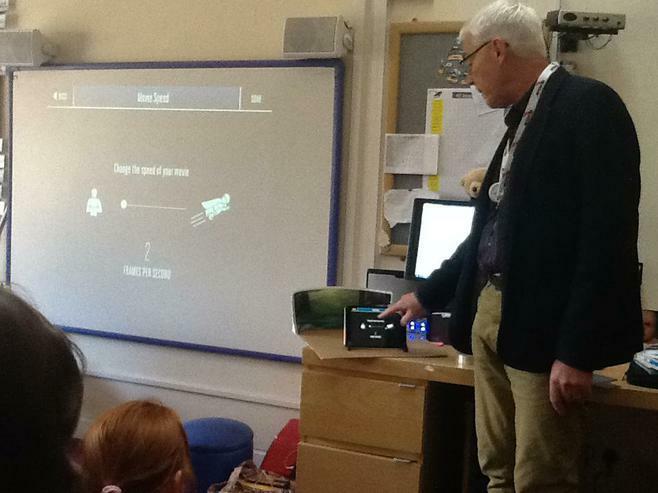 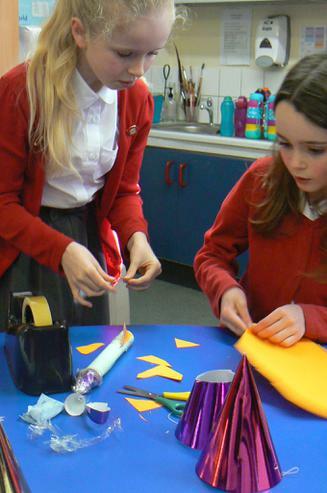 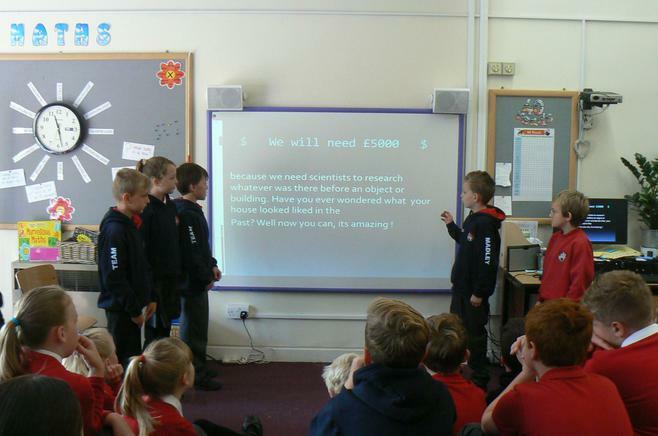 On Friday 15th January, Class 5 welcomed Dr Rhodes from Hereford Cathedral School Physics Department for a morning about space and rocket design. 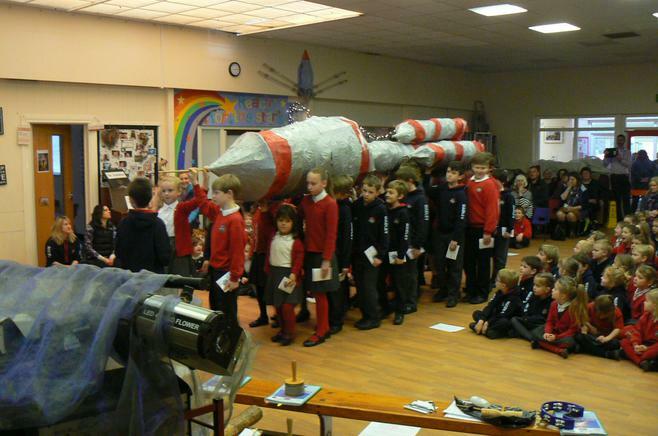 We spent the first part of the morning learning an astronomical amount of facts and useful information about space, which answered many of the children's questions about gravity, life in space and some other ones too - like how to prove that the first moonwalk was not a hoax... We also discussed crafty rocket design, looking at Tim Peake's transport (the Soyuz rocket) and others for inspiration. 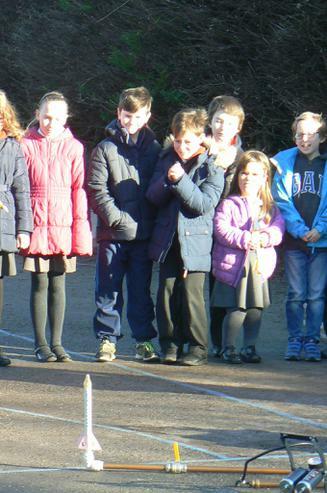 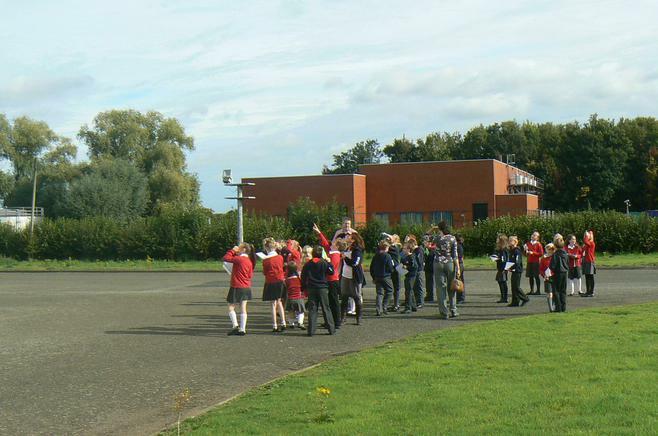 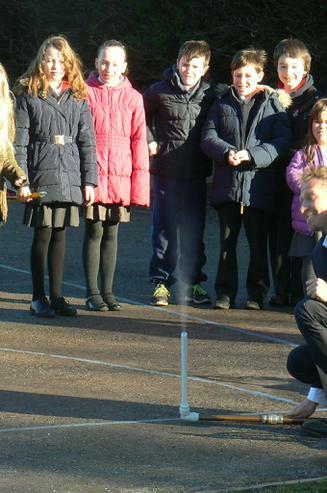 After break, the children designed their own rockets then got to launch them outside in the playground with Dr Rhodes' high pressure launcher, which was most exciting! 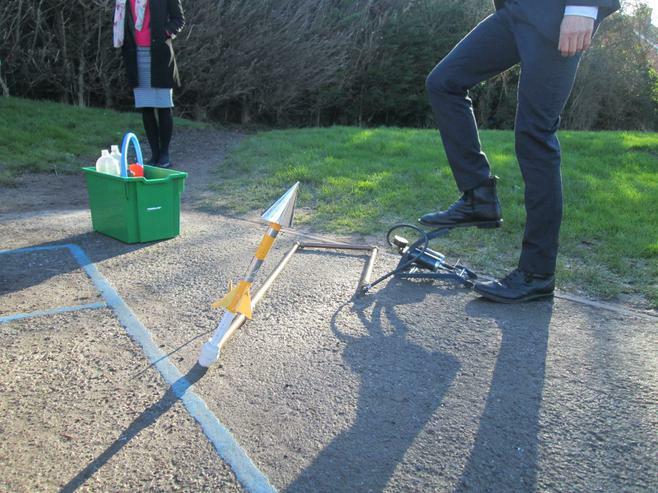 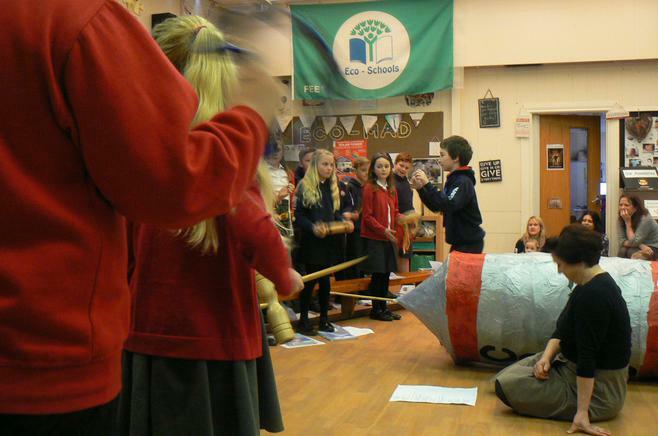 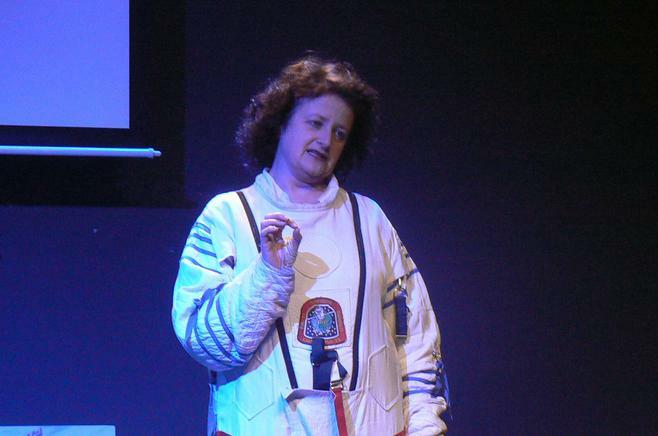 The dramatic finale was when Dr Rhodes launched a water pressure rocket (a large drinks bottle) which disappeared over the hedge! 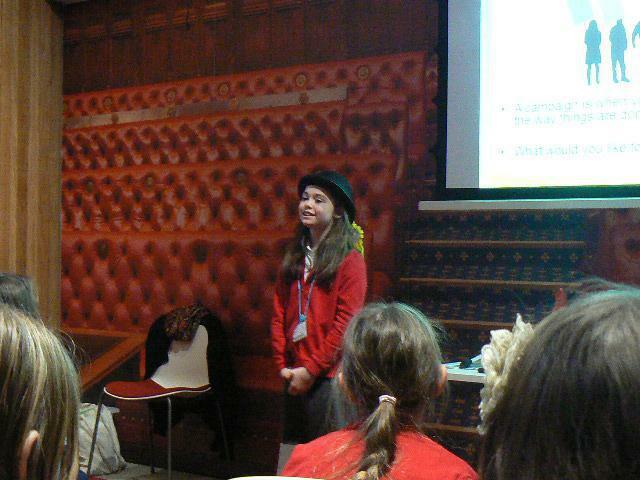 What an absolutely fantastic morning - we learned so much and had so much fun. 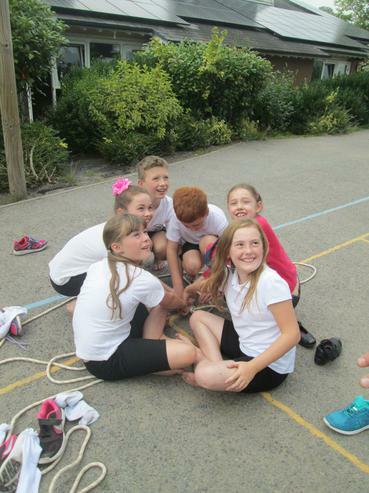 The winning team! 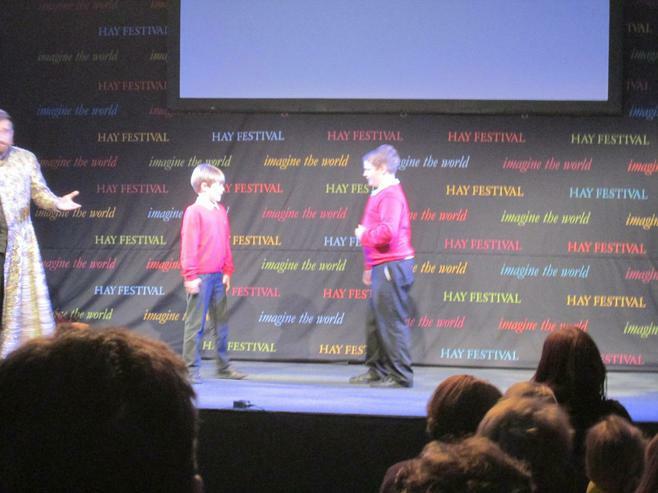 Well done, Ben and Barnaby! 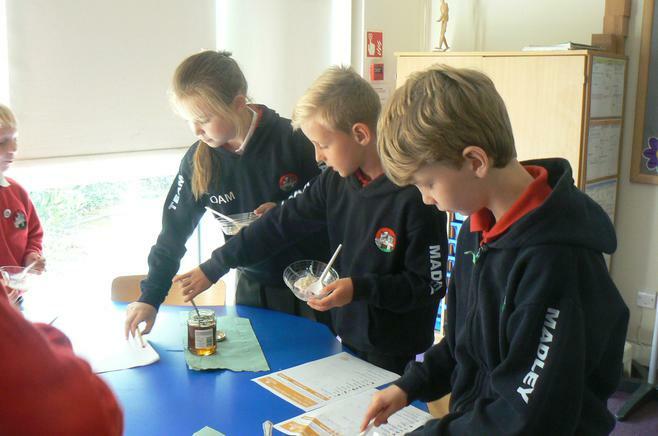 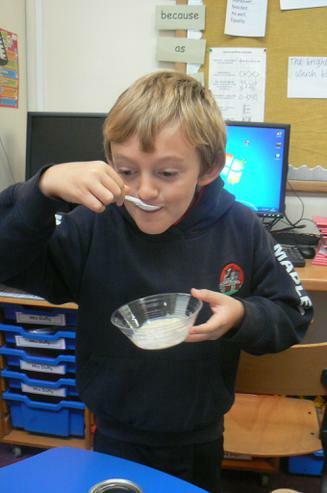 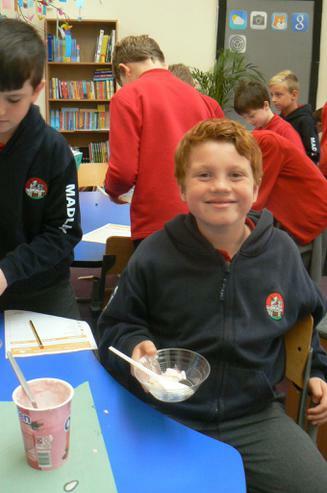 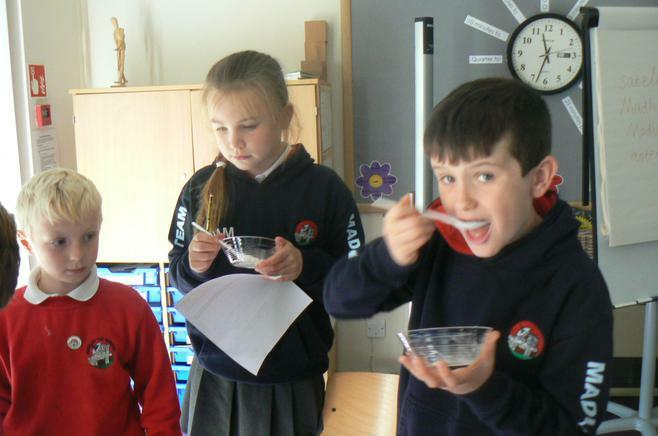 Tesco Eat Happy Oaty Porridge Click here to see Class 5 participating in an online field trip about oats and porridge!